Upon moving to SF, the home jersey stays as is. 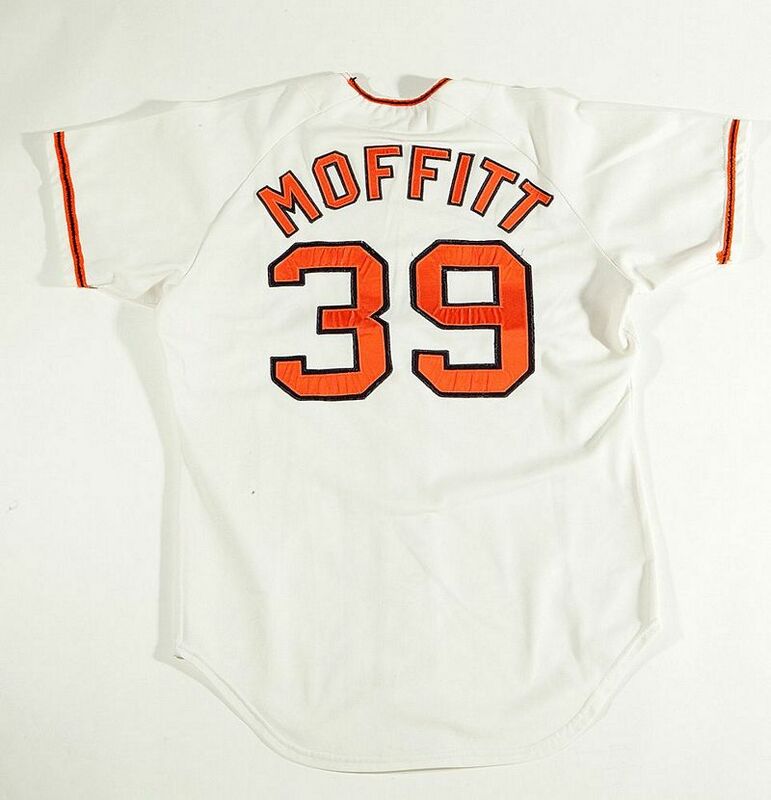 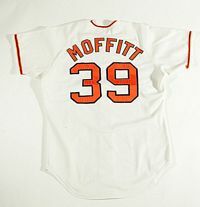 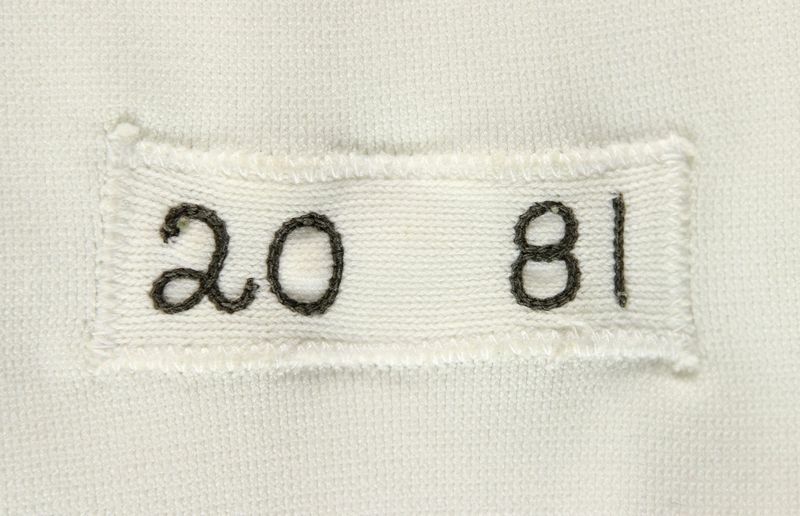 Aside from the new city name, the lettering font on the road jersey also changes. 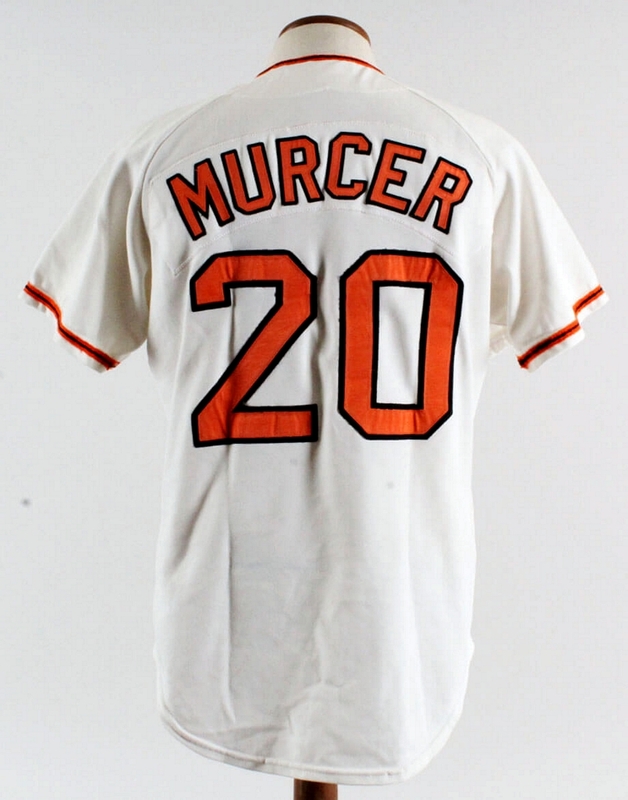 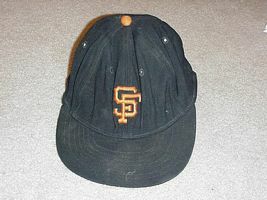 This one was re-crested for minor league use. 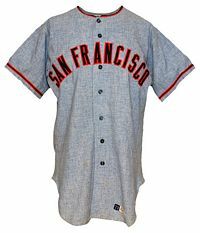 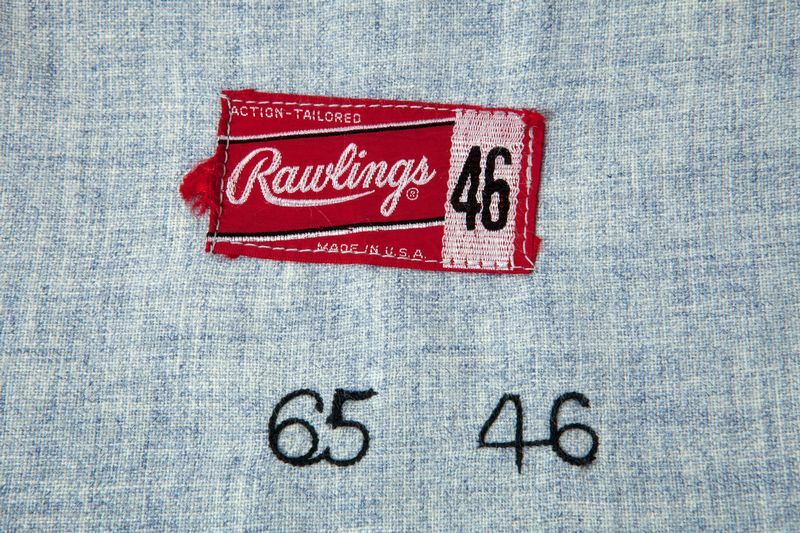 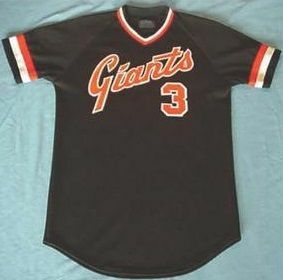 The Giants debut double knits. 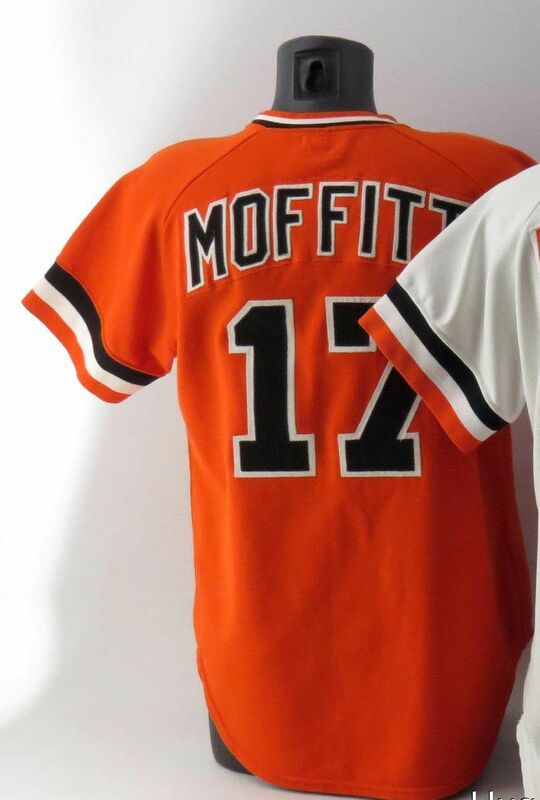 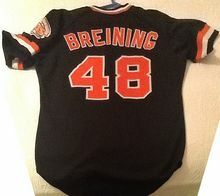 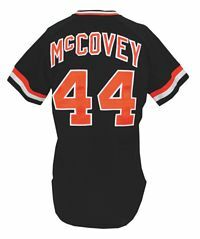 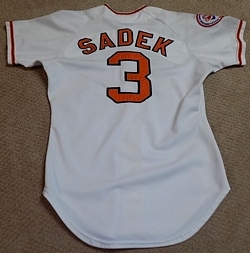 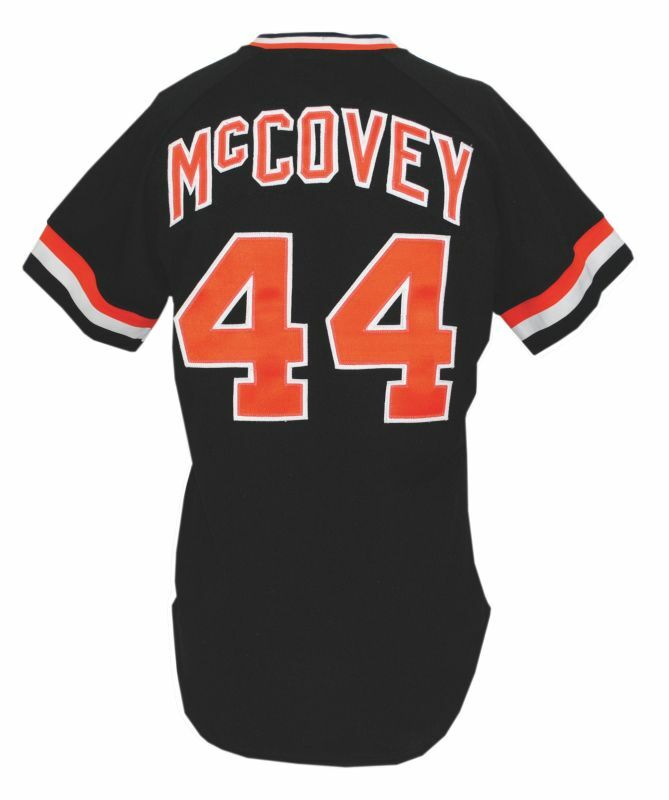 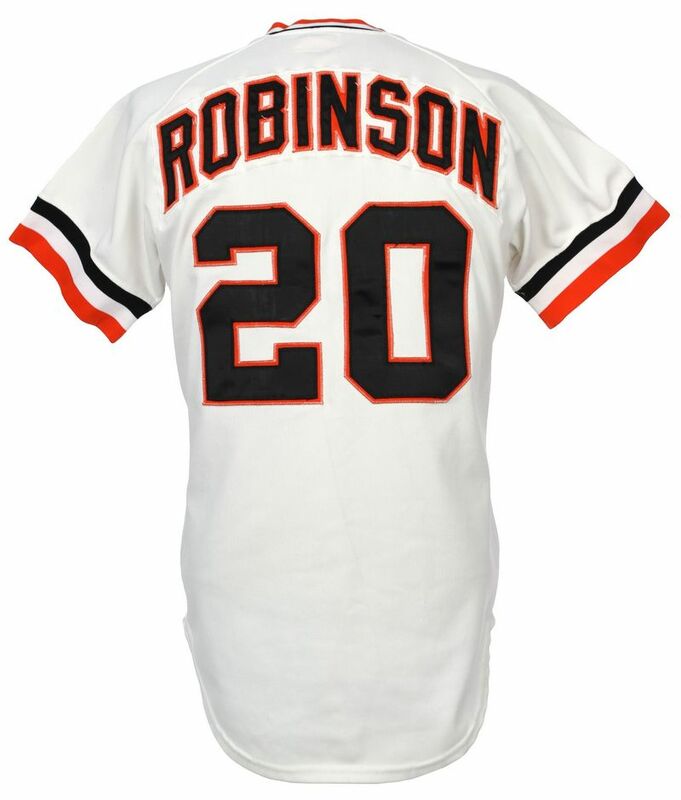 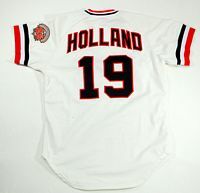 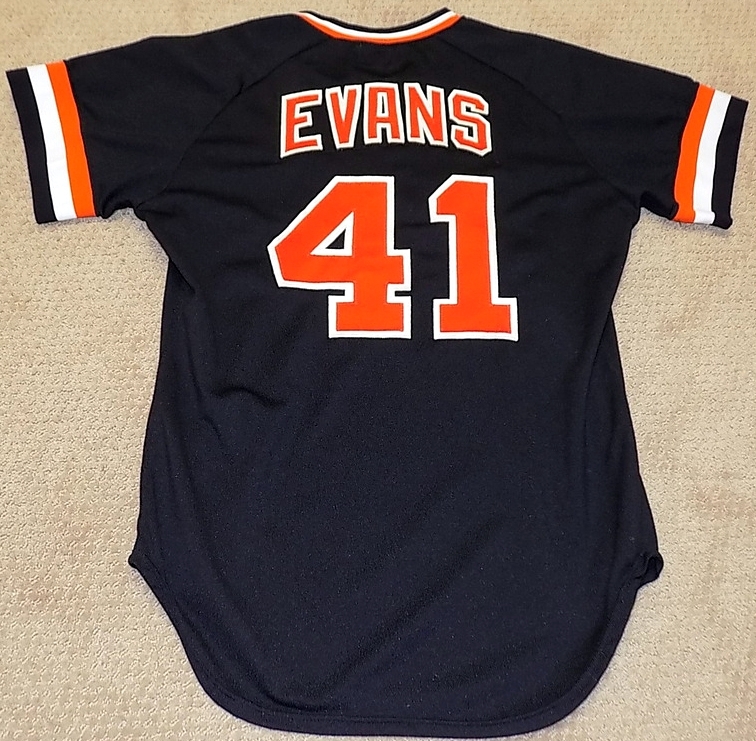 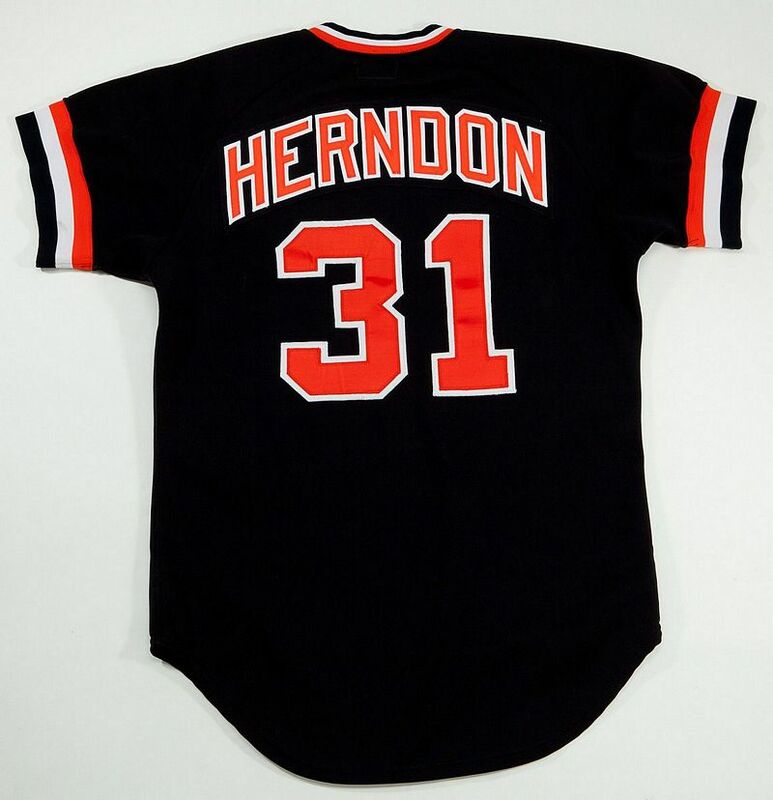 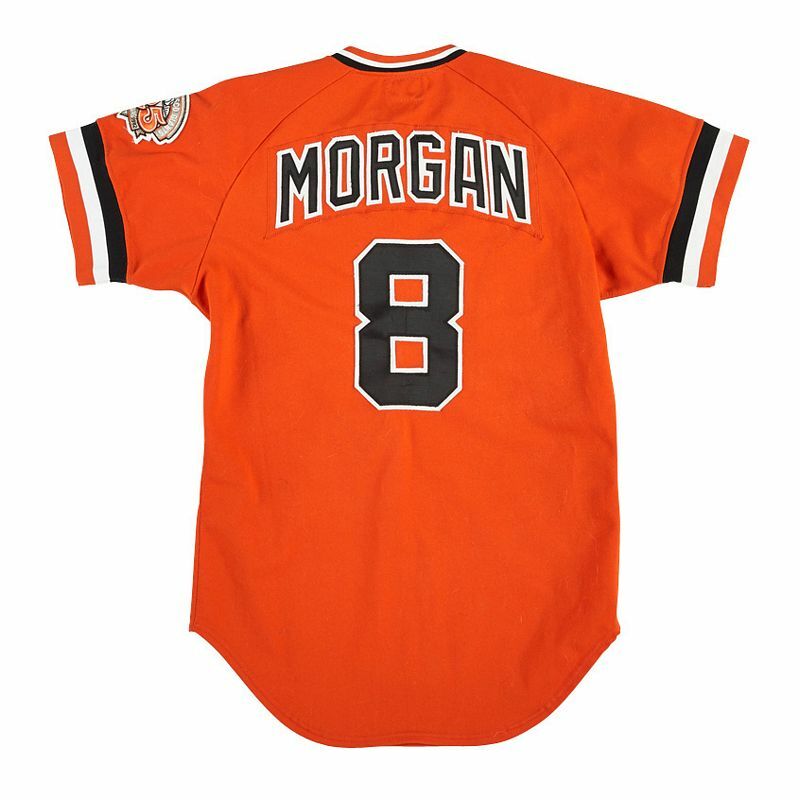 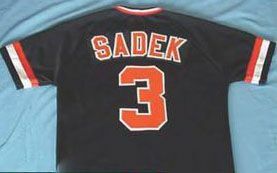 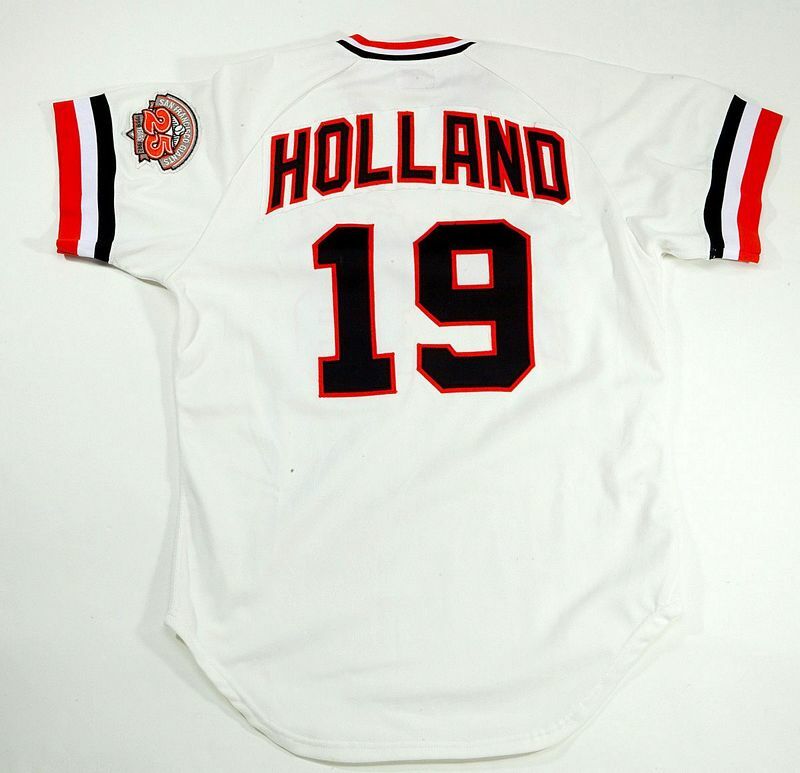 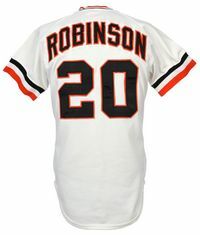 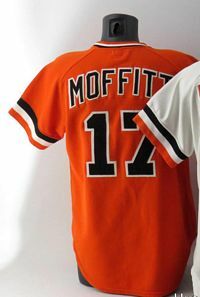 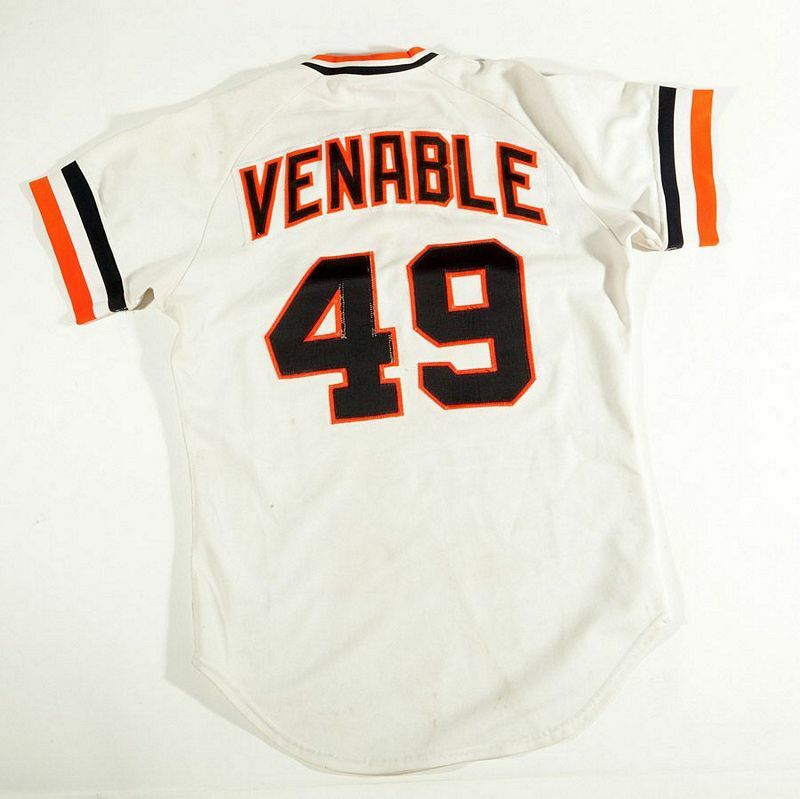 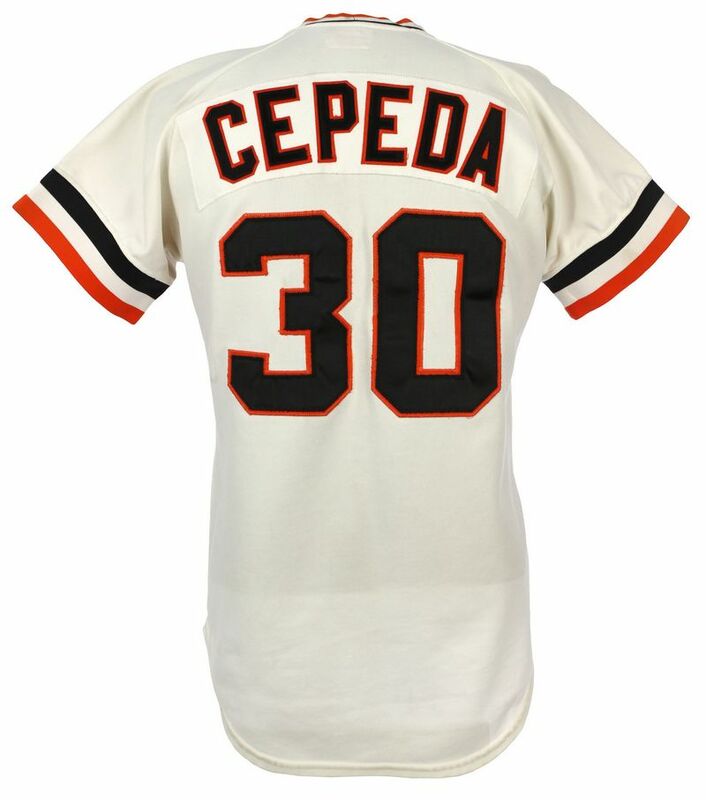 Lettering flips from black with orange trim to orange with black trim, and NOB are added. 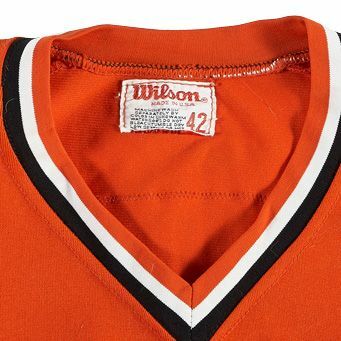 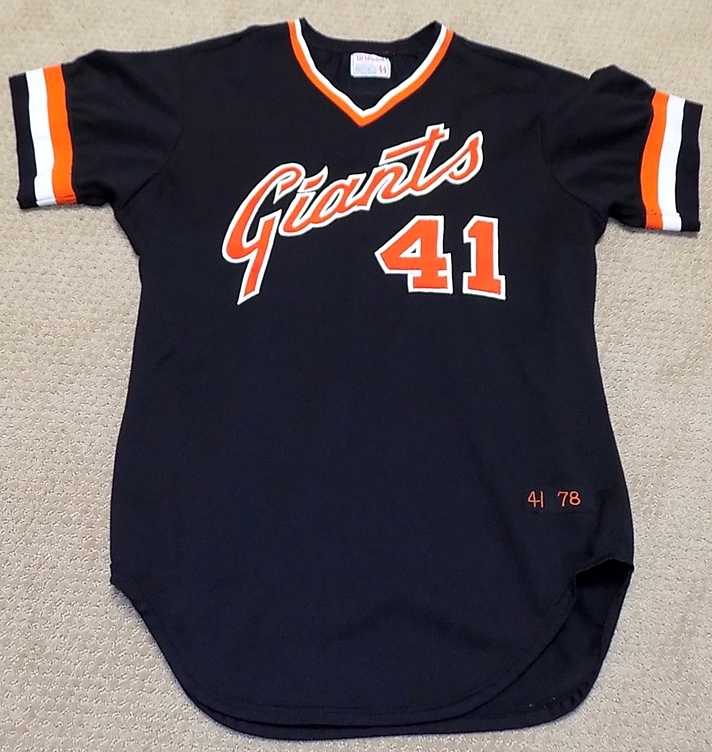 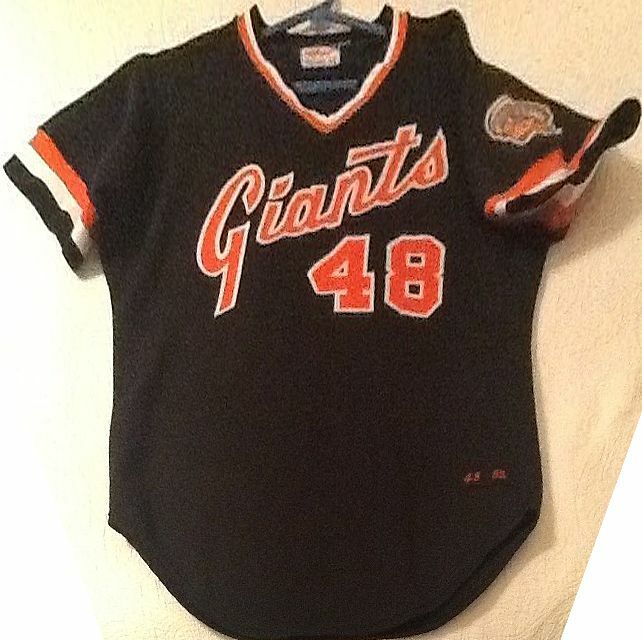 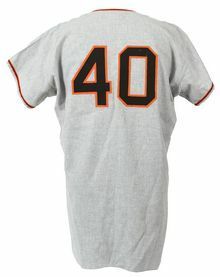 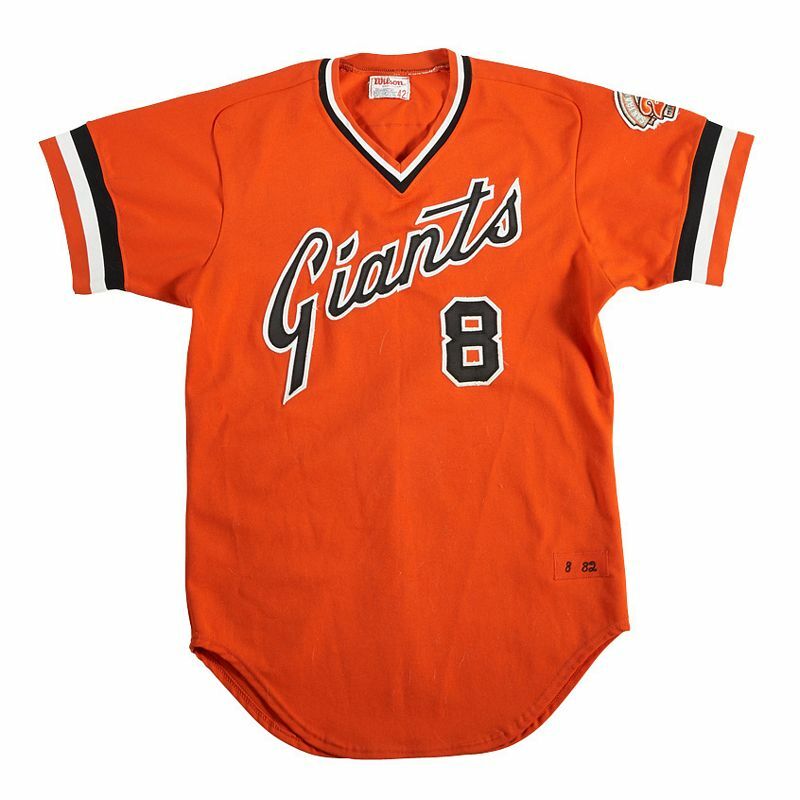 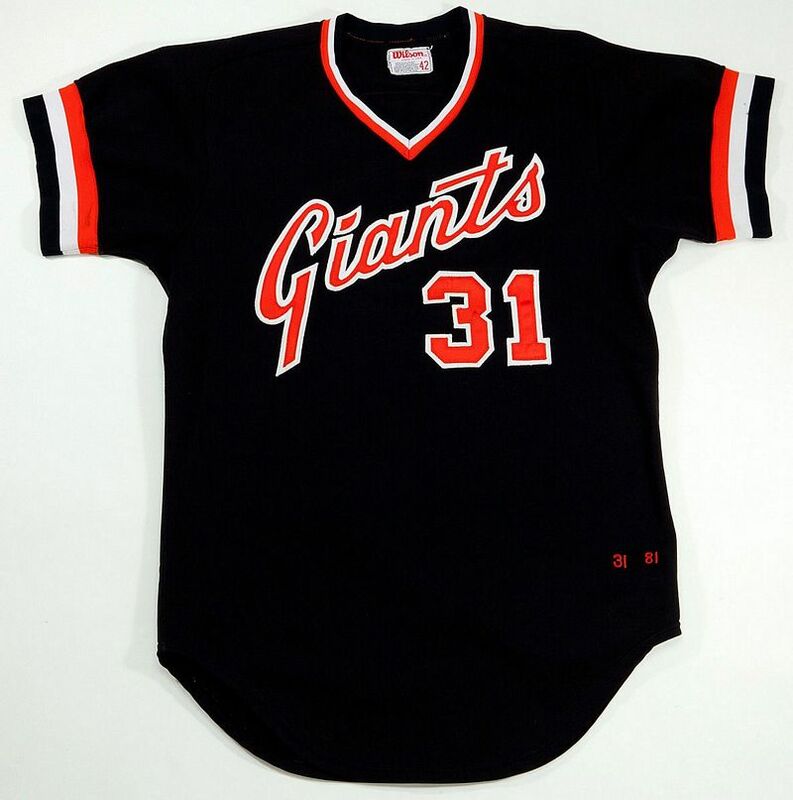 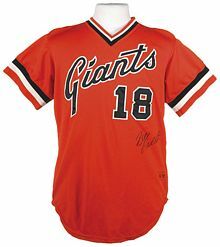 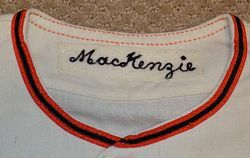 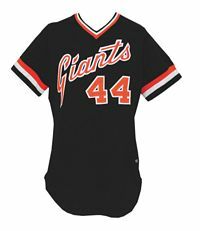 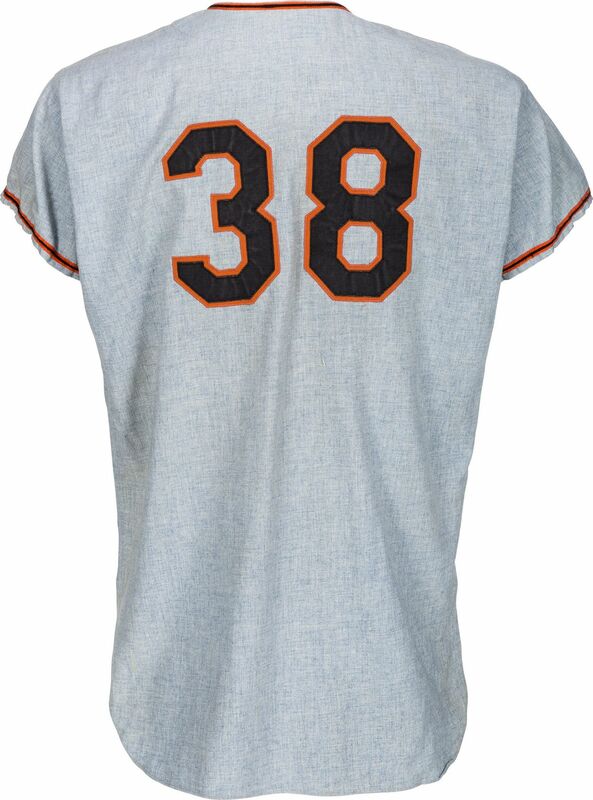 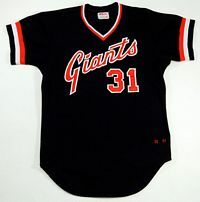 The Giants go for the colorful pullover style. 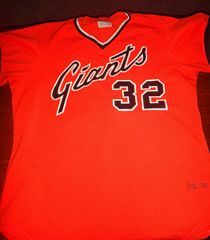 Road jersey turns orange. 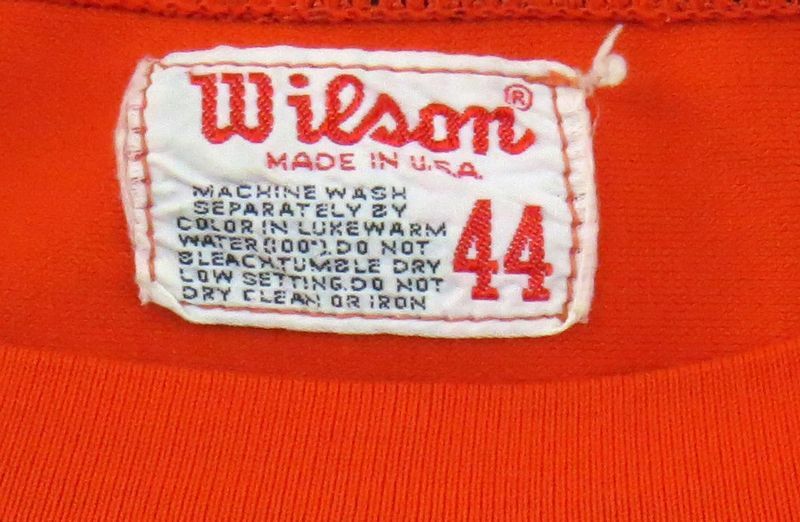 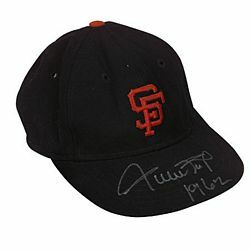 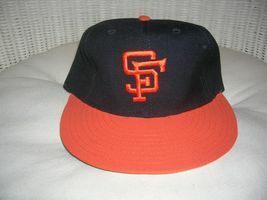 Cap visor turns orange & logo becomes wider with exaggerated points. 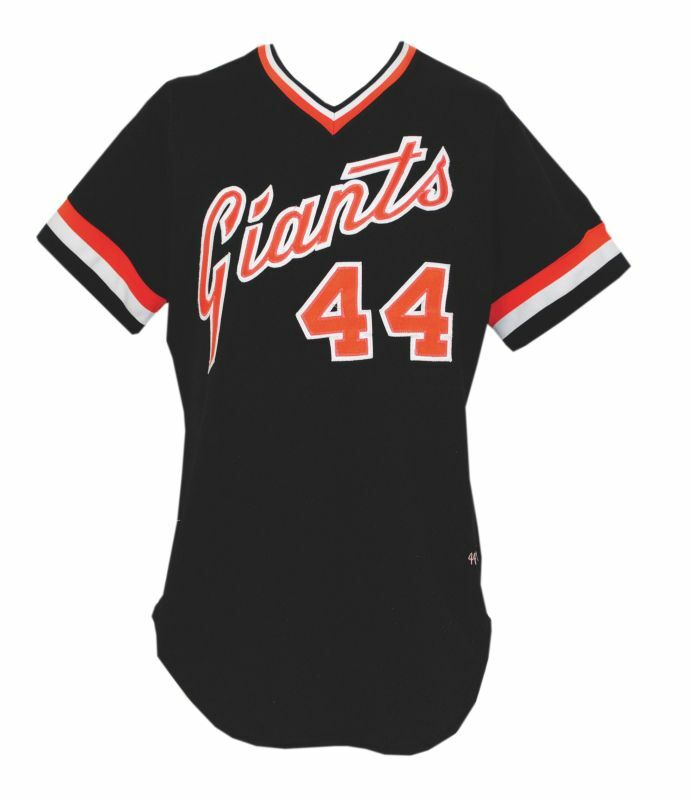 Black alternate debuts. 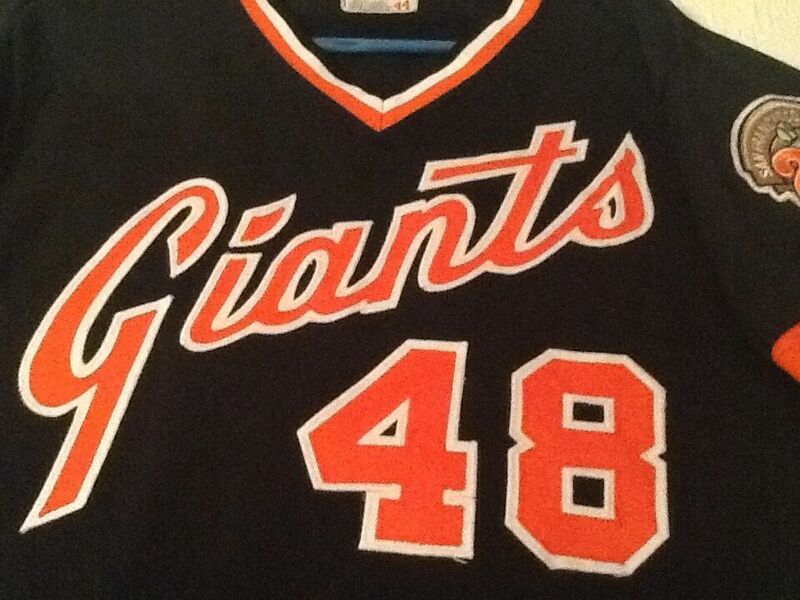 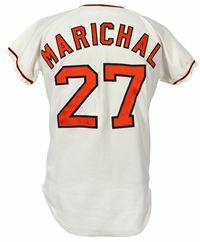 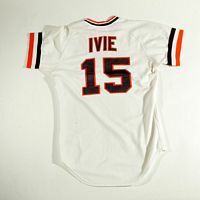 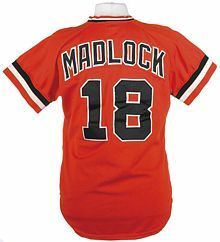 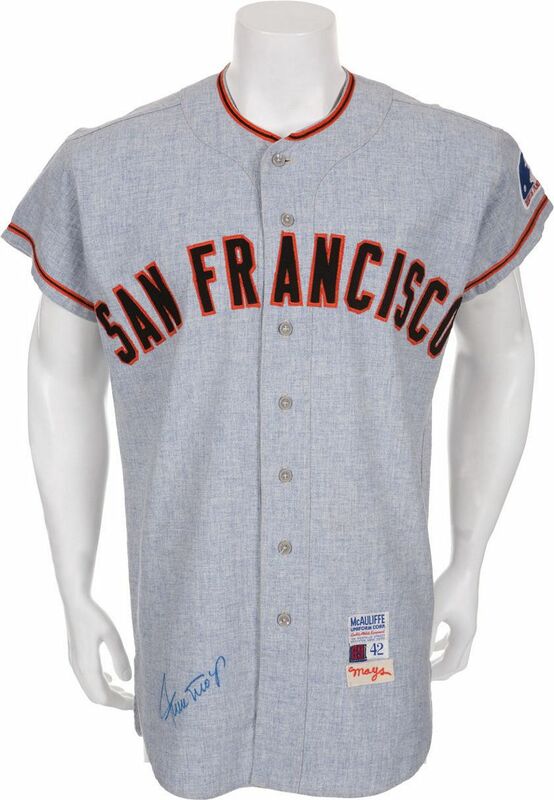 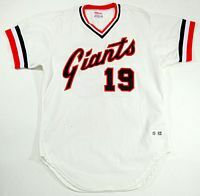 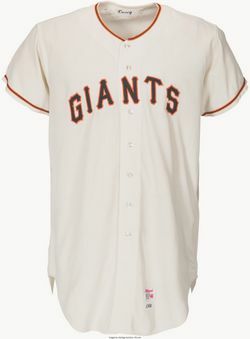 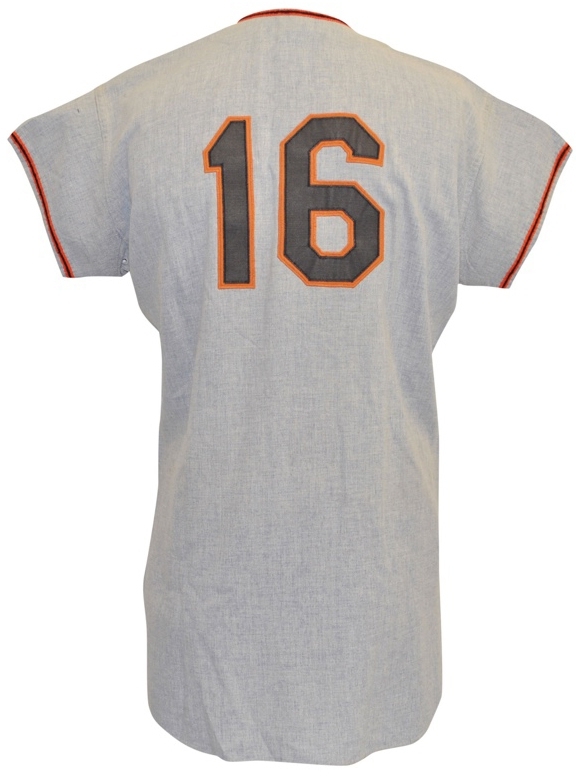 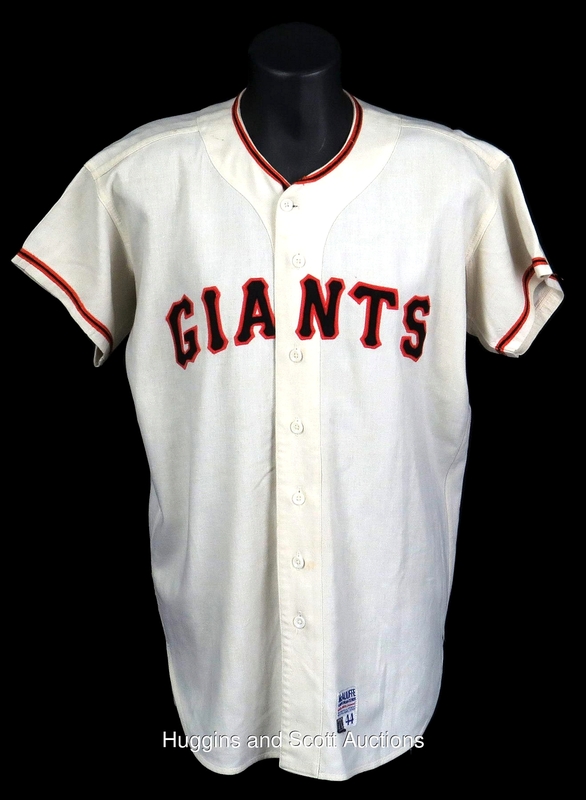 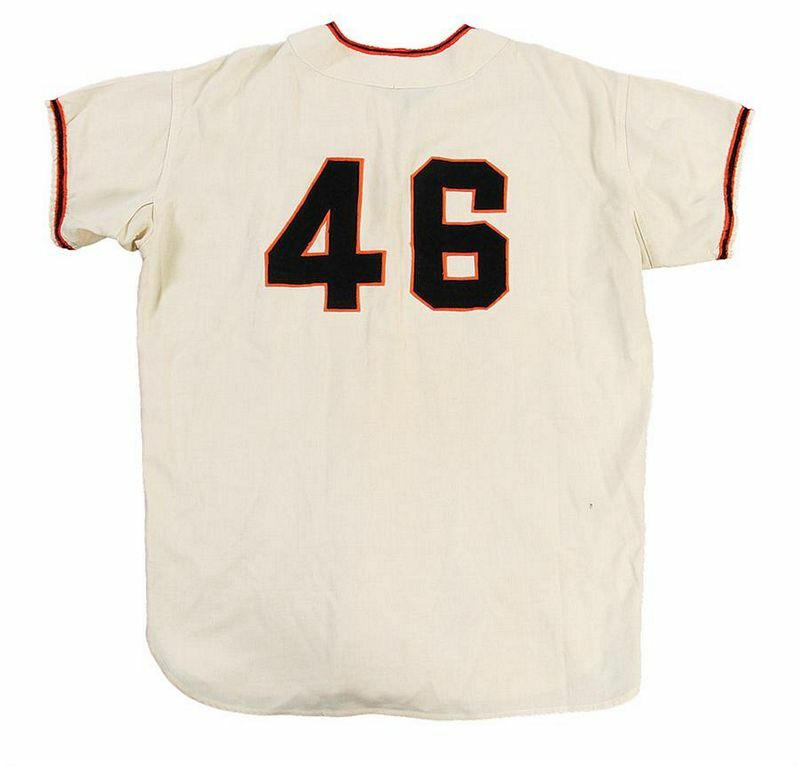 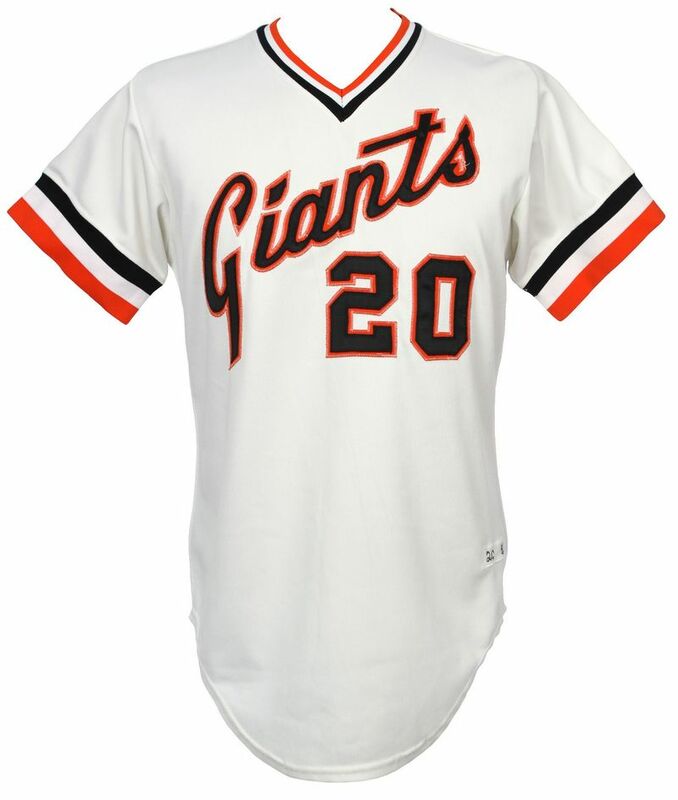 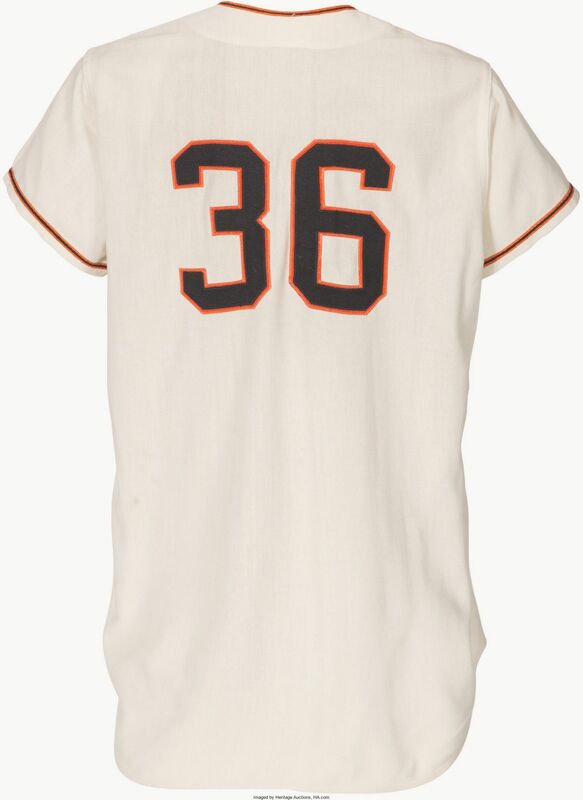 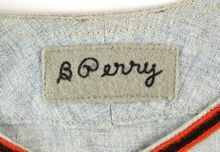 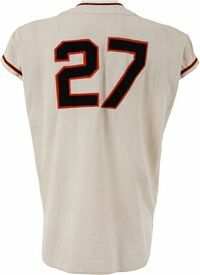 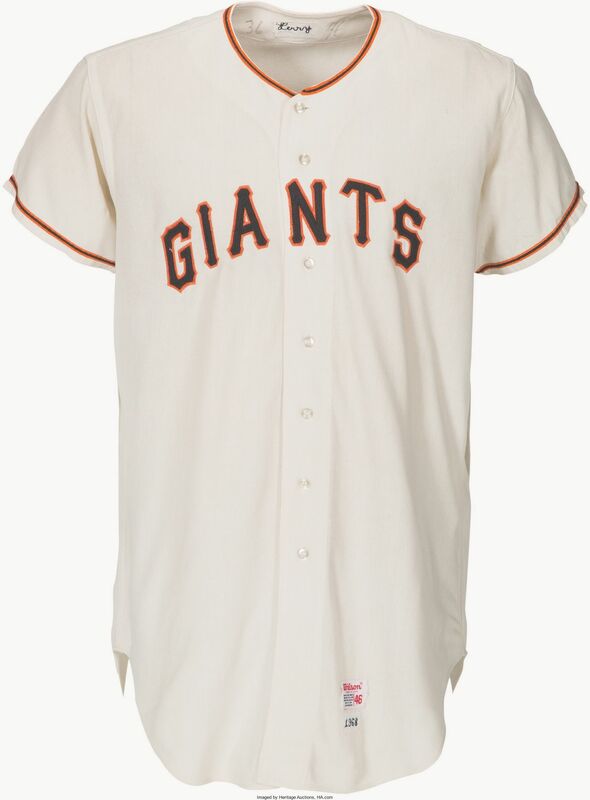 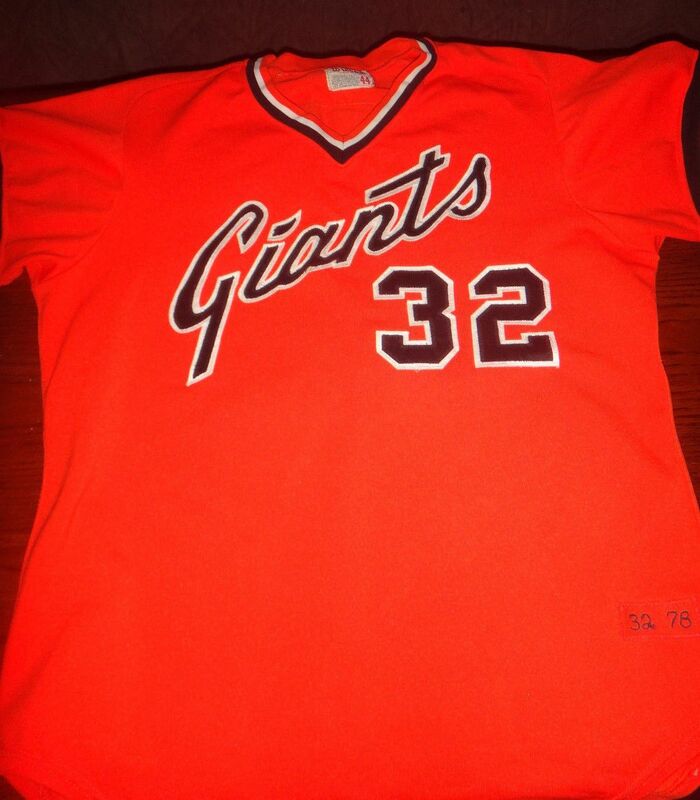 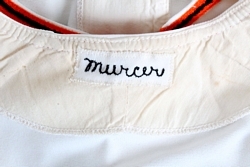 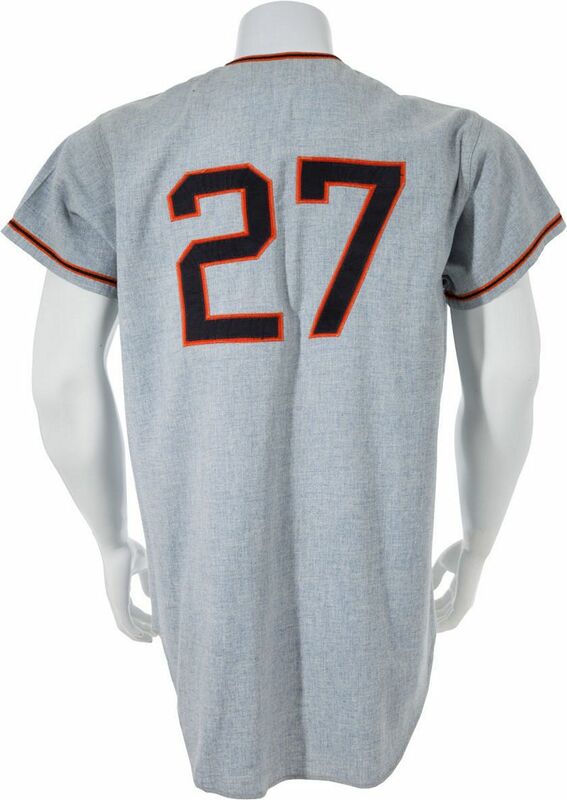 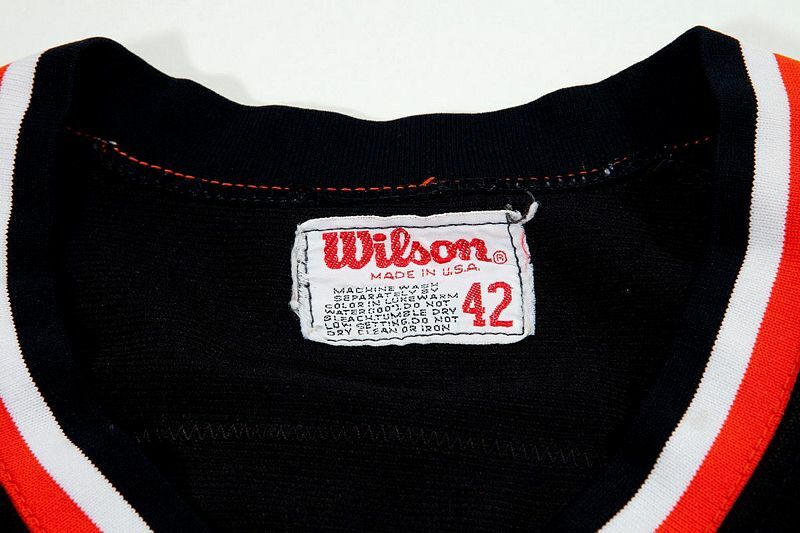 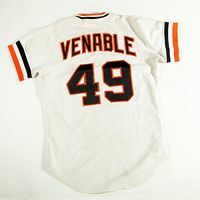 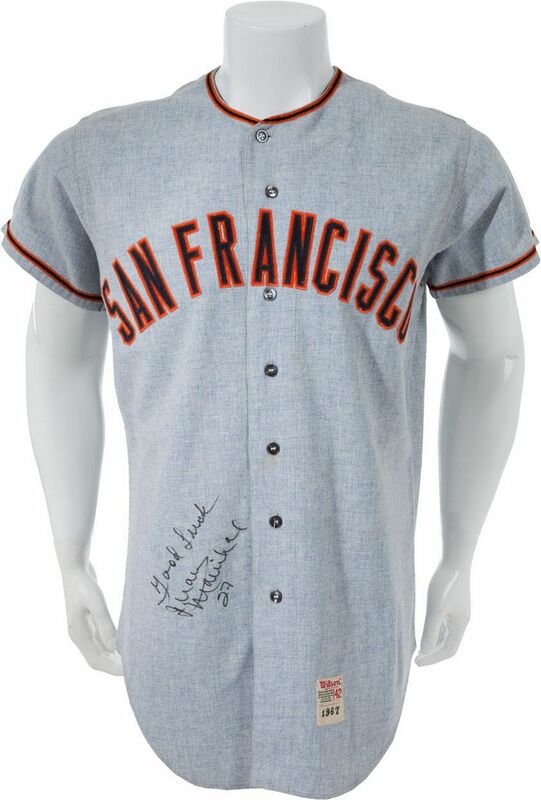 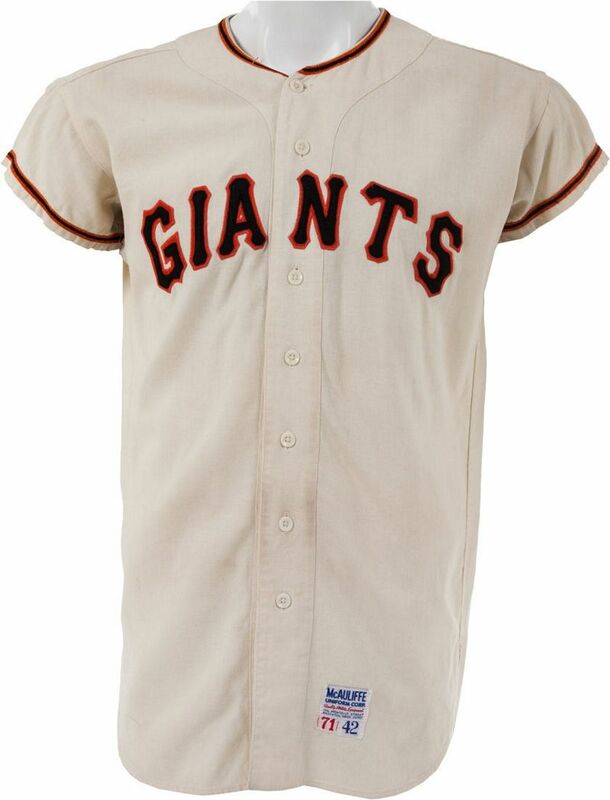 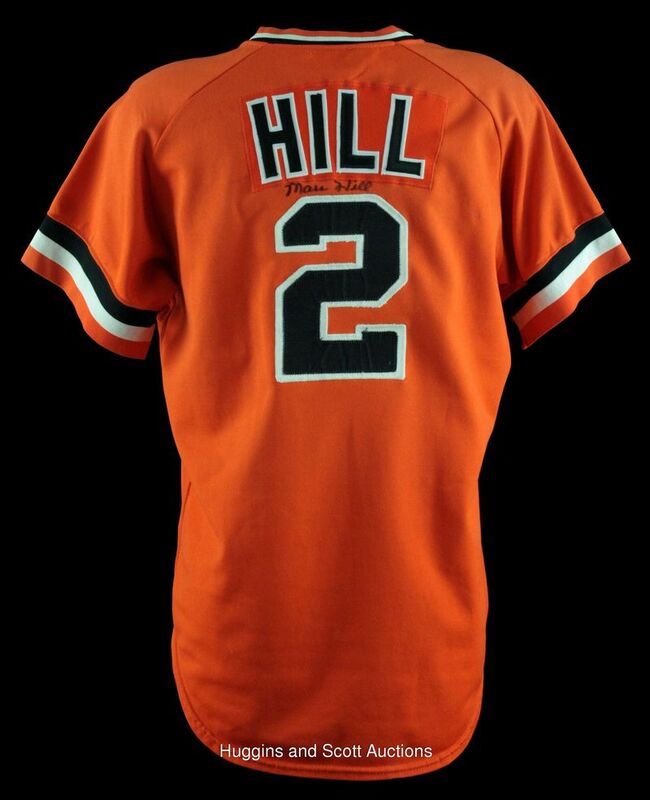 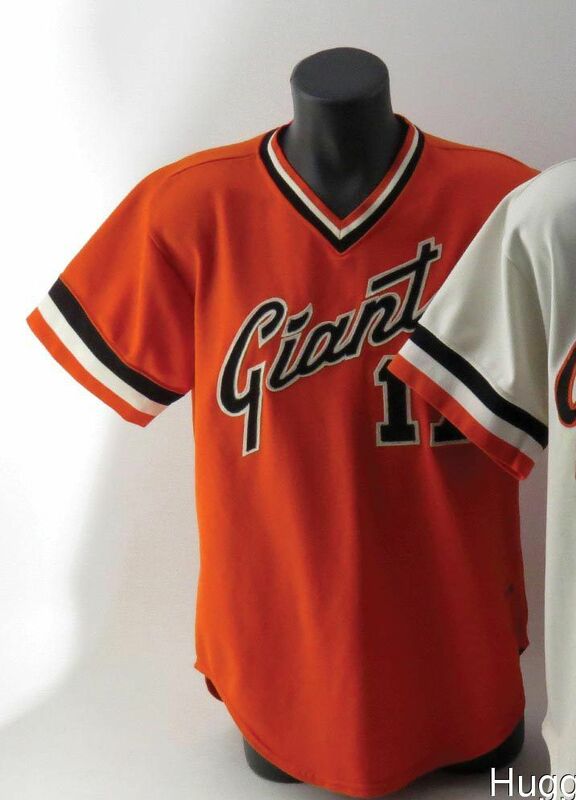 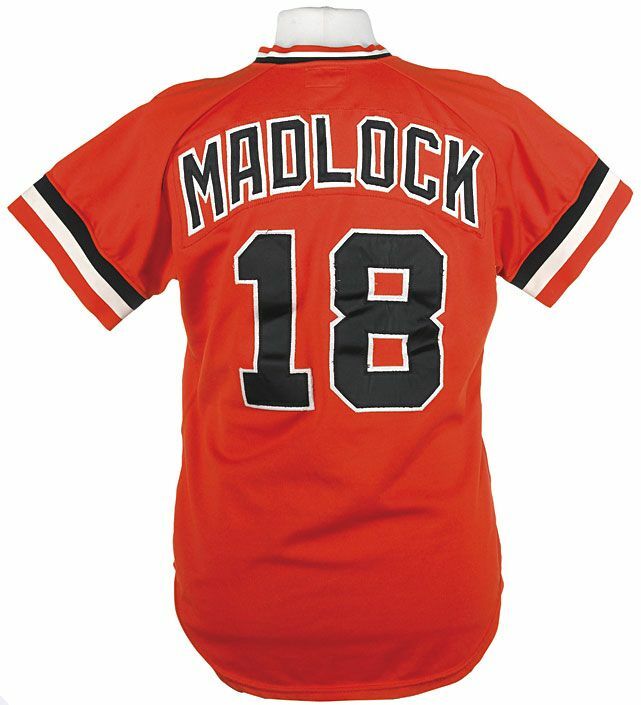 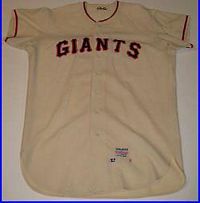 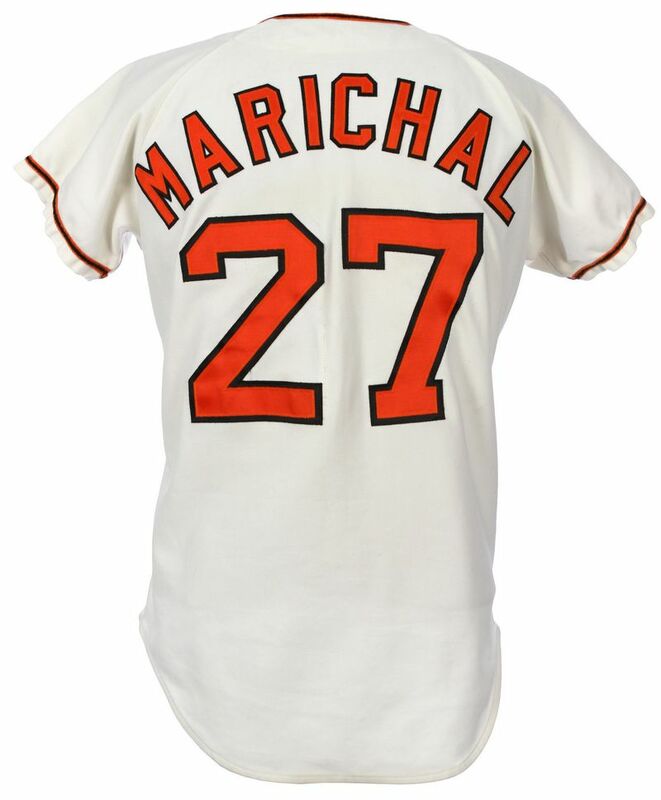 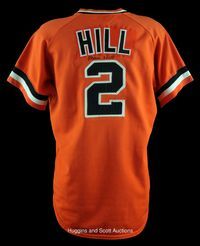 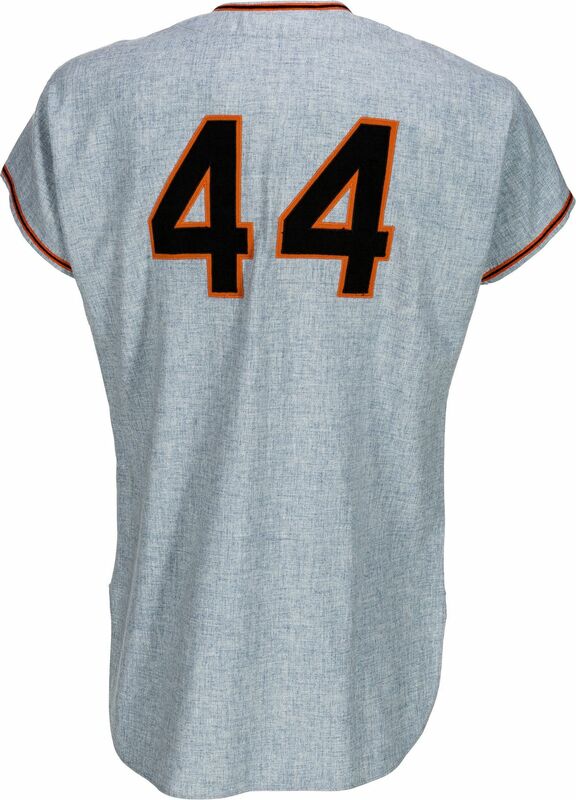 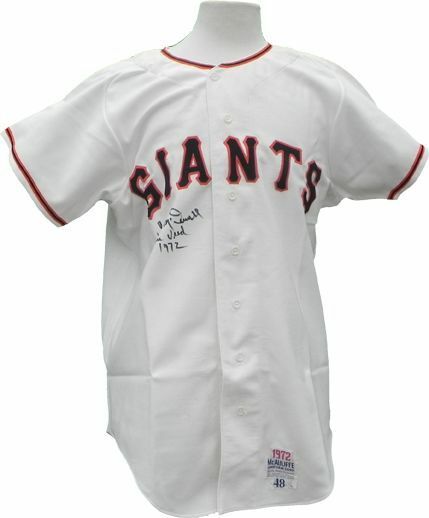 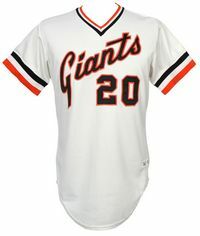 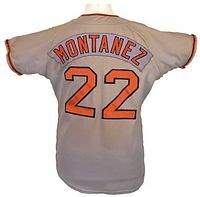 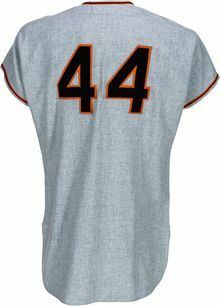 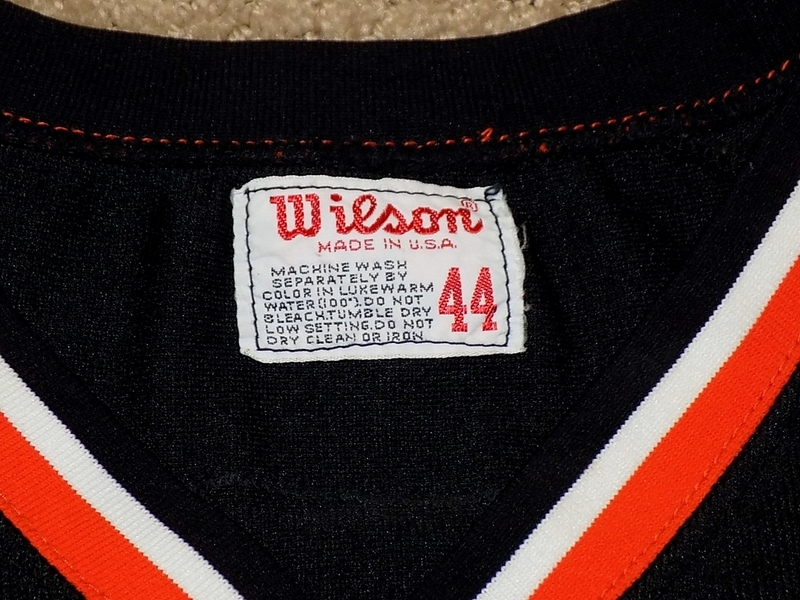 "Giants" script is now on all jerseys. 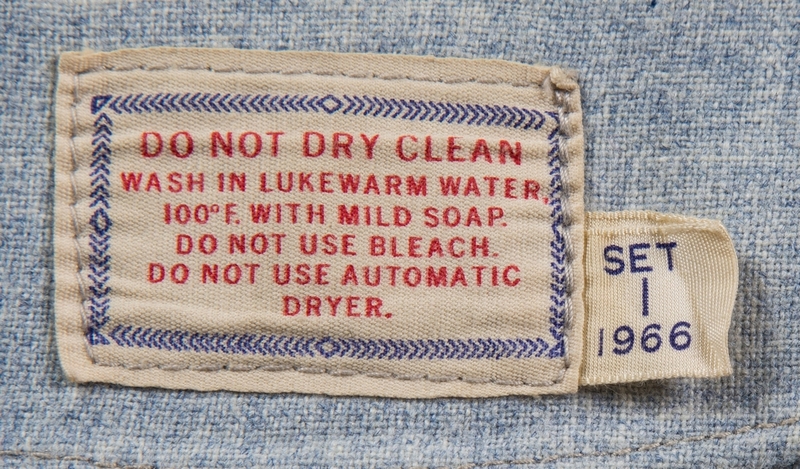 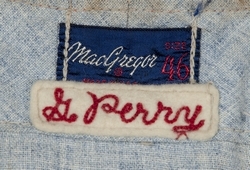 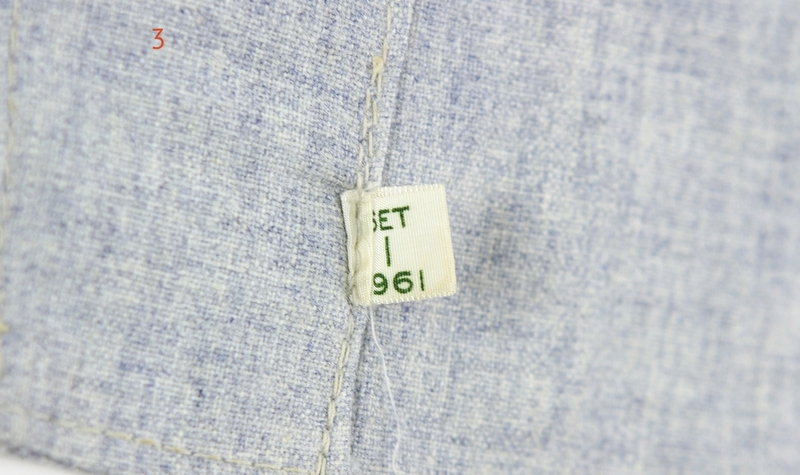 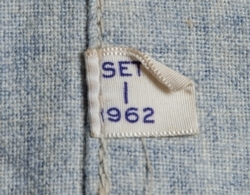 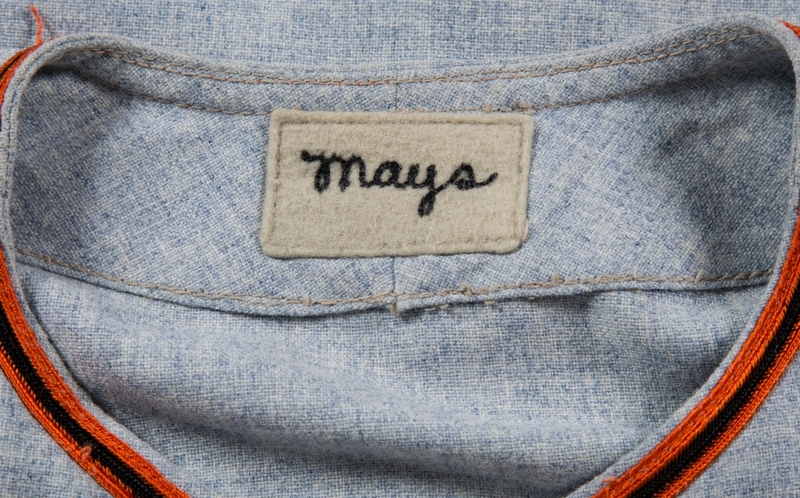 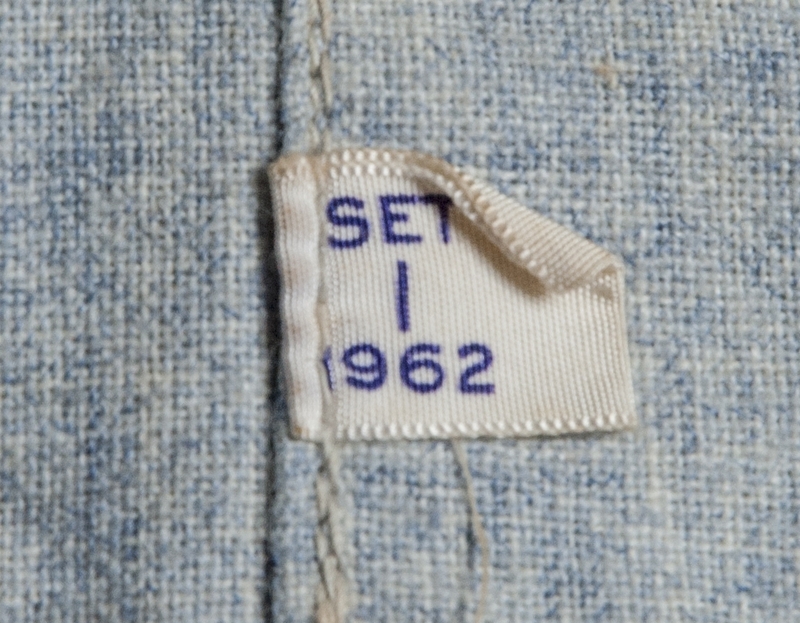 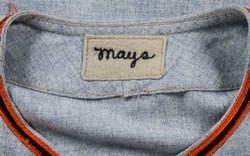 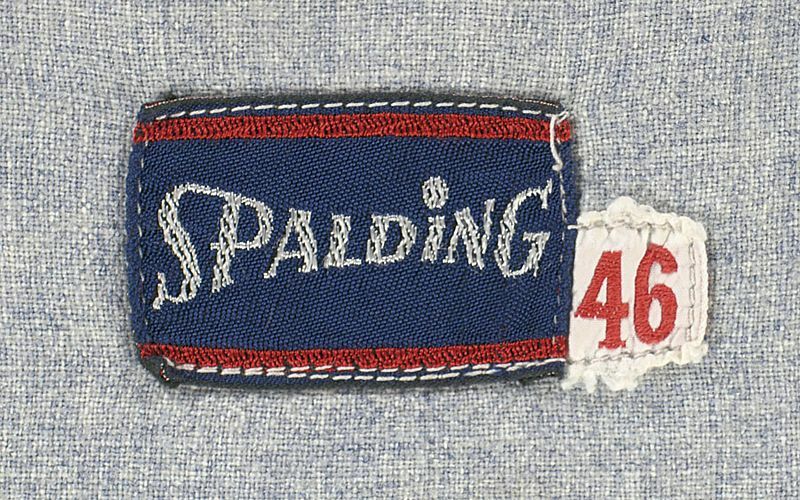 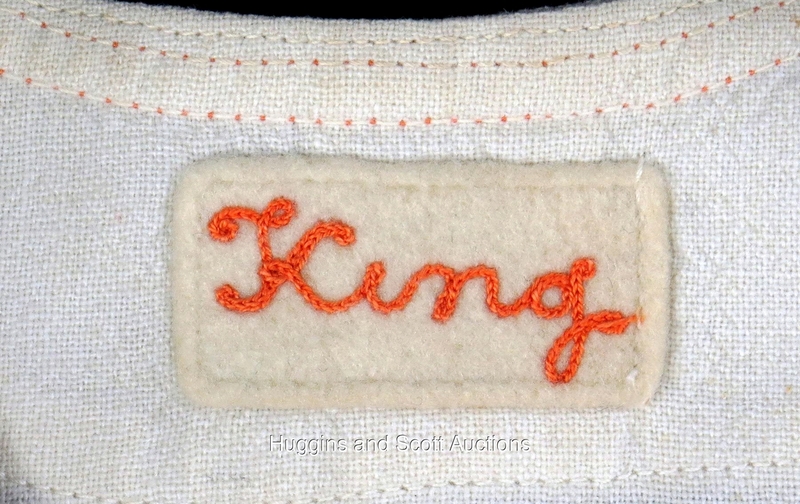 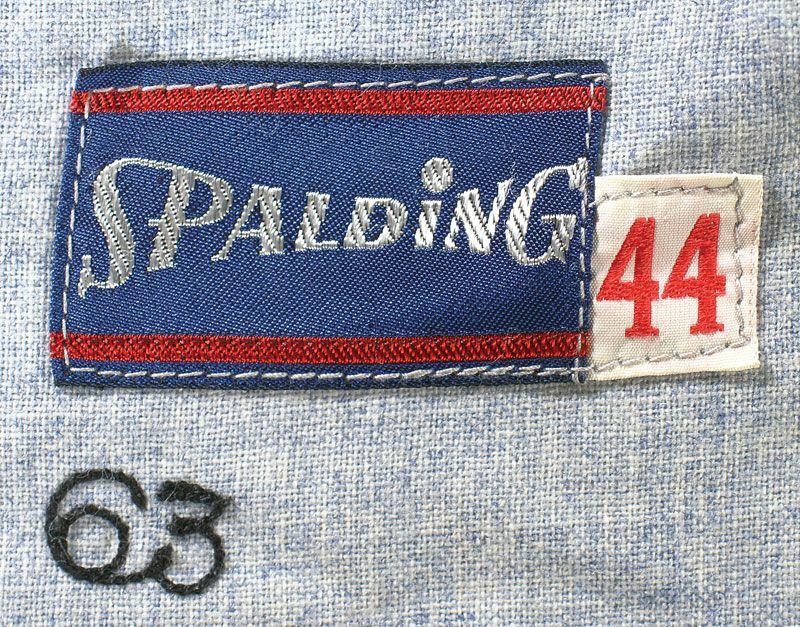 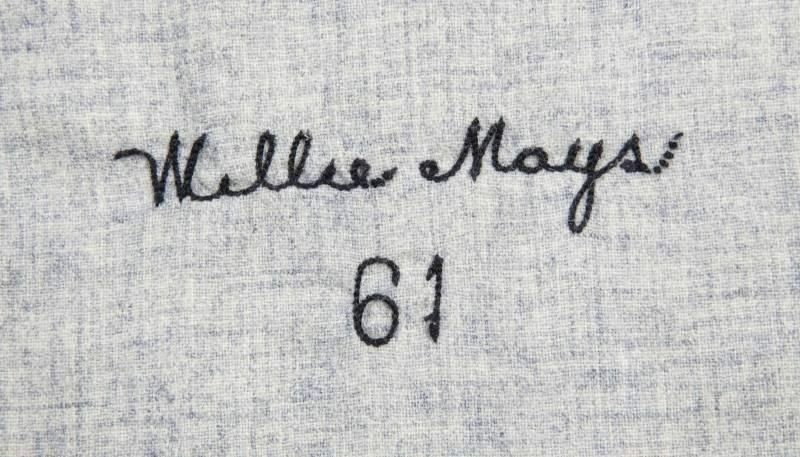 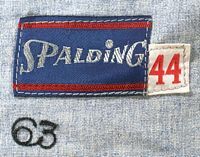 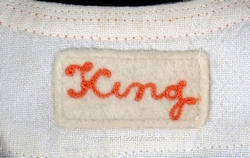 The script changes slightly; note the "s" now has an inward curl at the end. 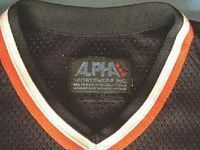 After player complaints the team orders 2 sets of black mesh jerseys from Alpha. 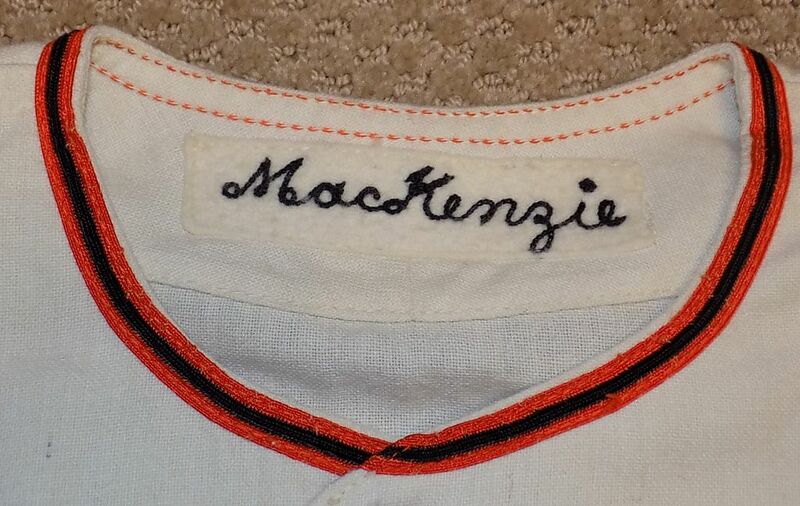 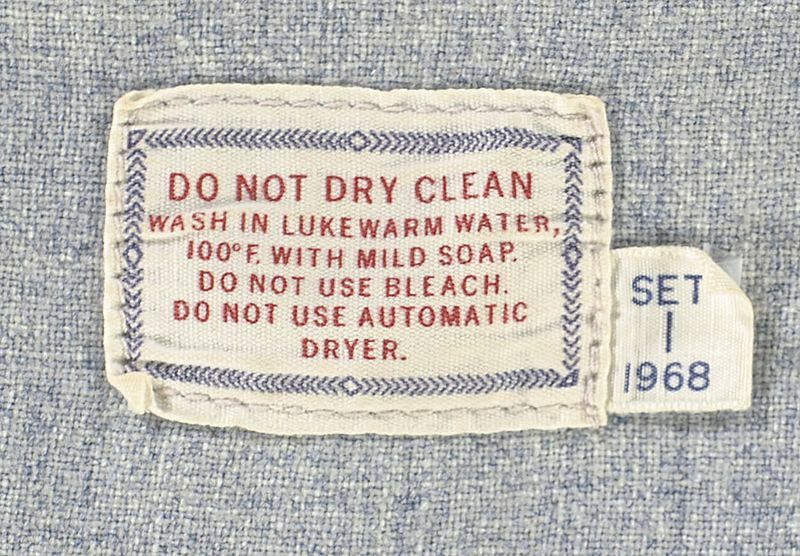 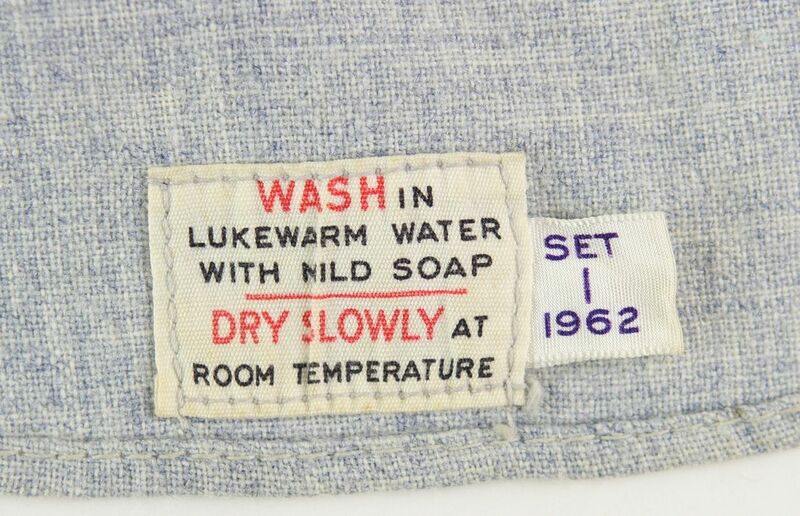 The lettering on the original set is rather poor (anyone have one? 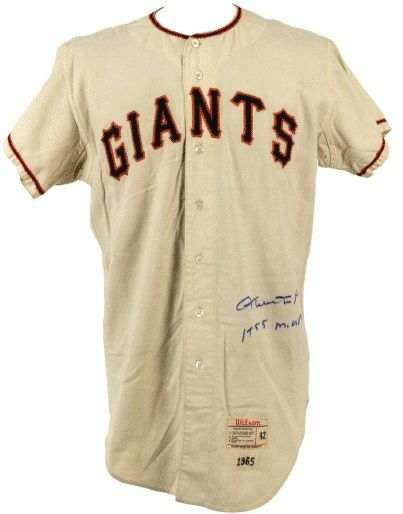 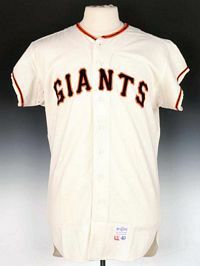 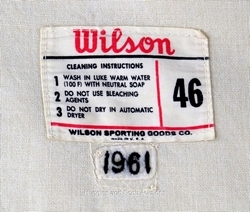 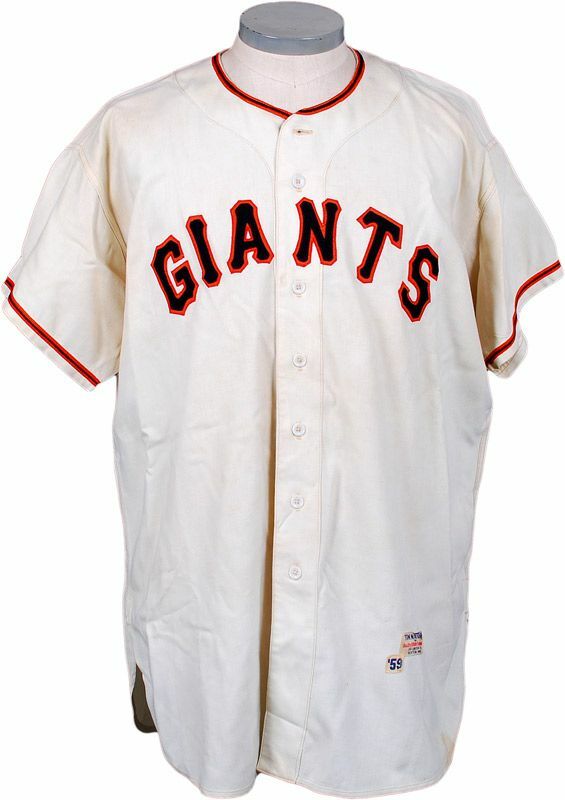 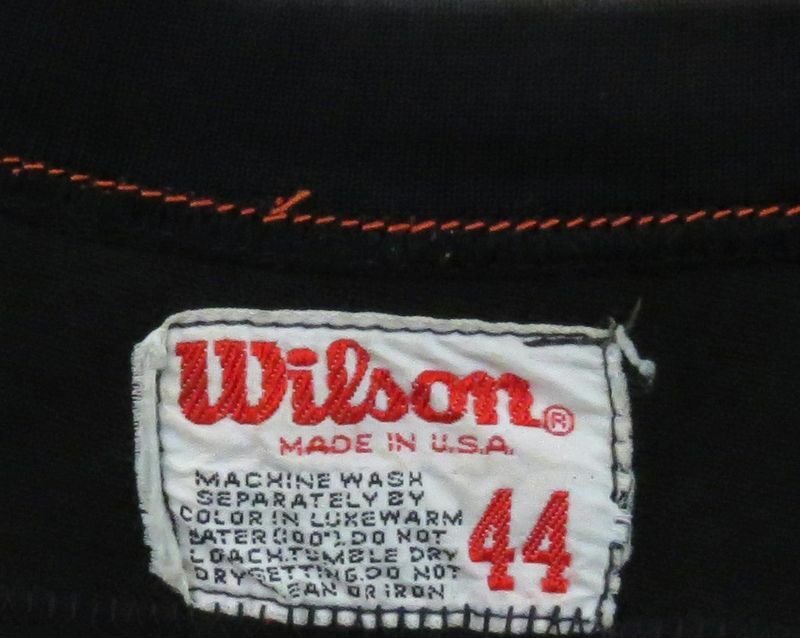 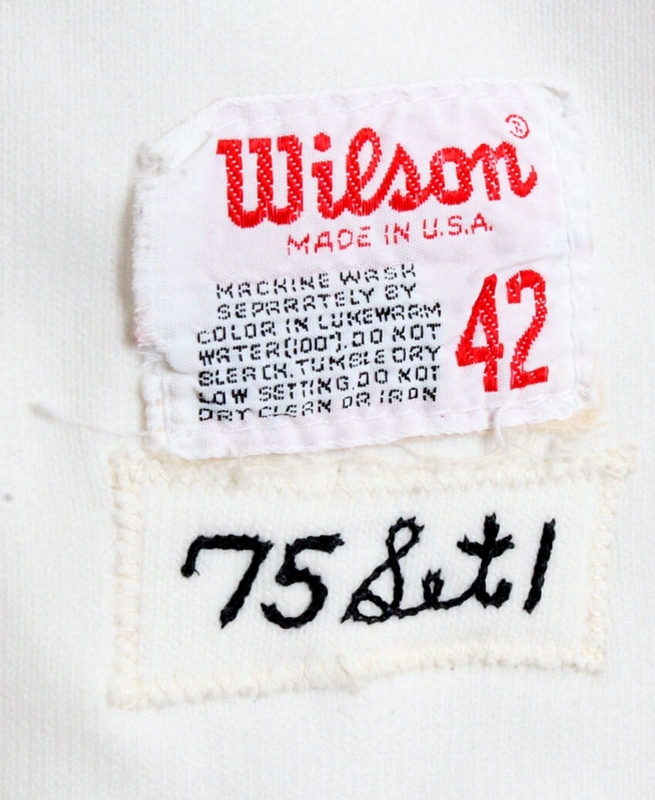 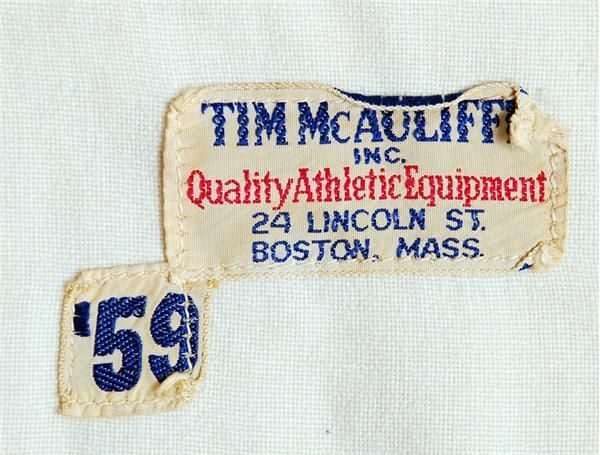 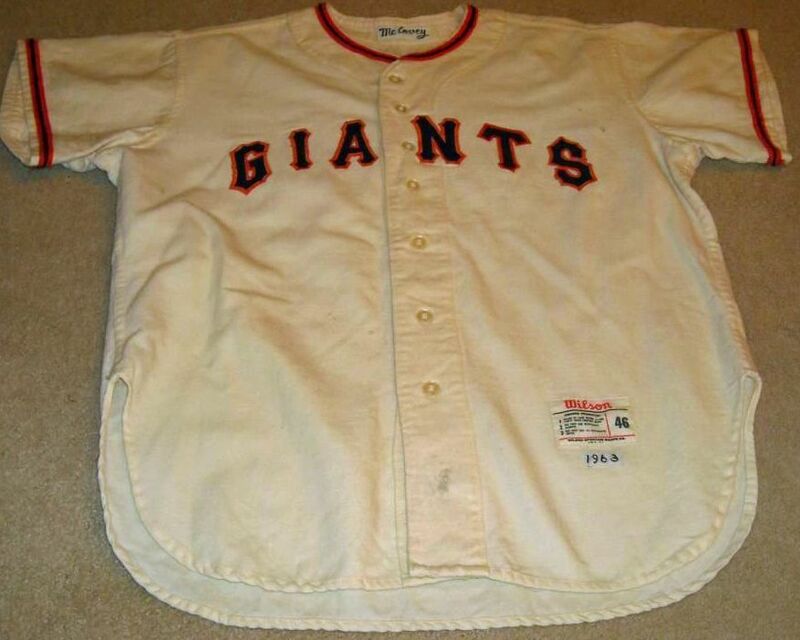 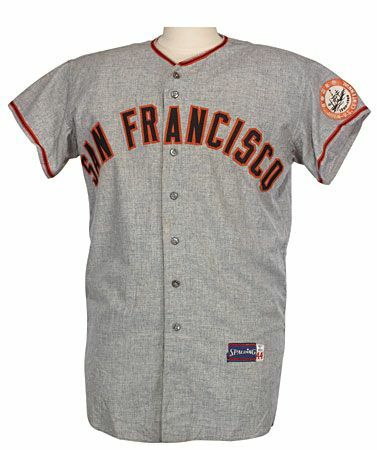 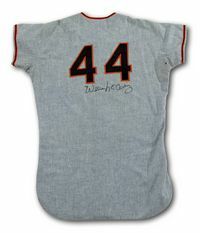 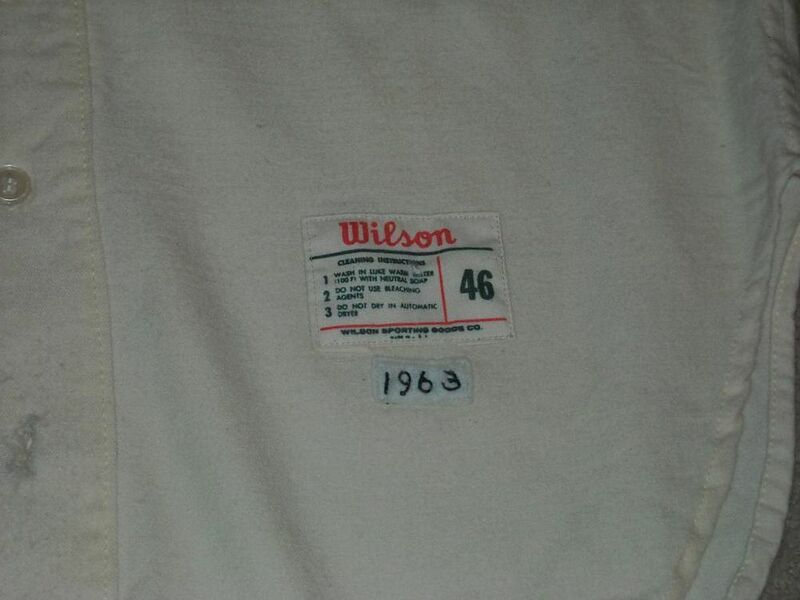 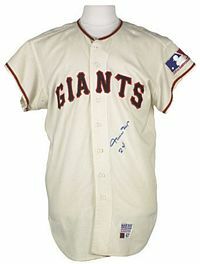 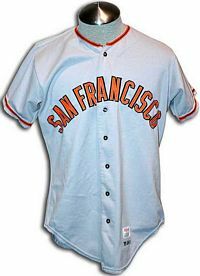 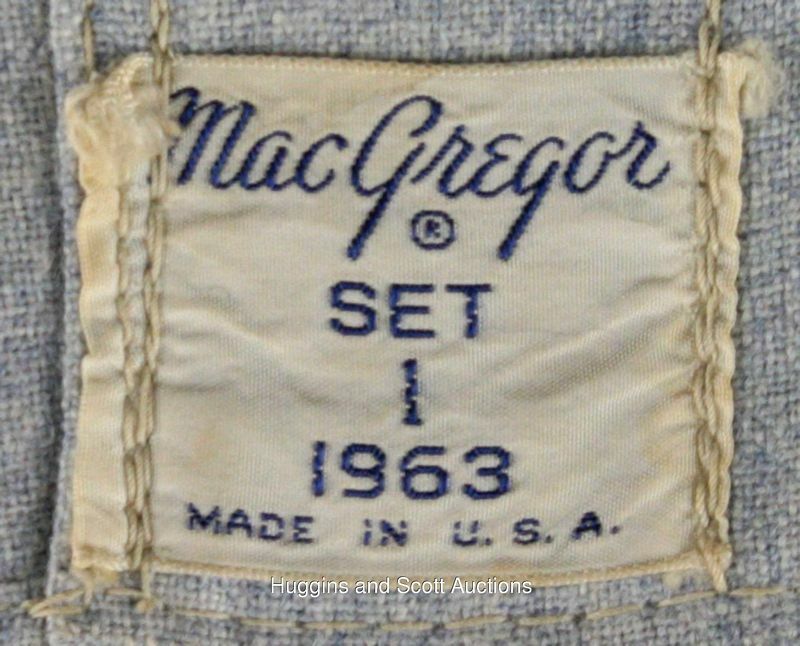 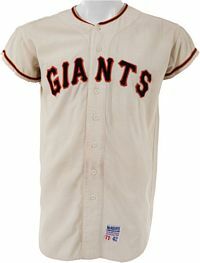 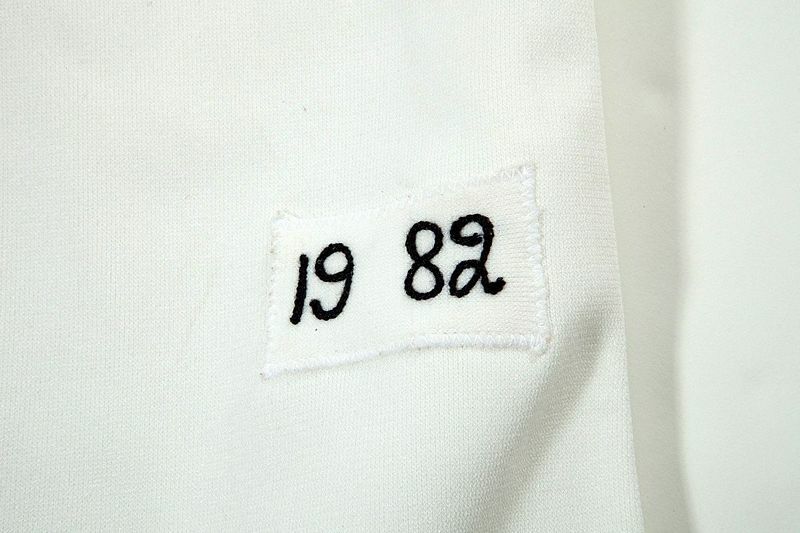 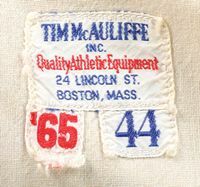 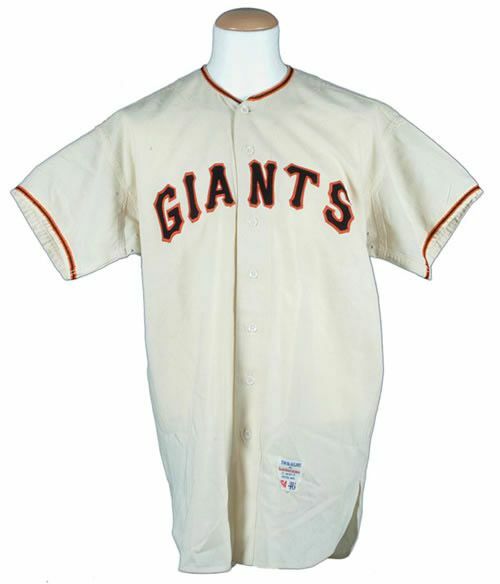 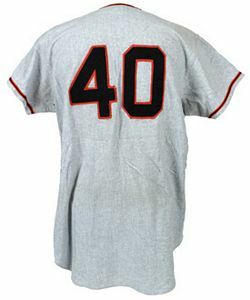 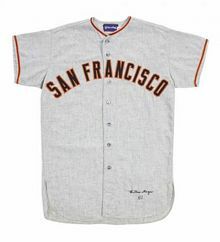 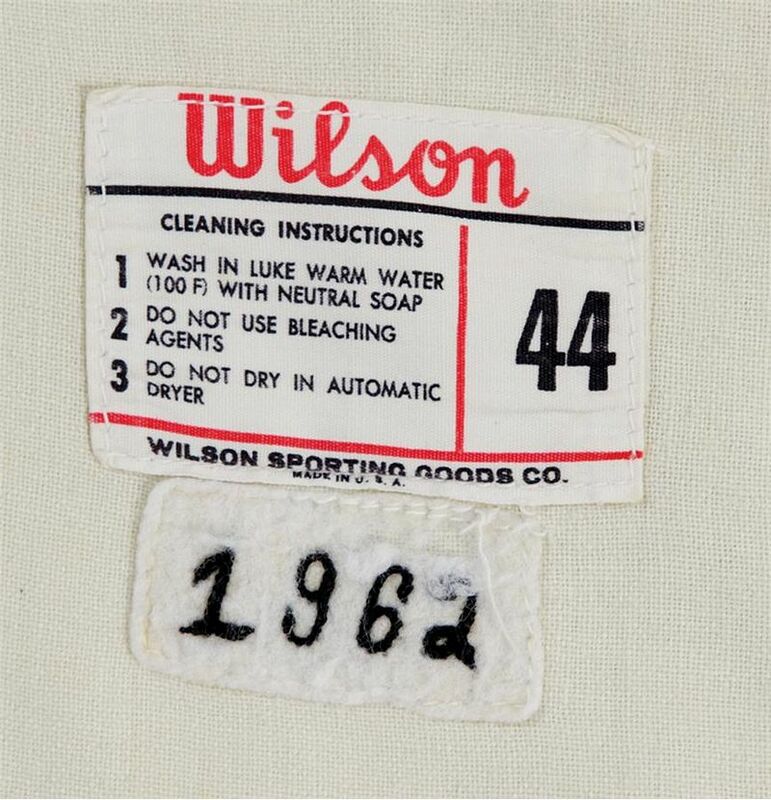 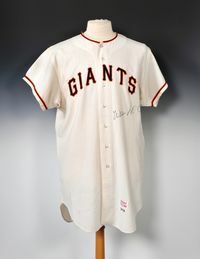 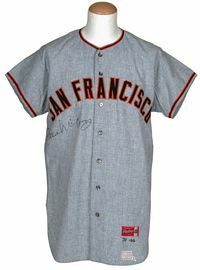 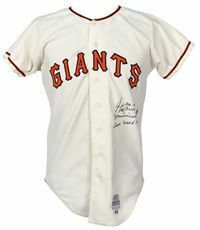 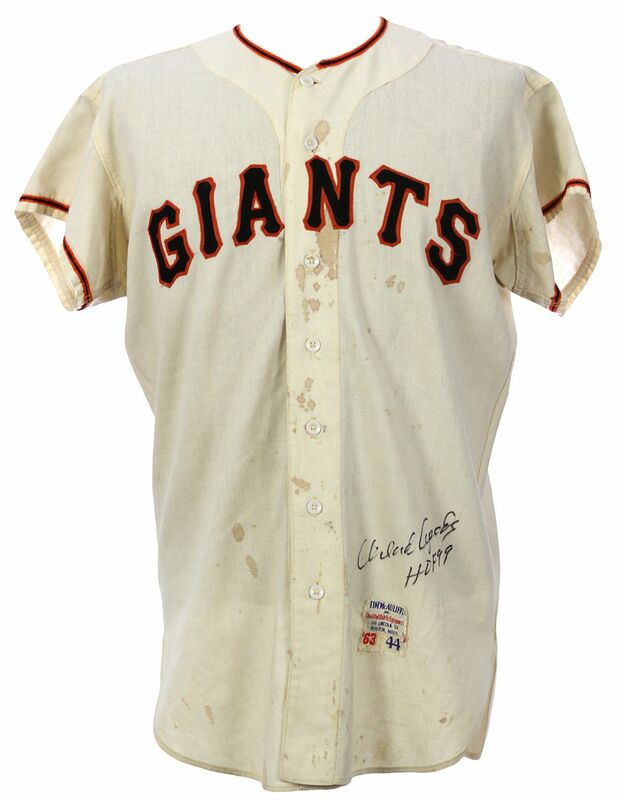 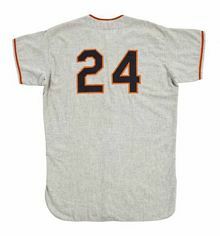 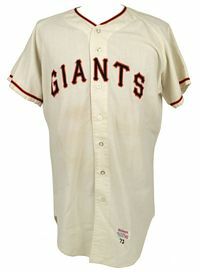 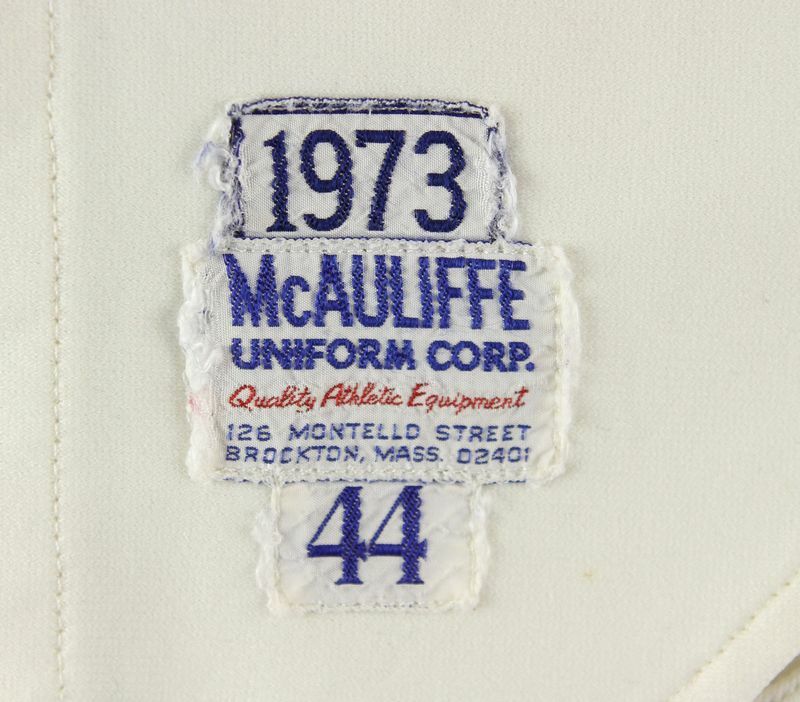 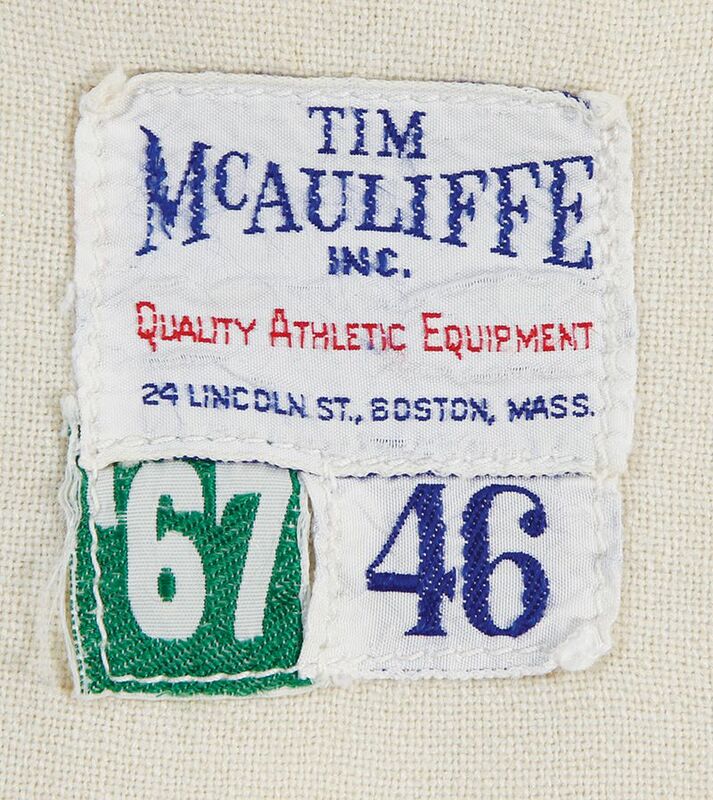 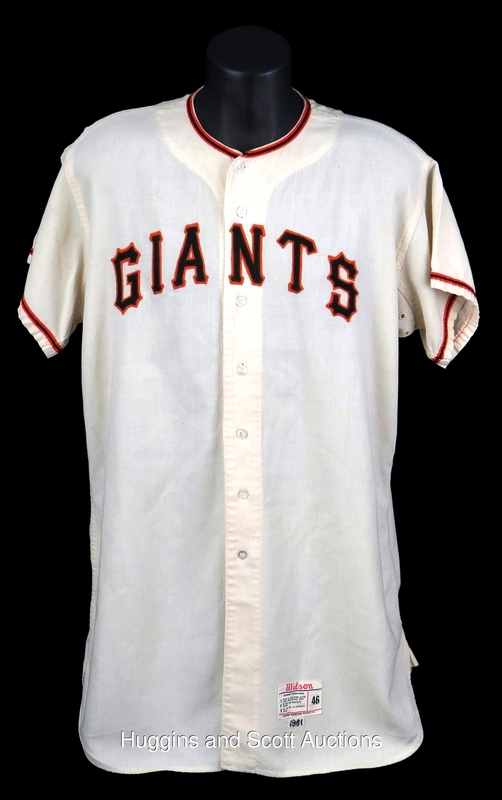 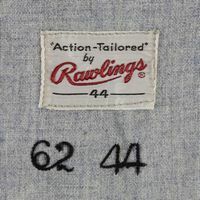 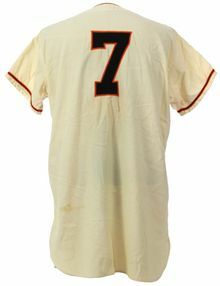 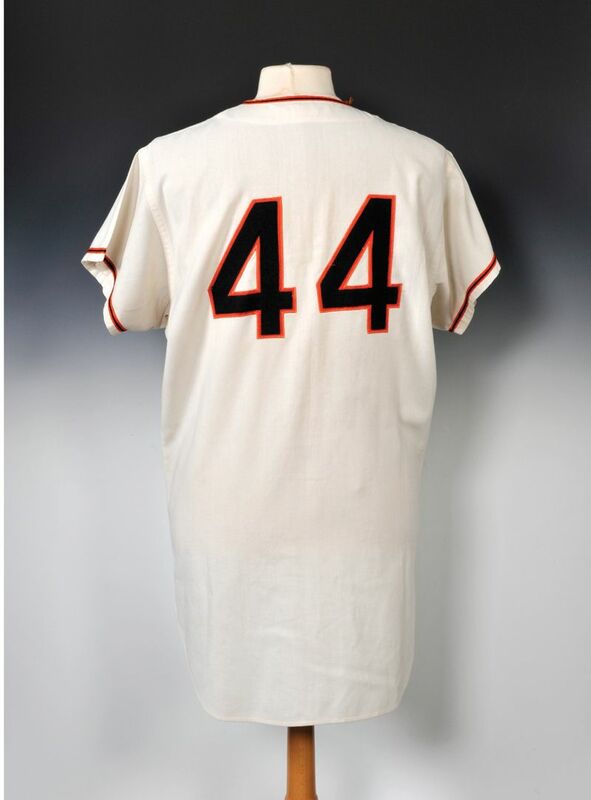 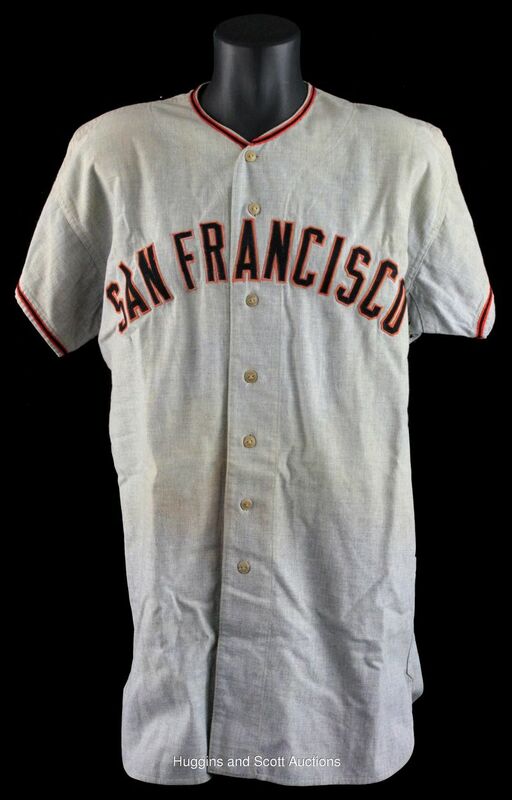 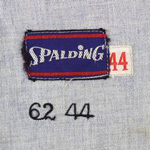 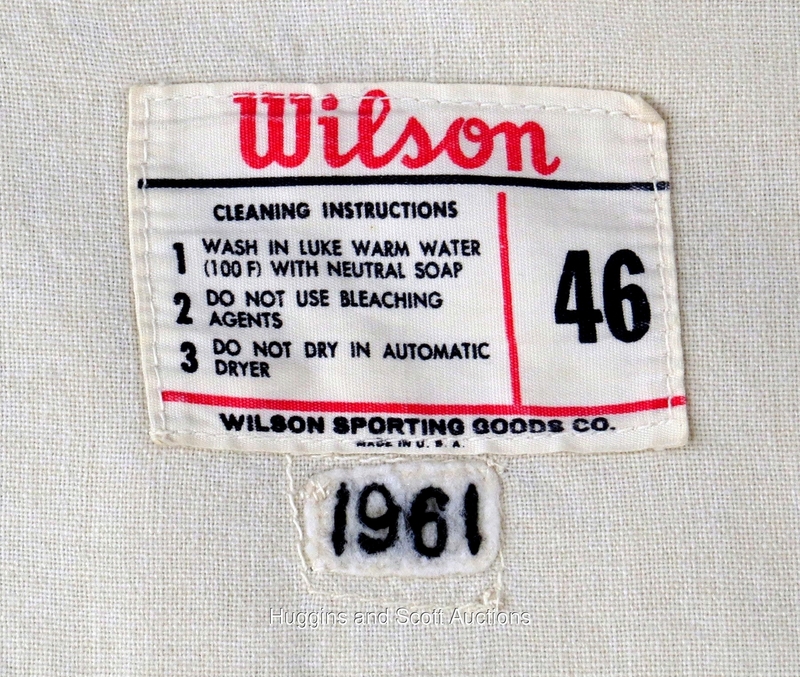 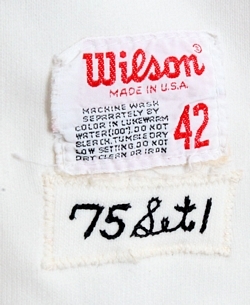 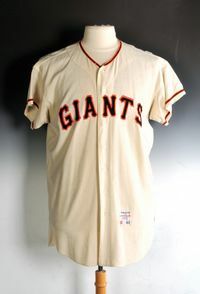 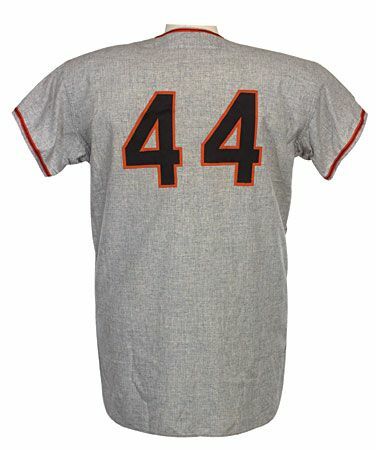 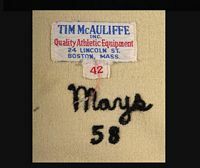 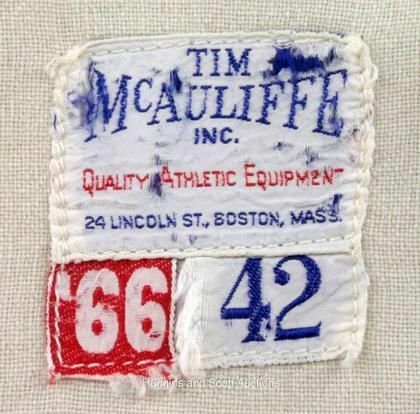 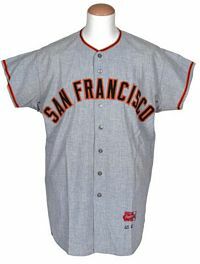 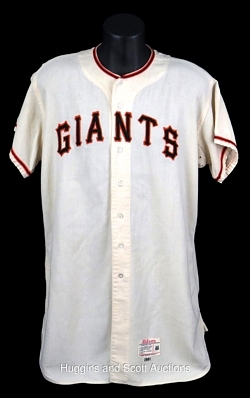 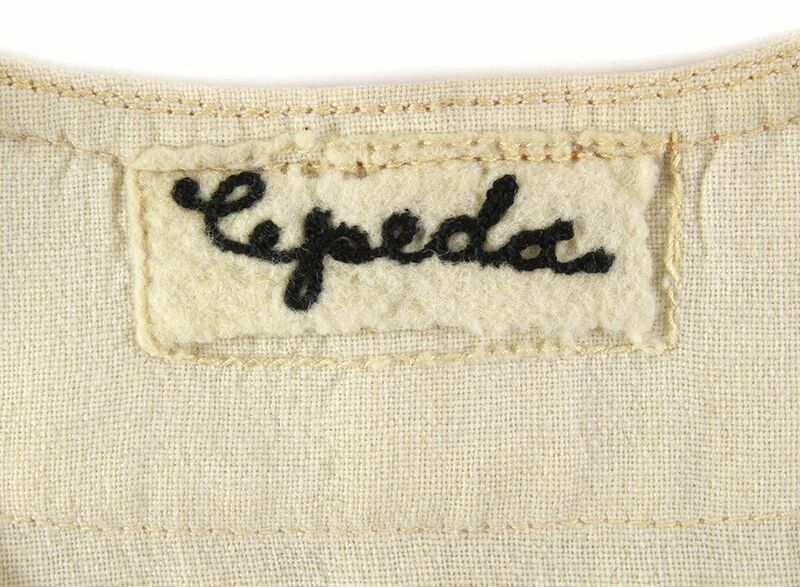 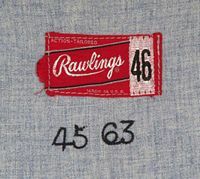 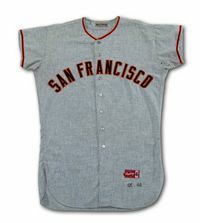 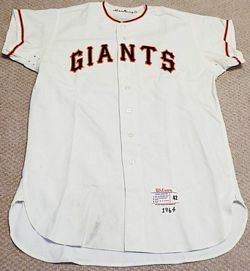 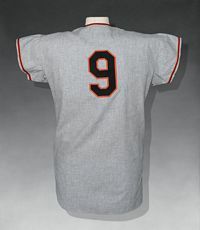 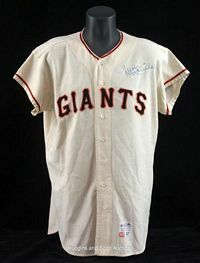 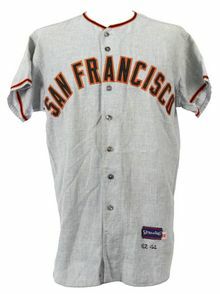 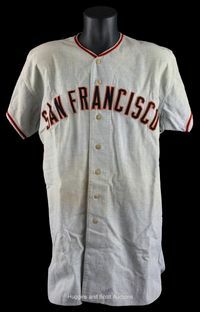 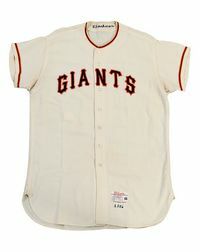 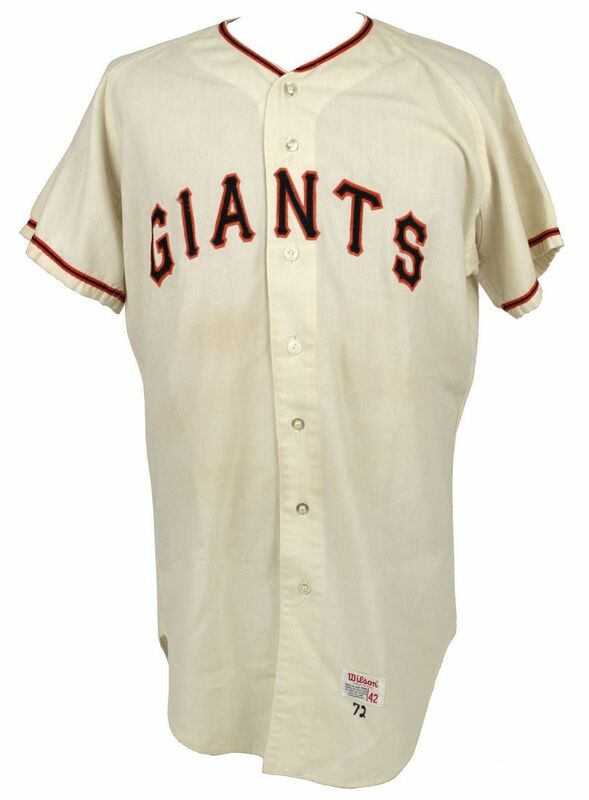 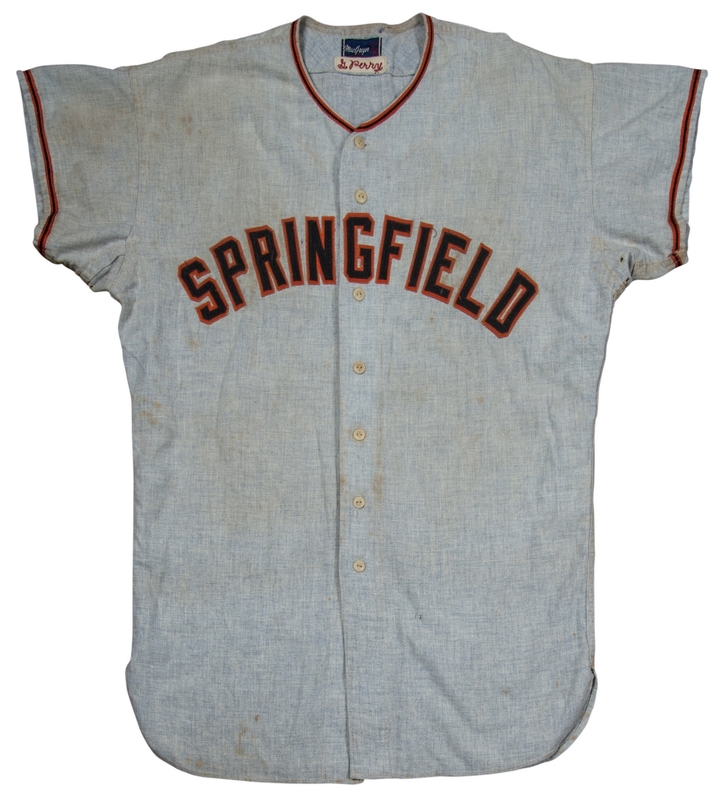 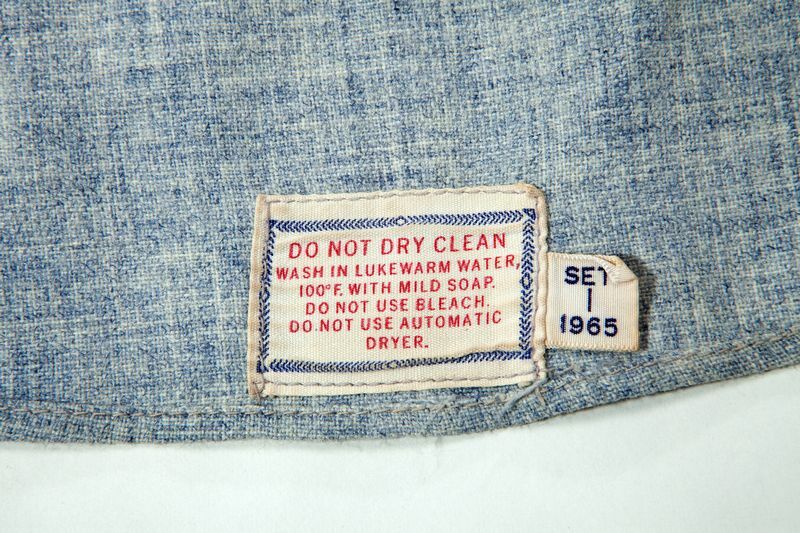 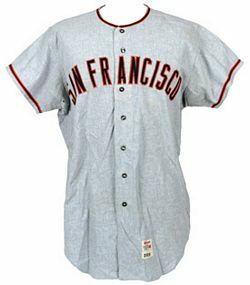 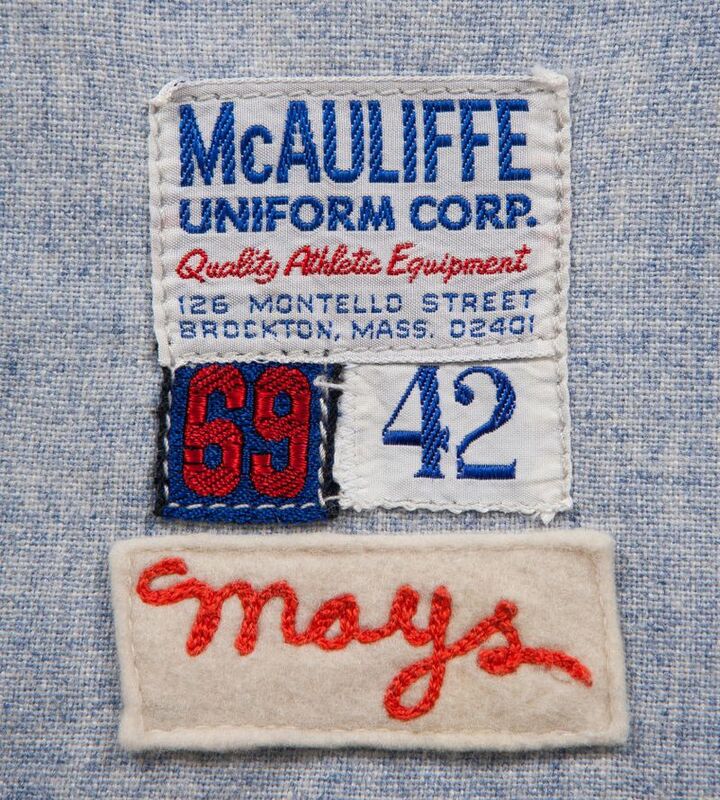 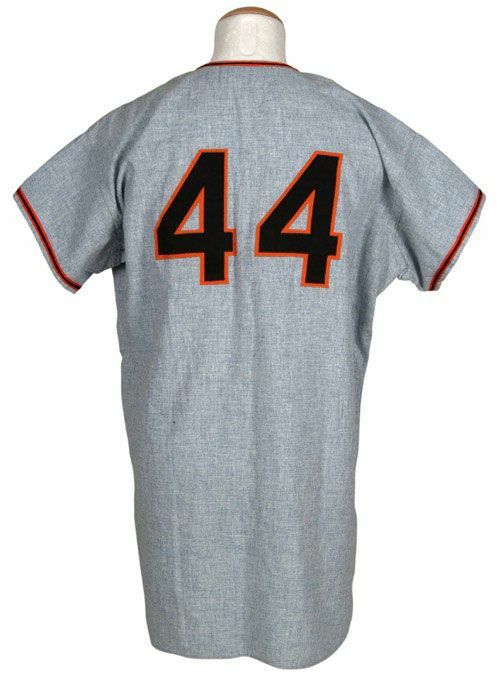 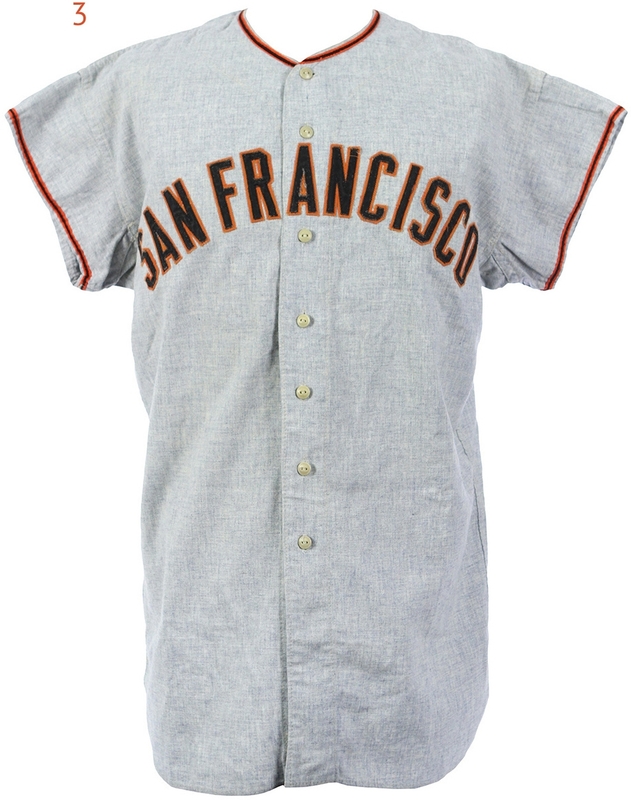 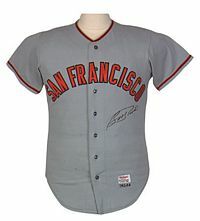 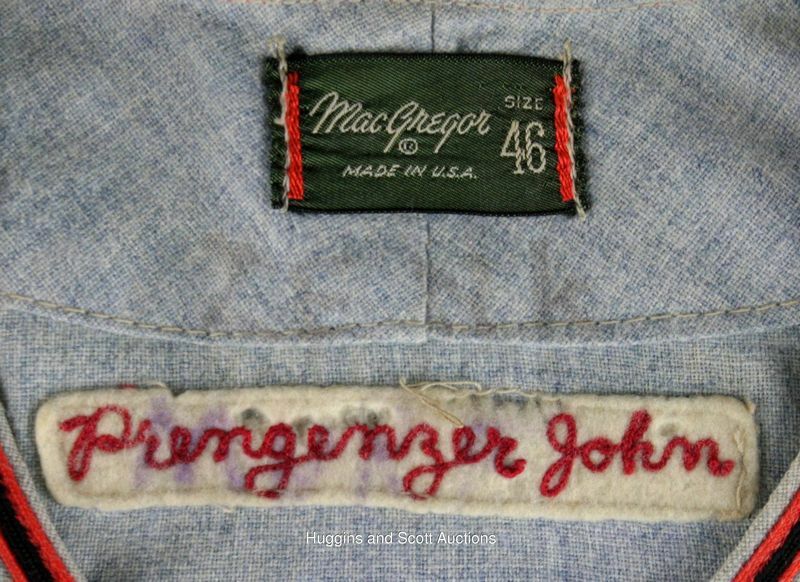 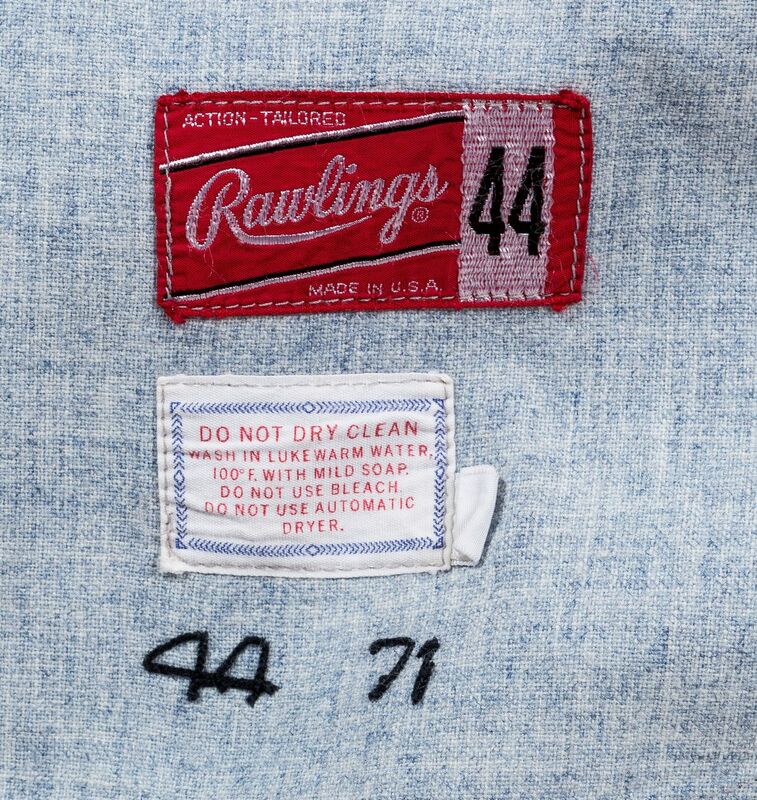 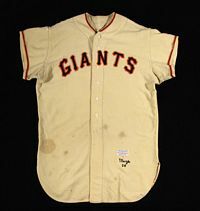 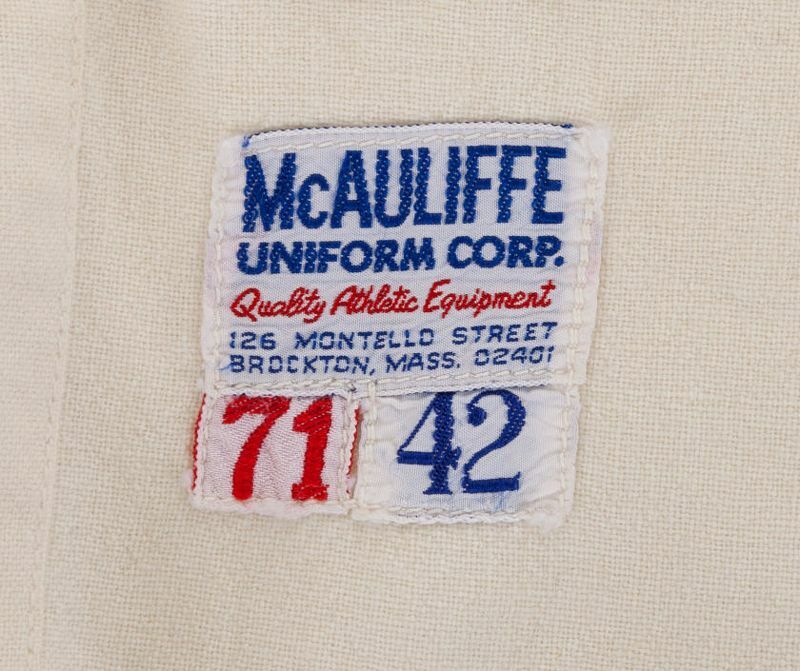 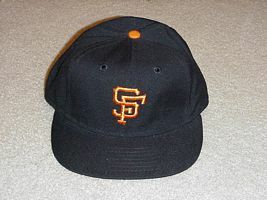 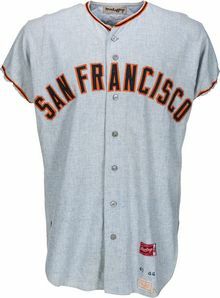 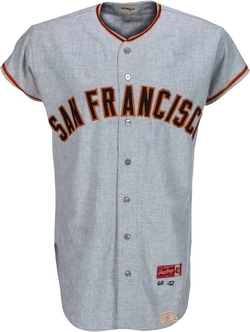 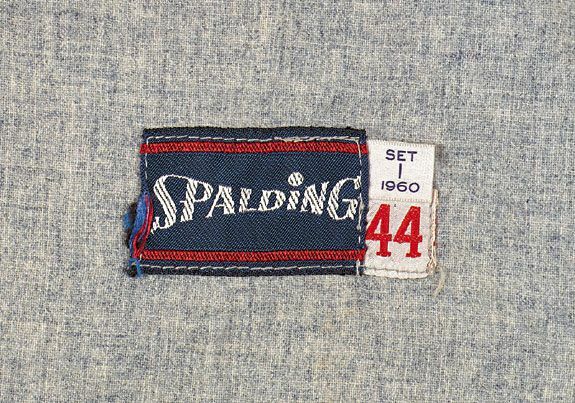 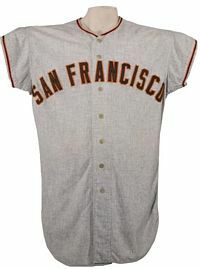 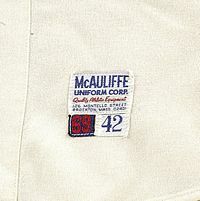 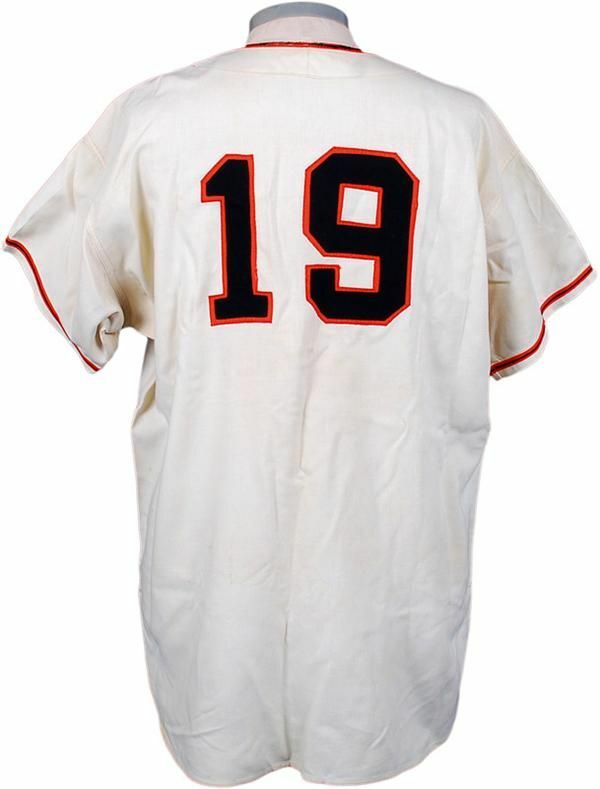 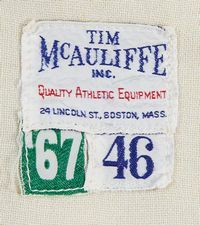 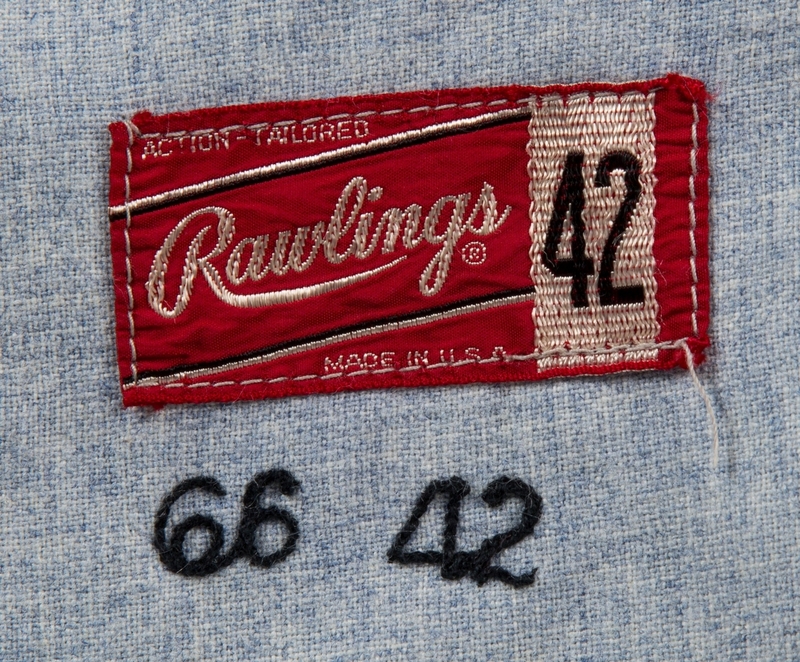 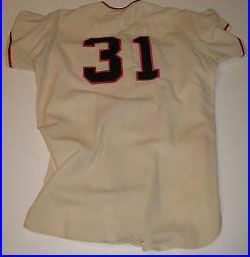 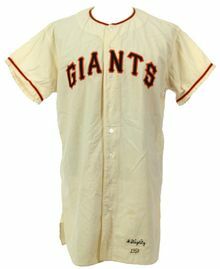 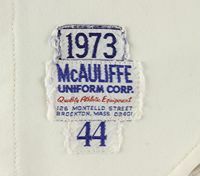 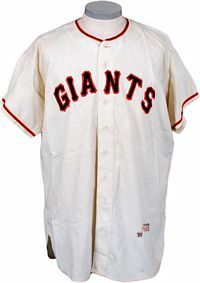 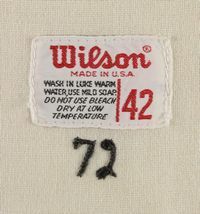 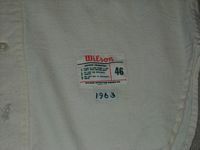 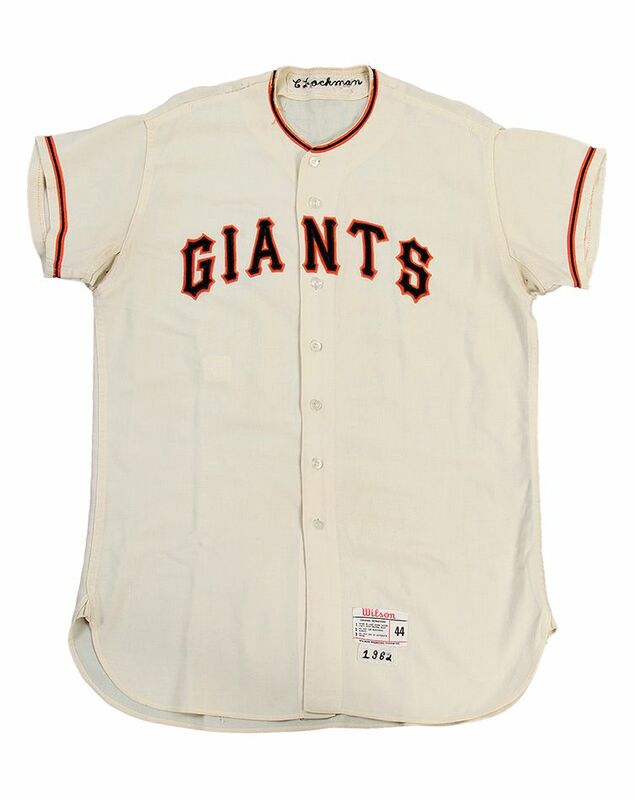 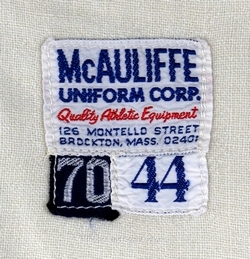 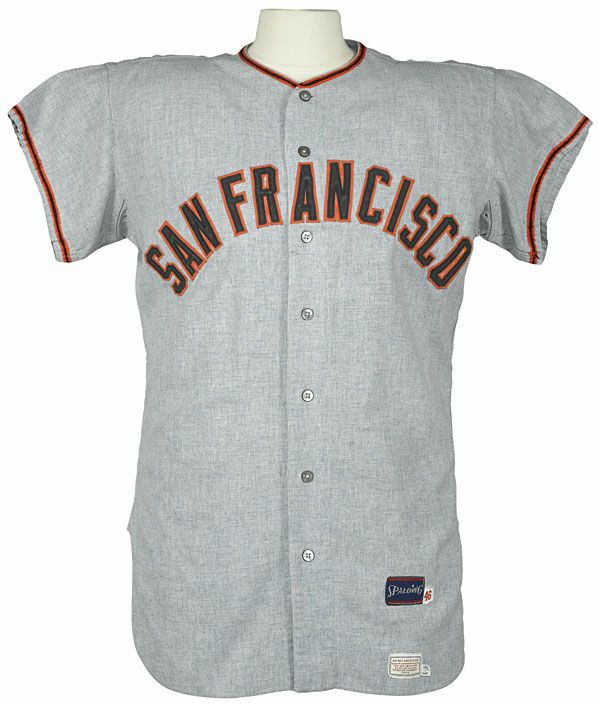 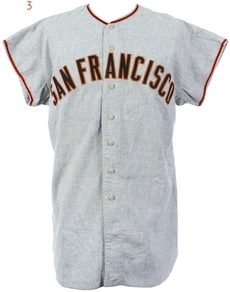 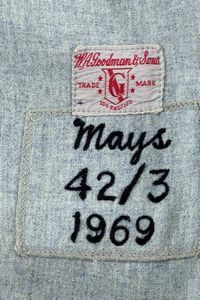 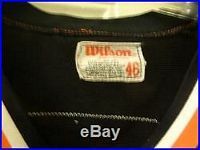 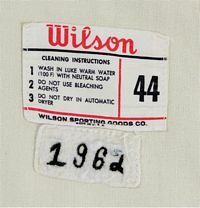 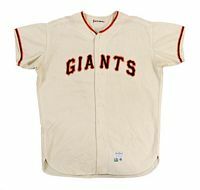 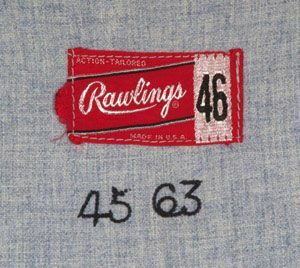 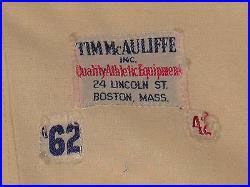 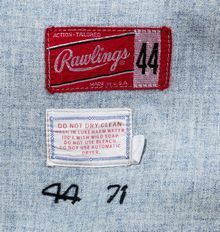 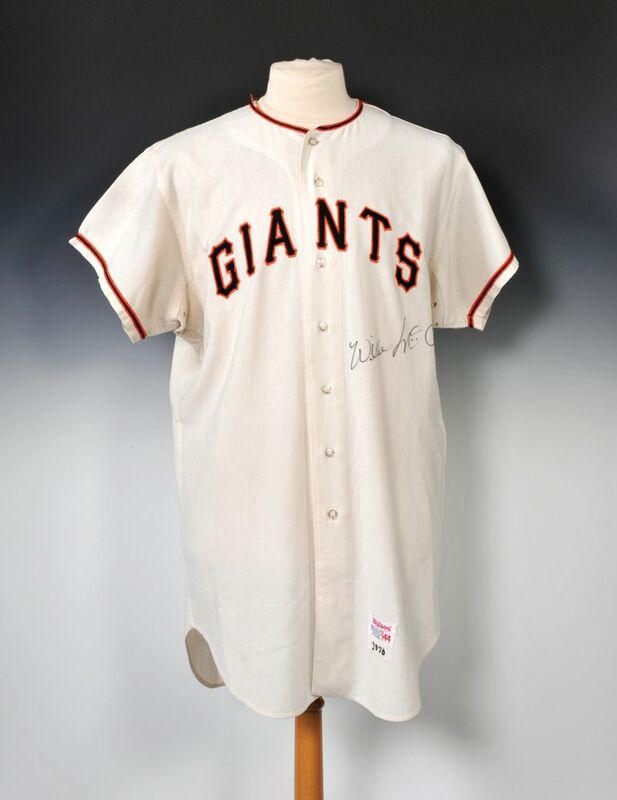 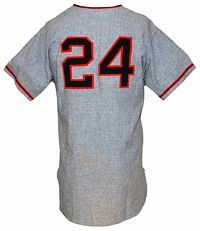 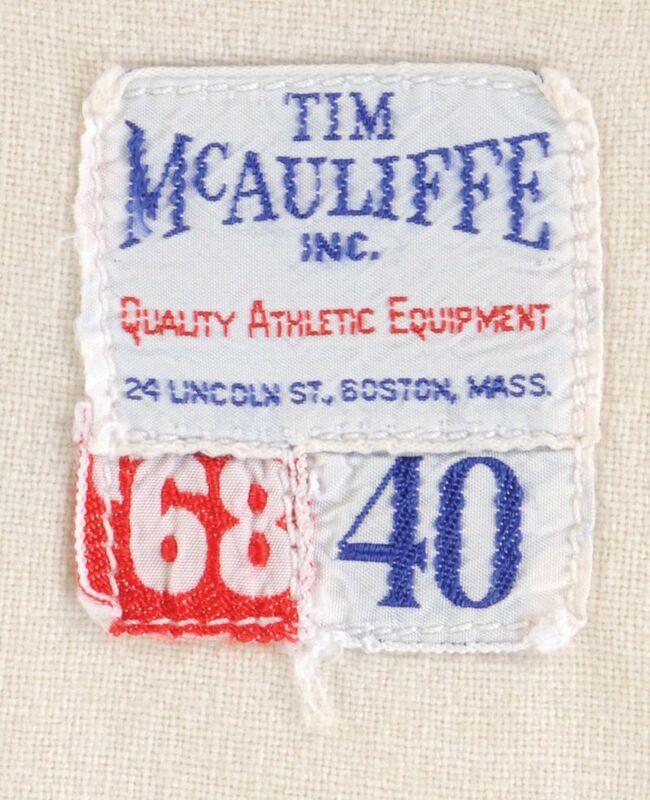 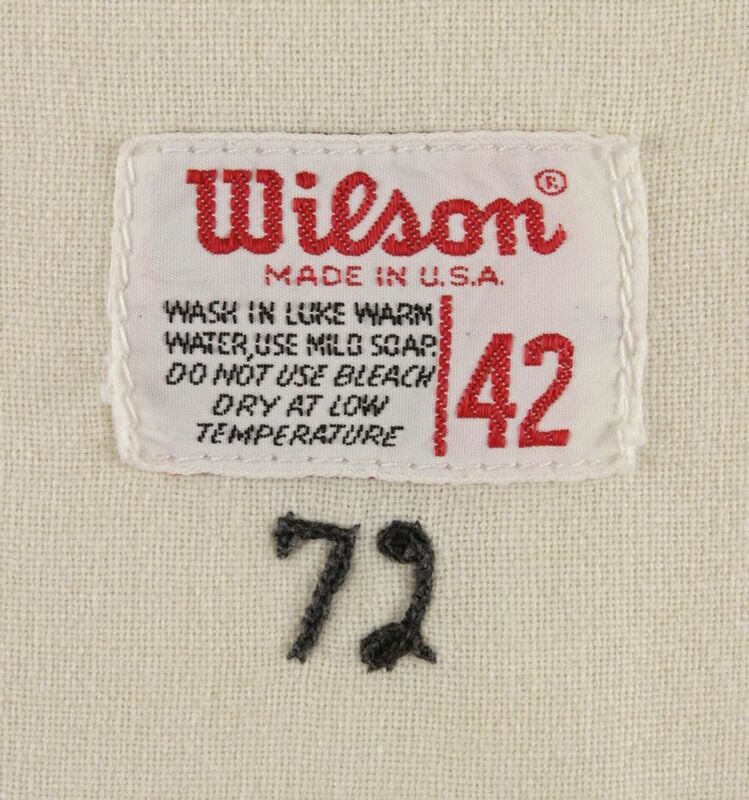 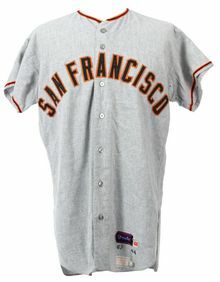 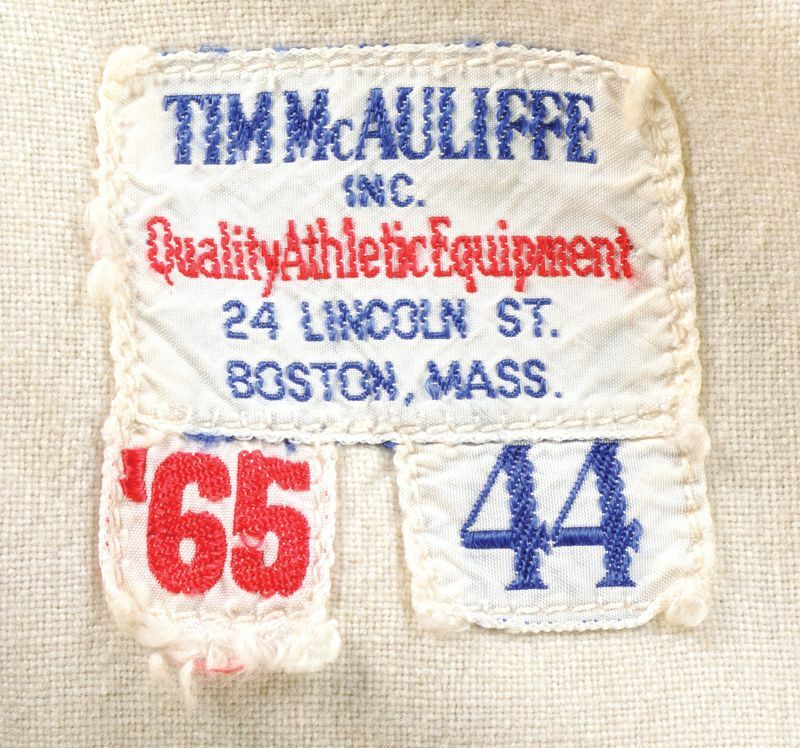 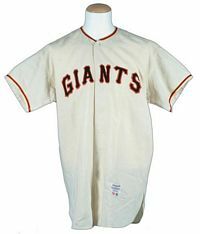 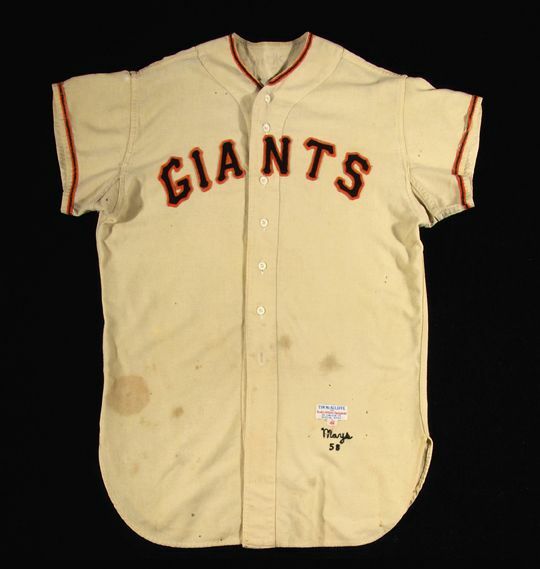 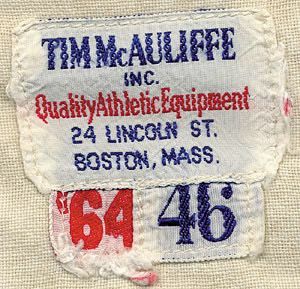 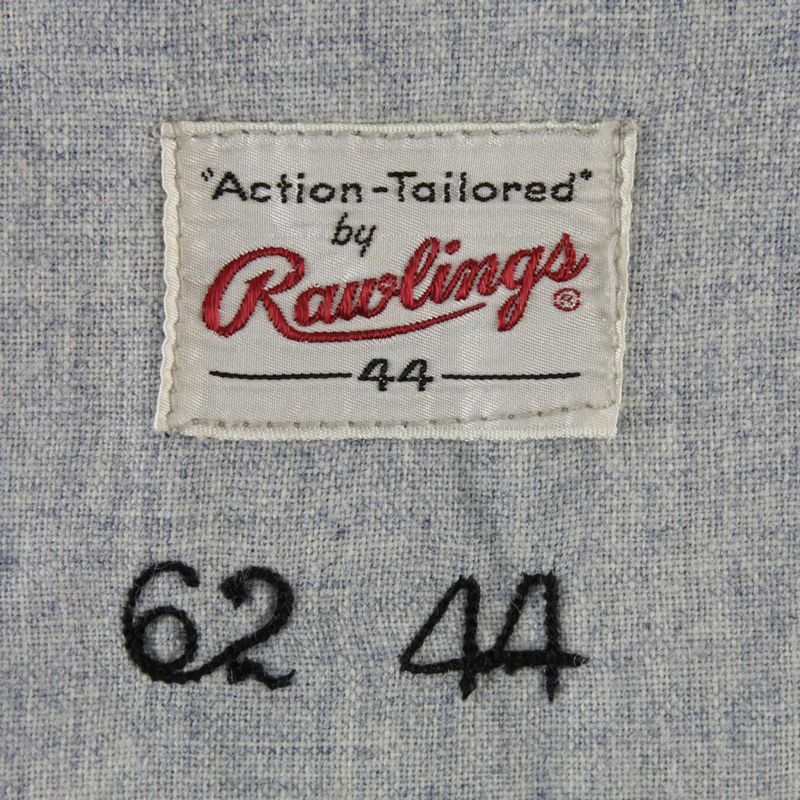 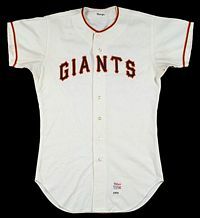 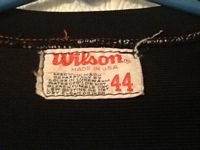 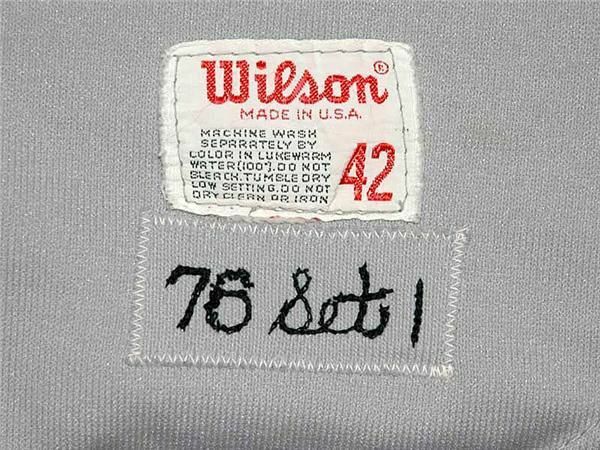 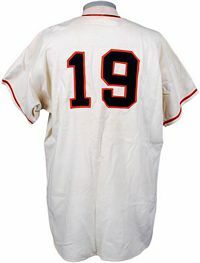 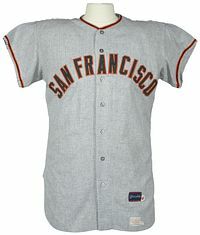 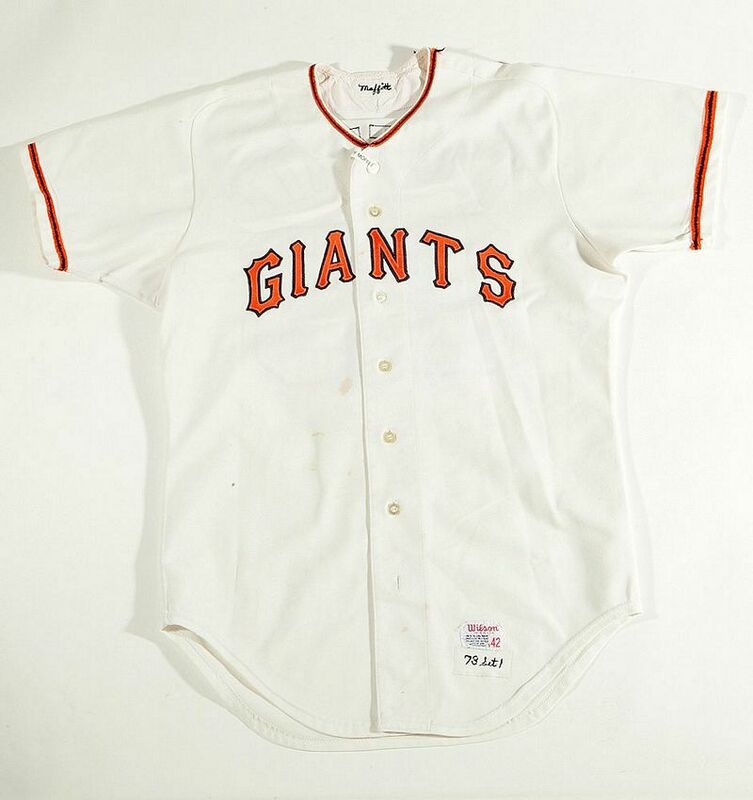 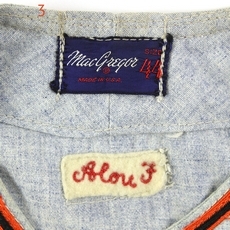 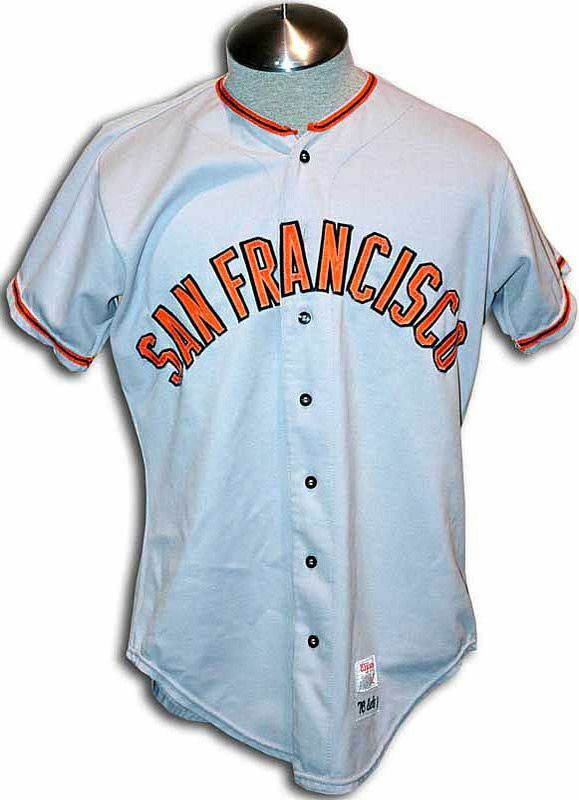 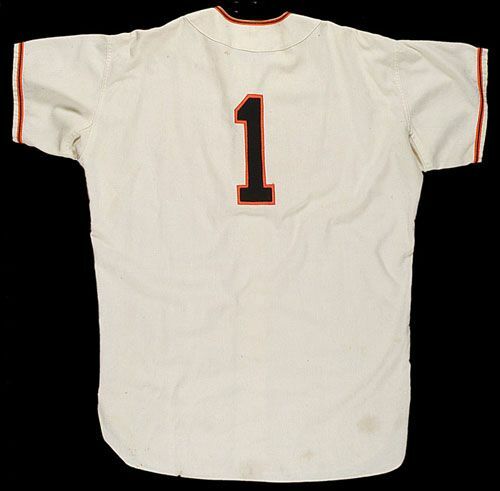 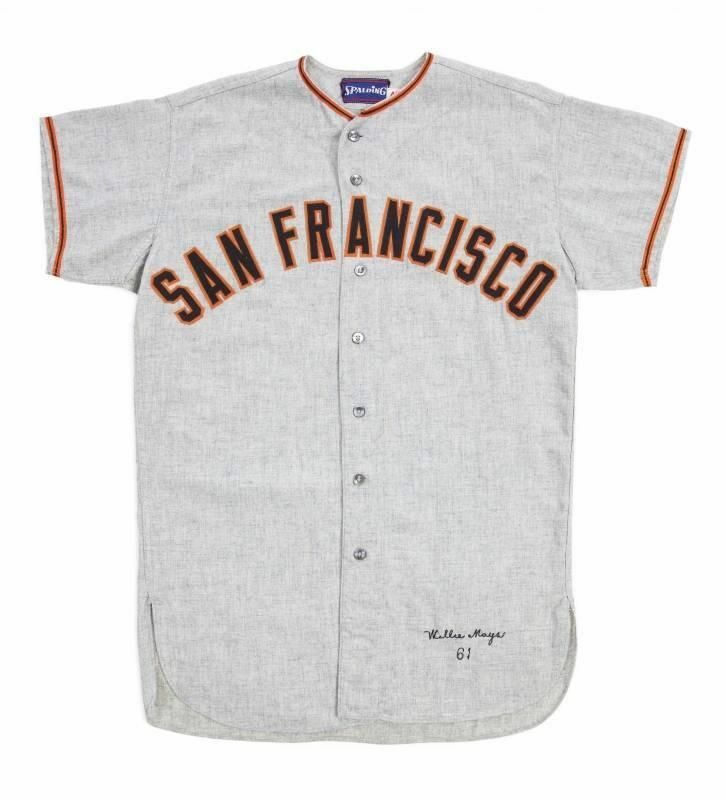 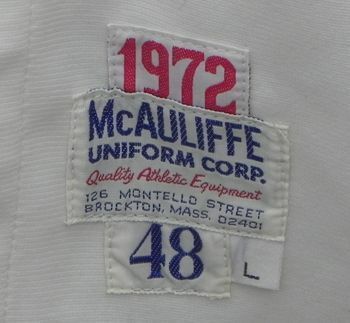 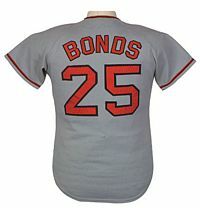 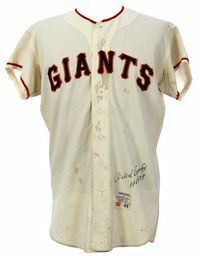 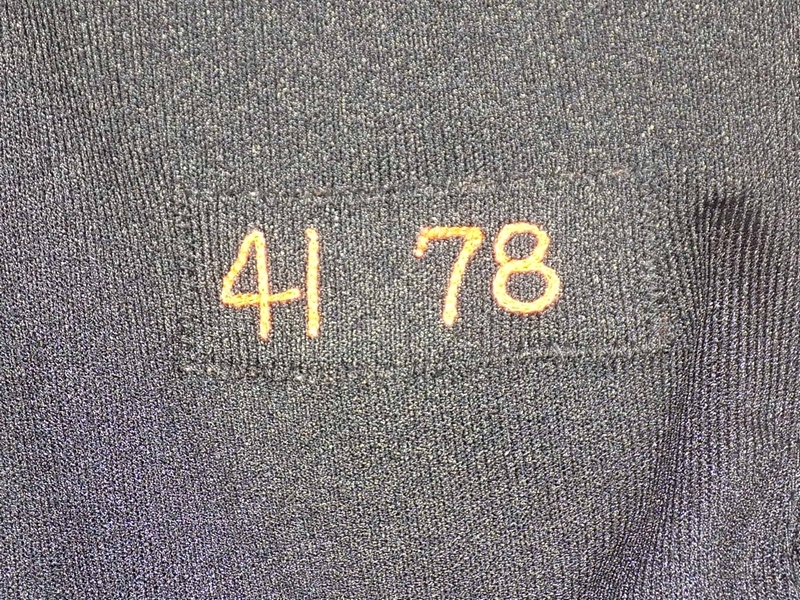 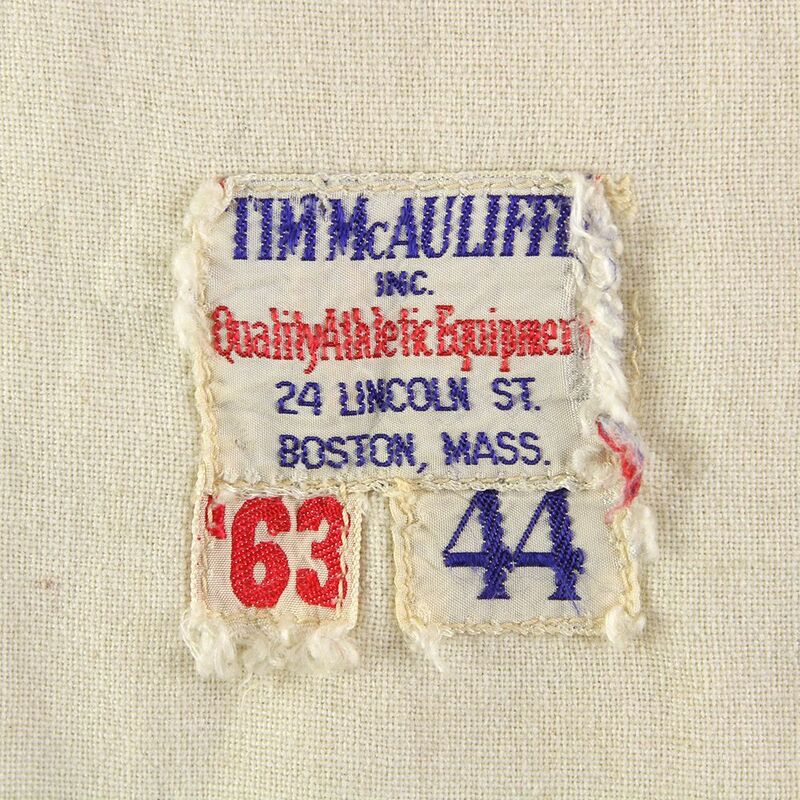 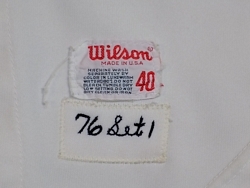 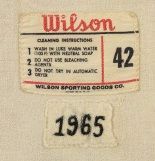 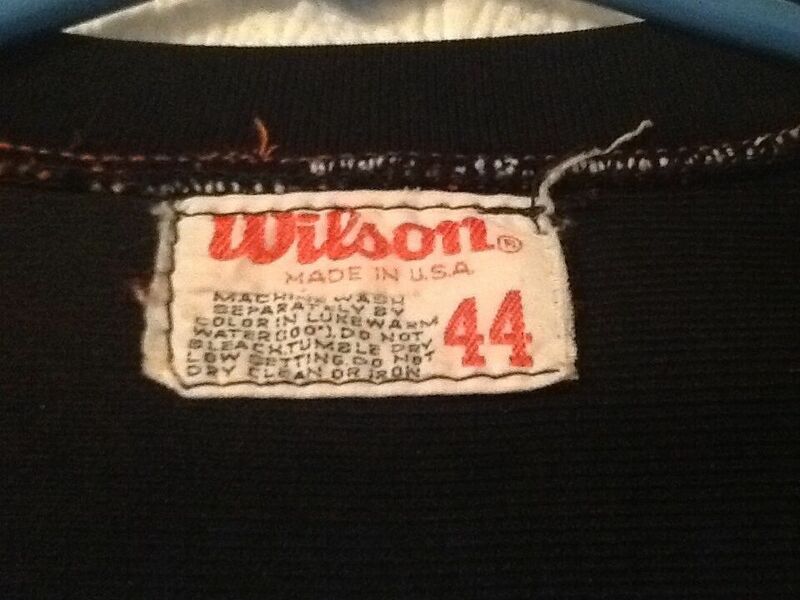 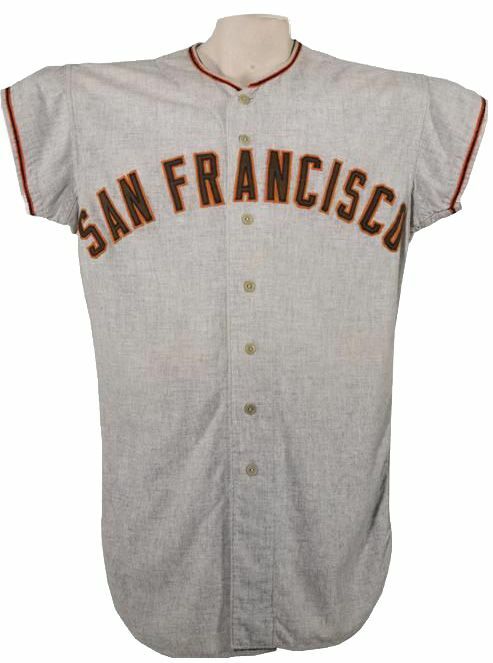 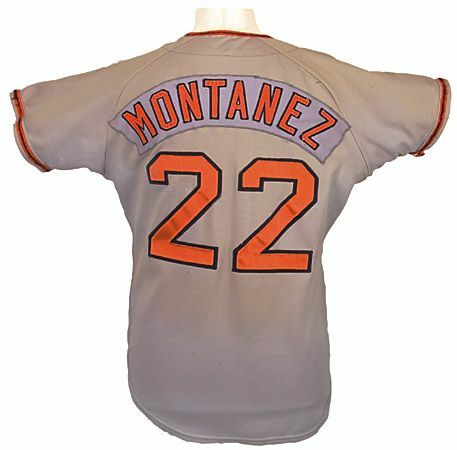 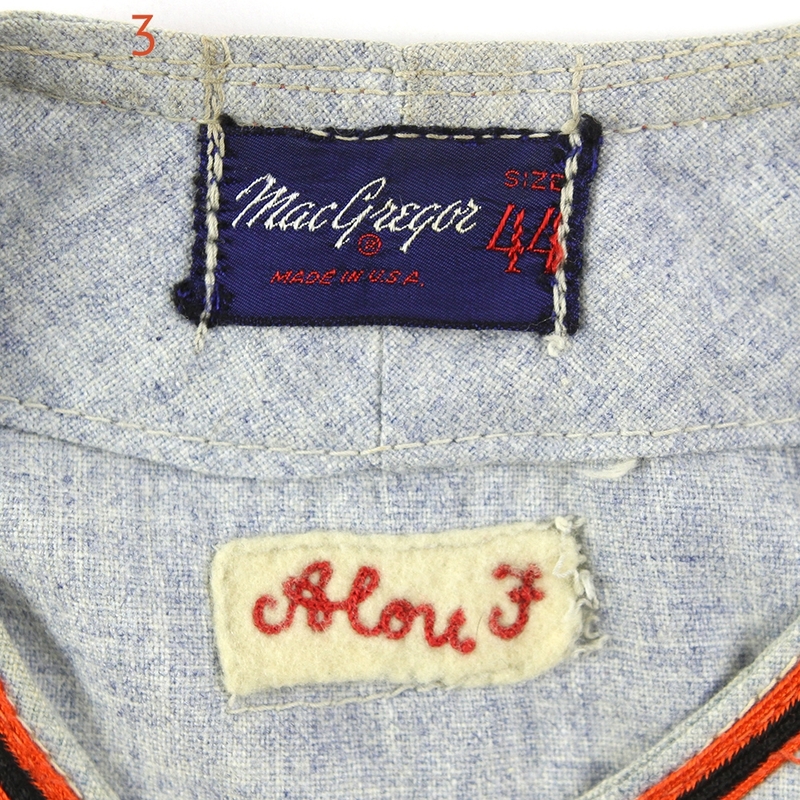 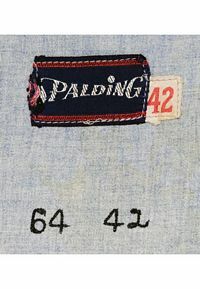 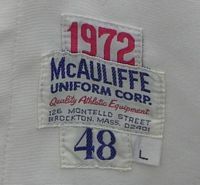 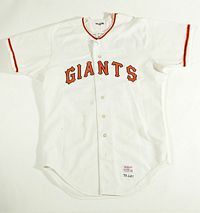 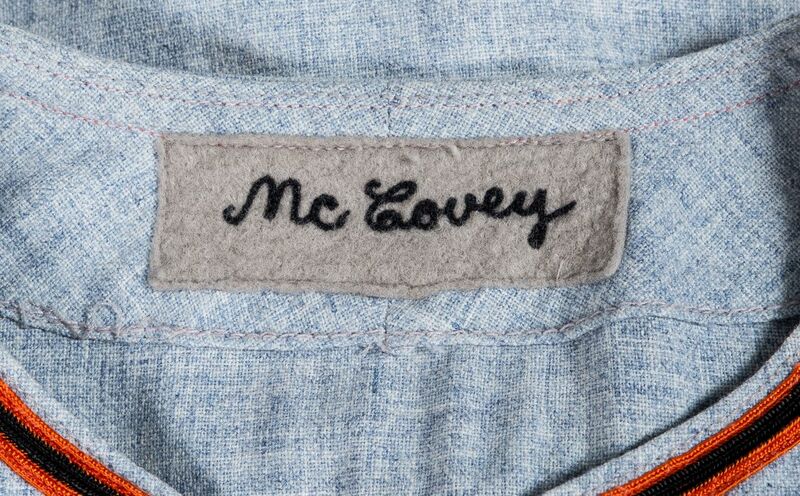 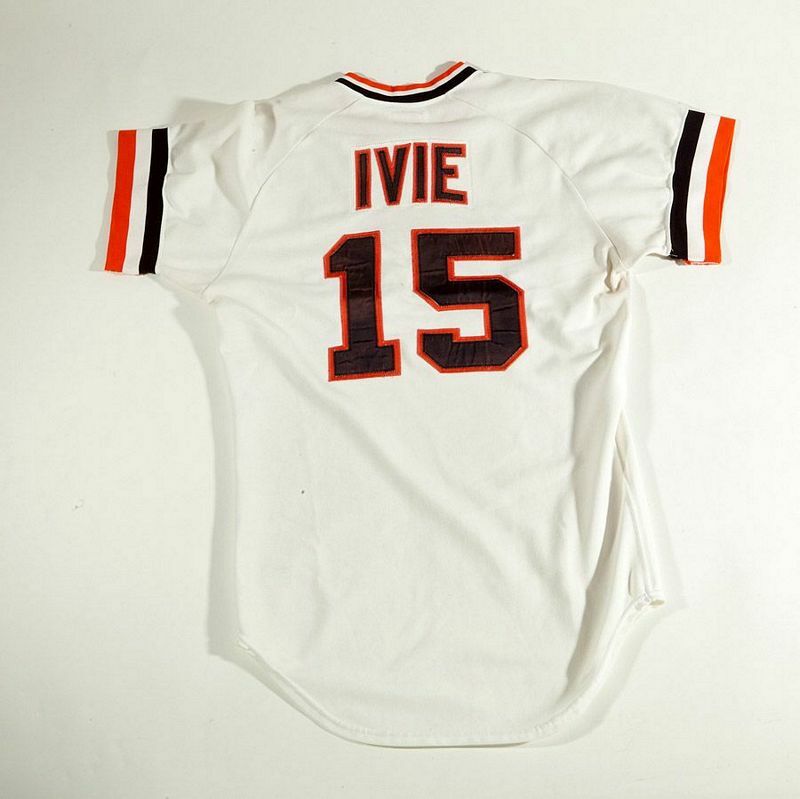 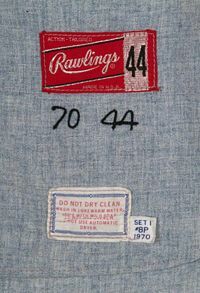 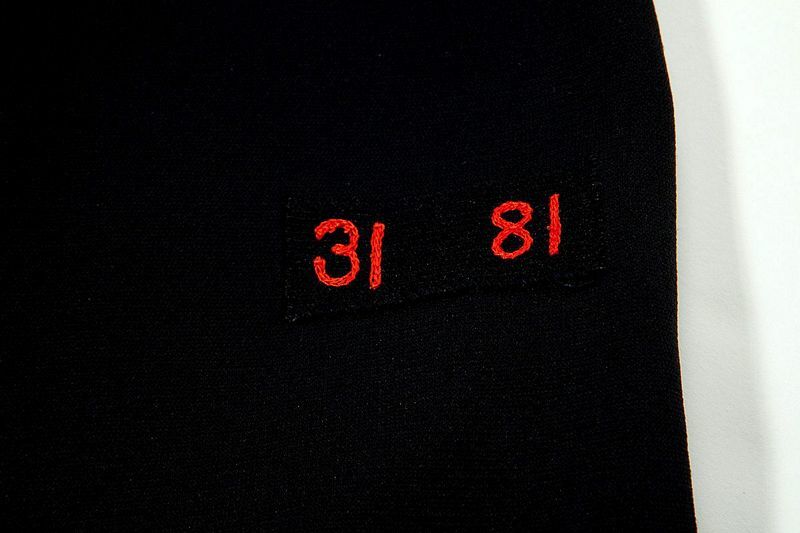 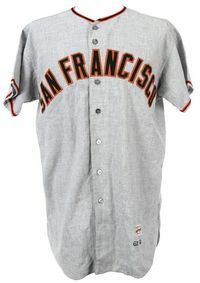 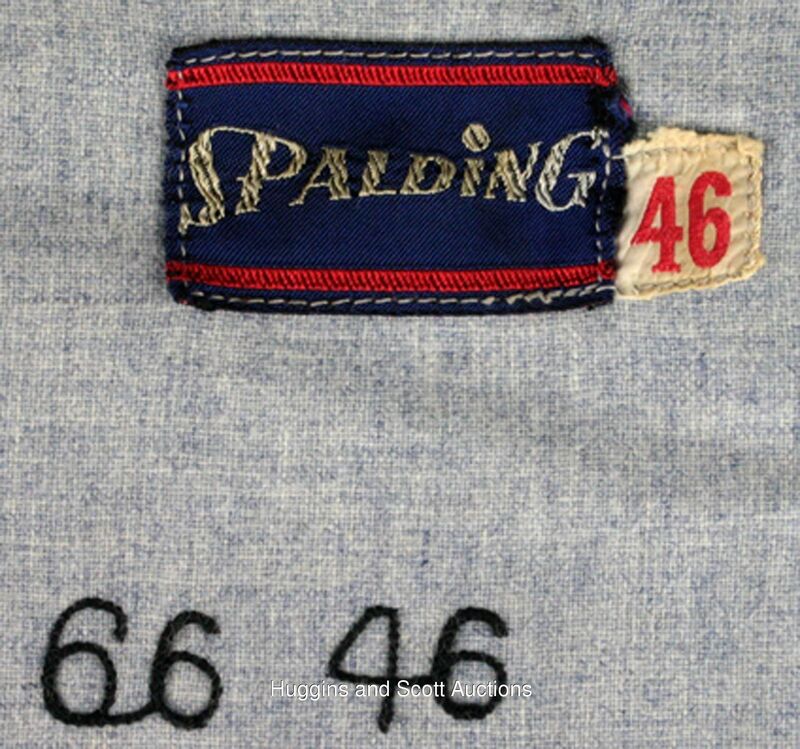 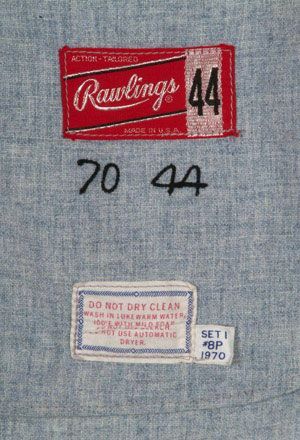 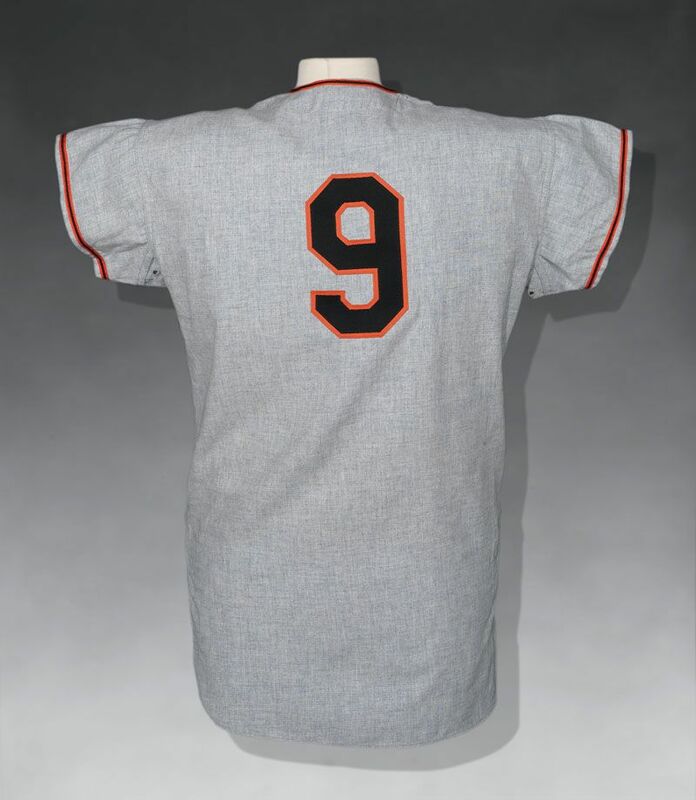 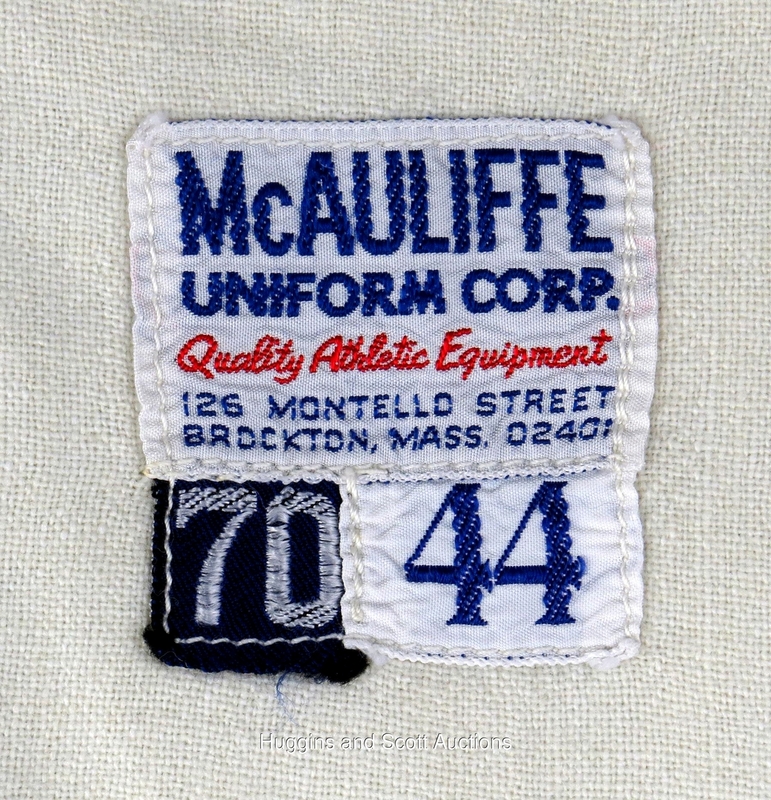 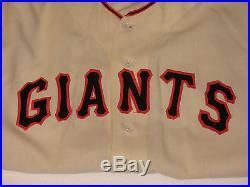 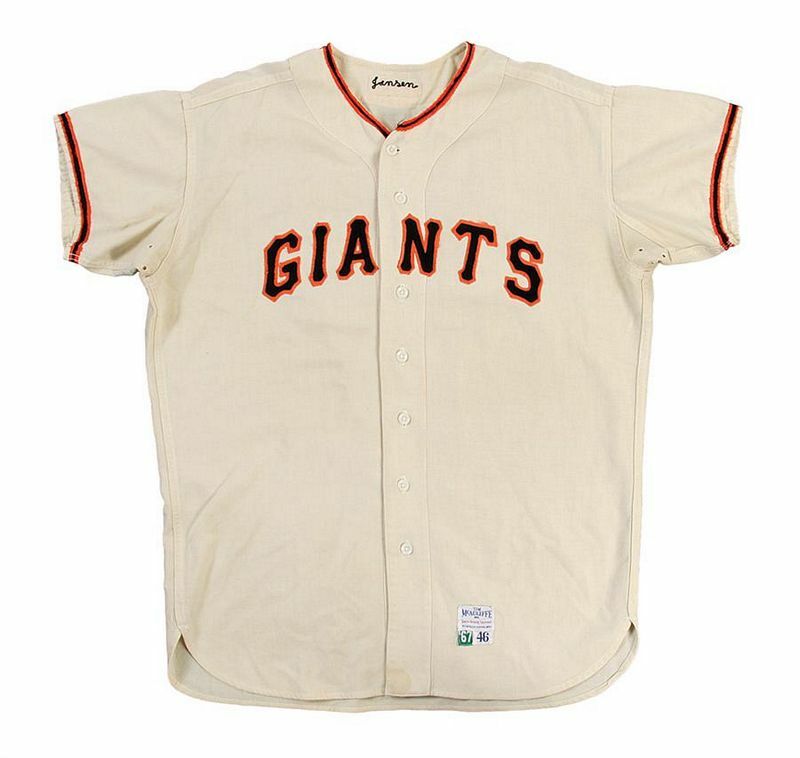 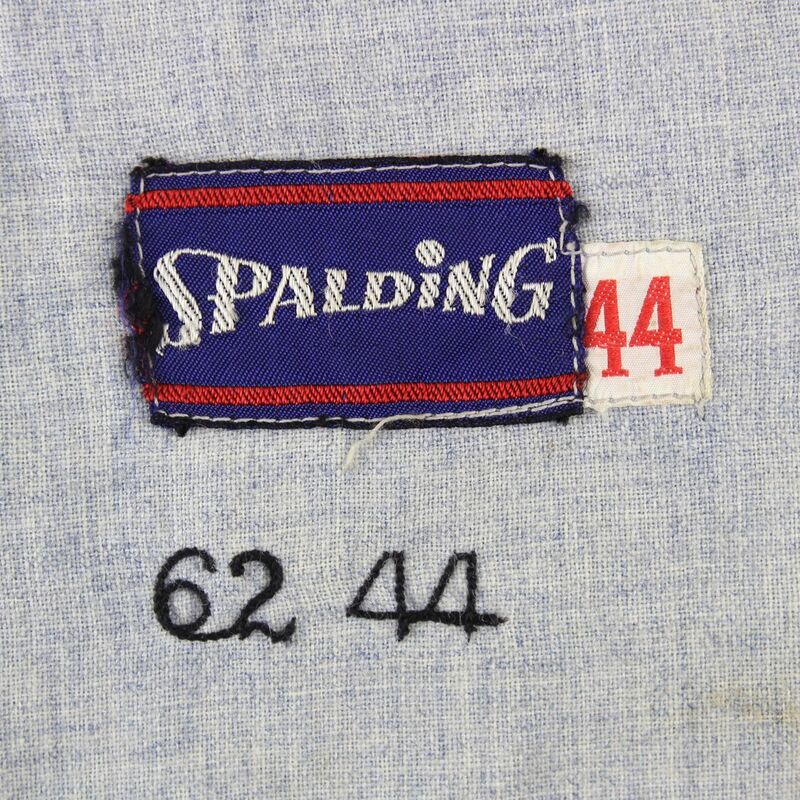 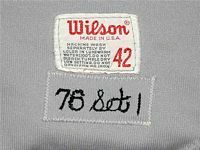 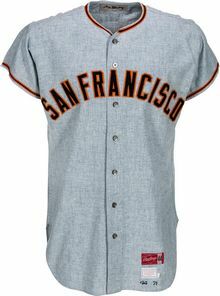 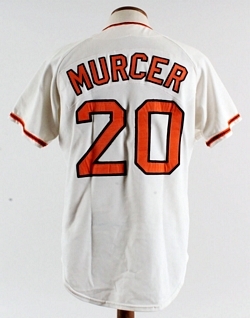 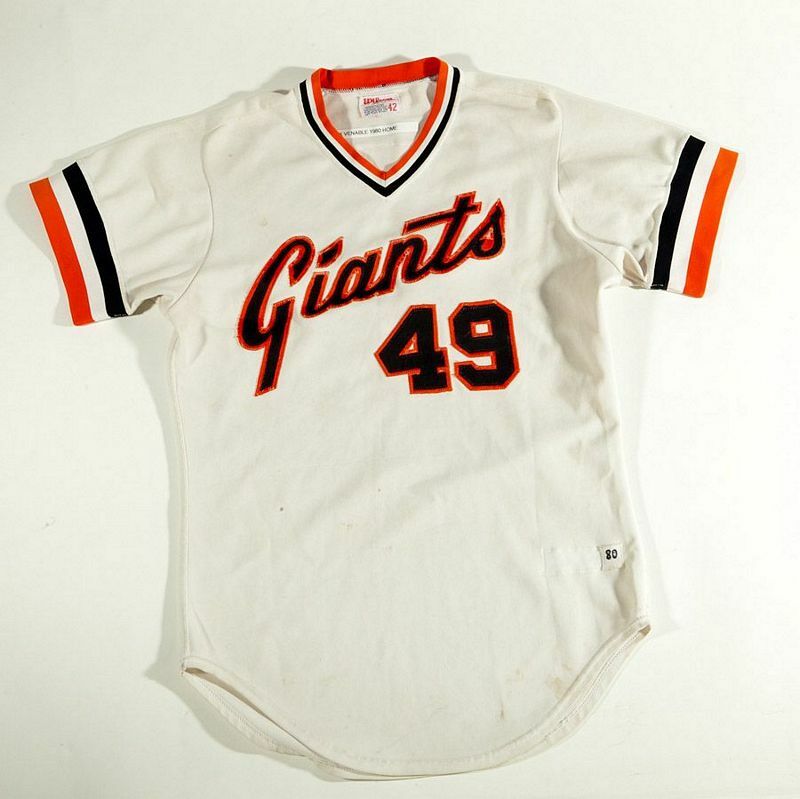 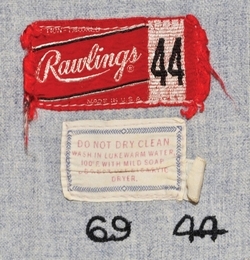 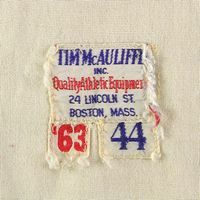 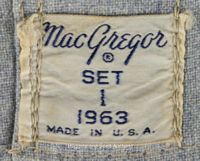 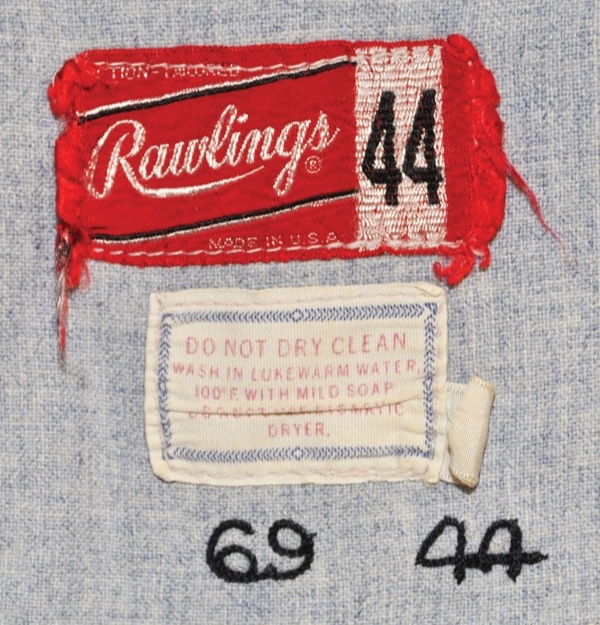 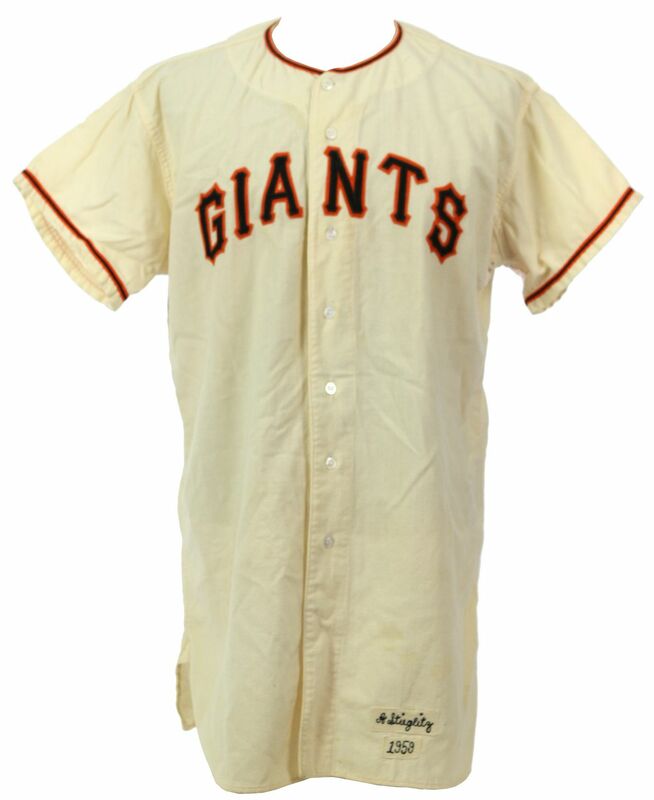 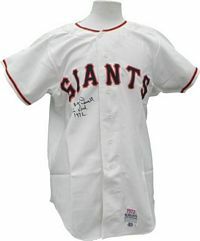 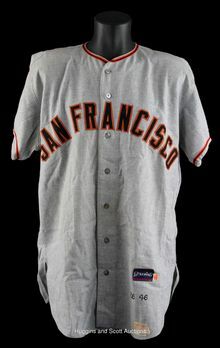 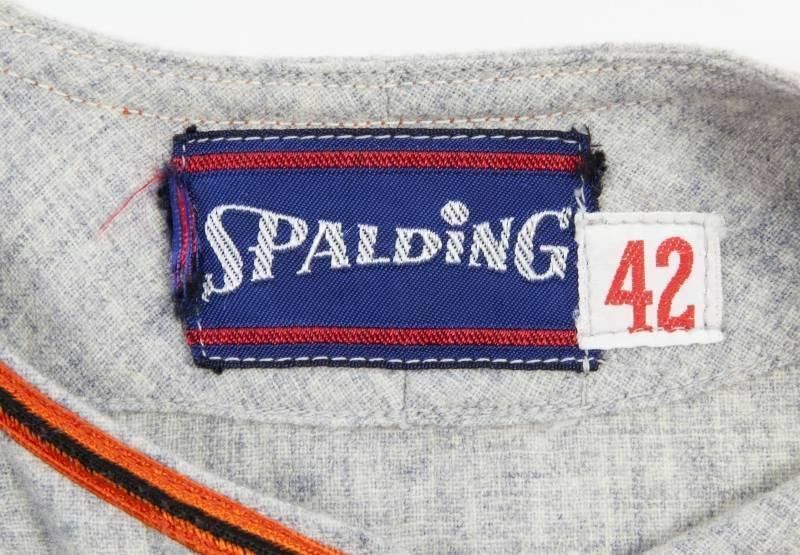 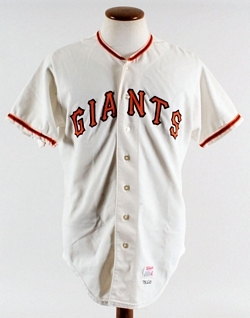 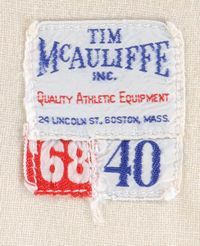 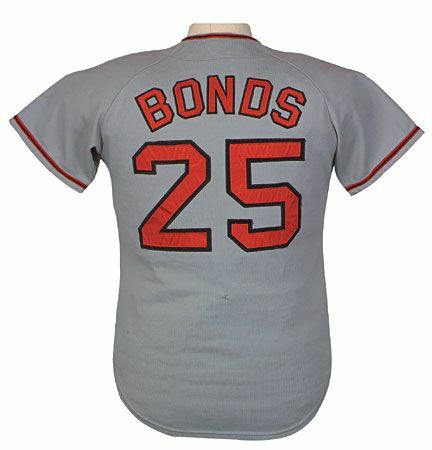 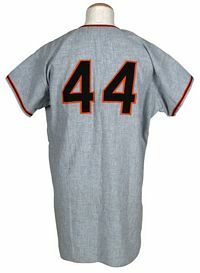 ), the second set was done professionally by the tailor for the Oakland A's. 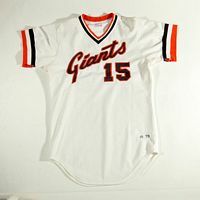 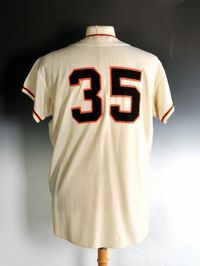 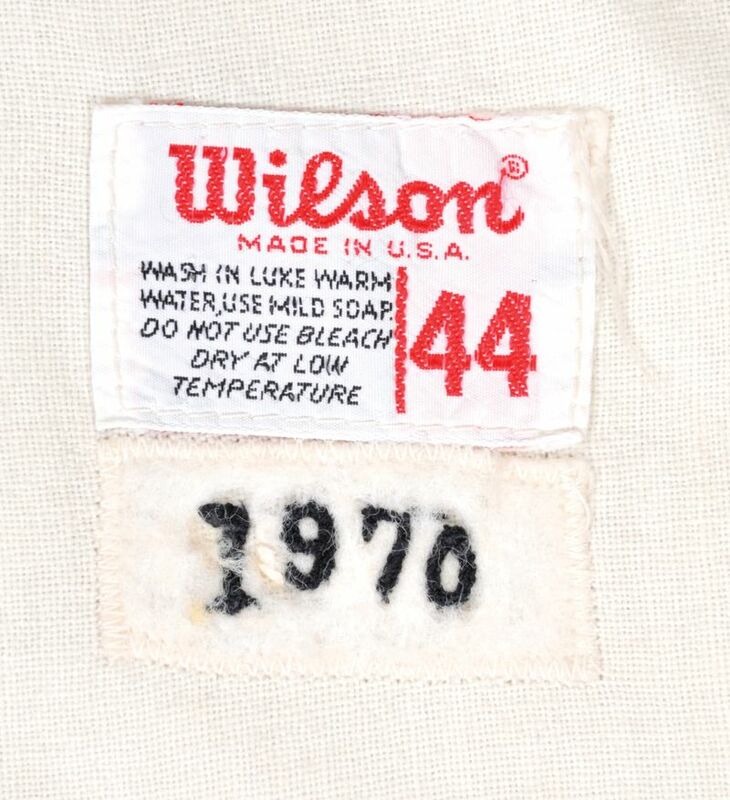 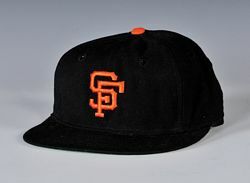 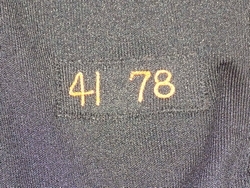 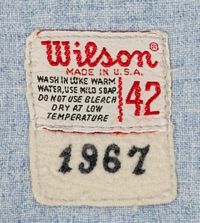 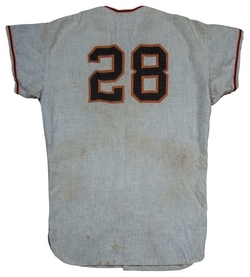 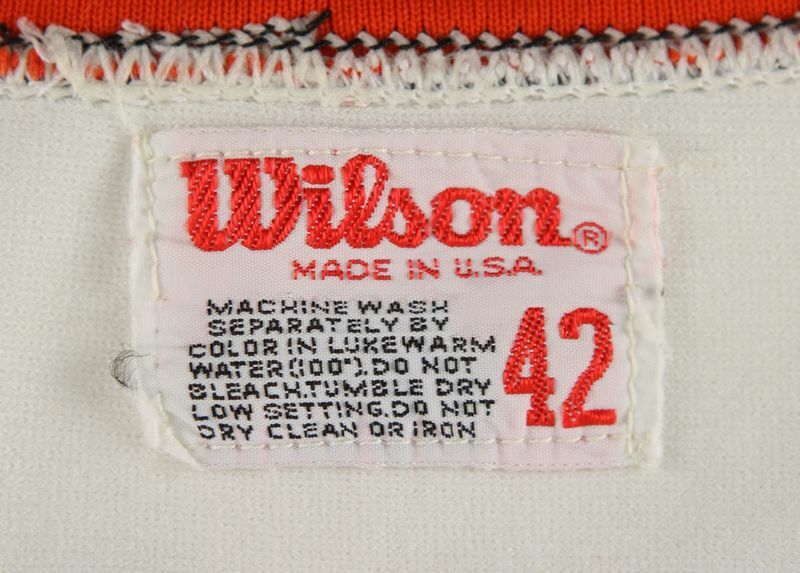 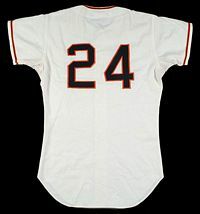 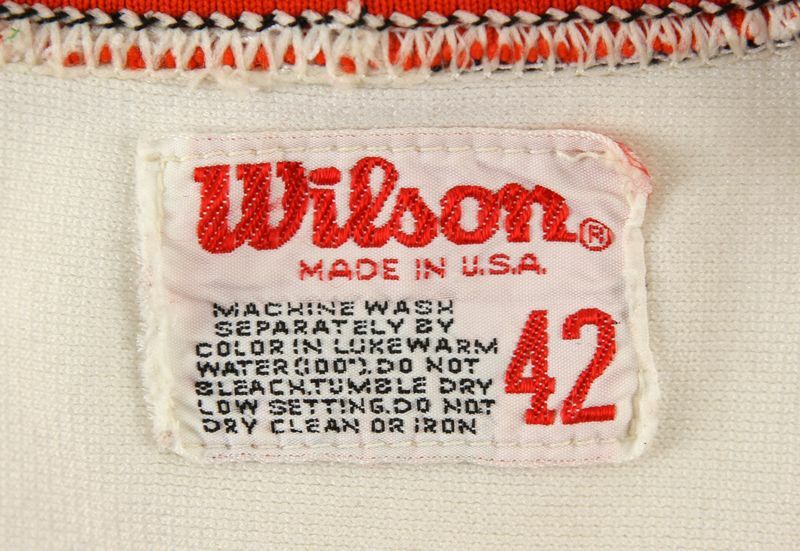 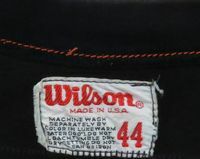 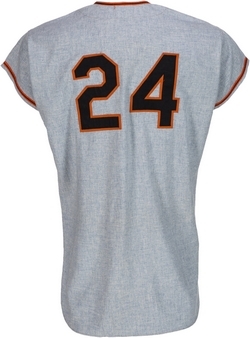 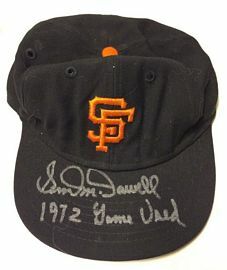 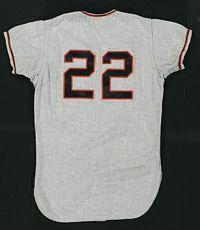 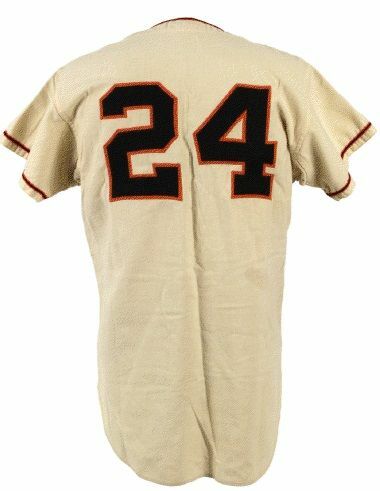 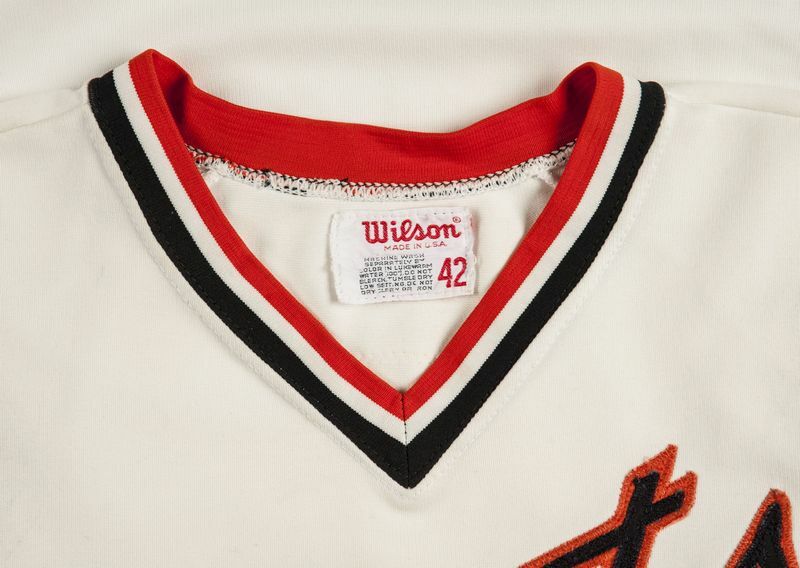 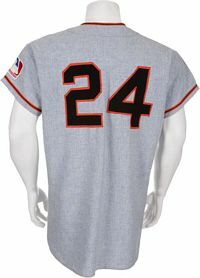 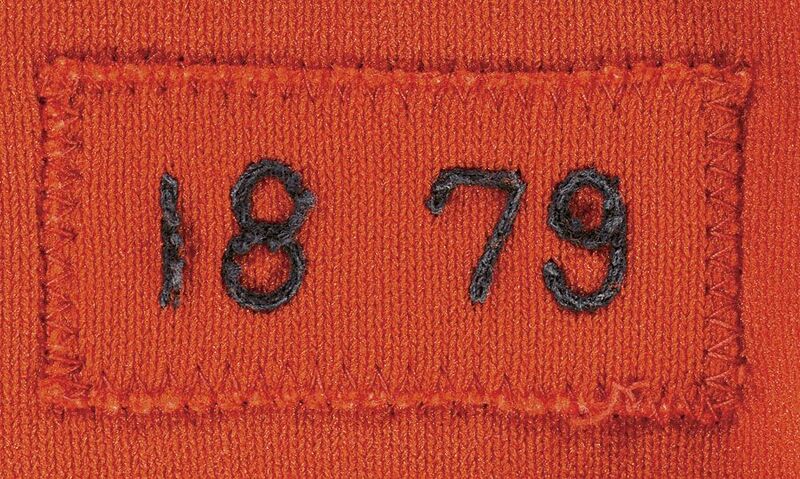 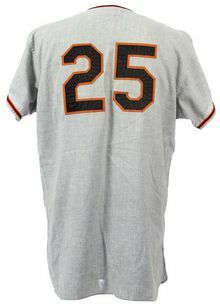 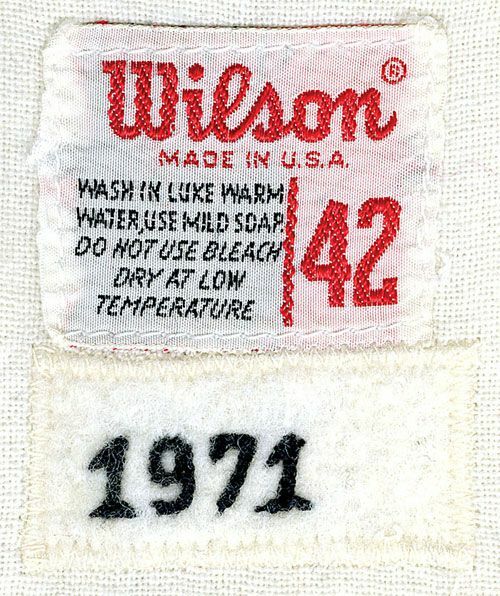 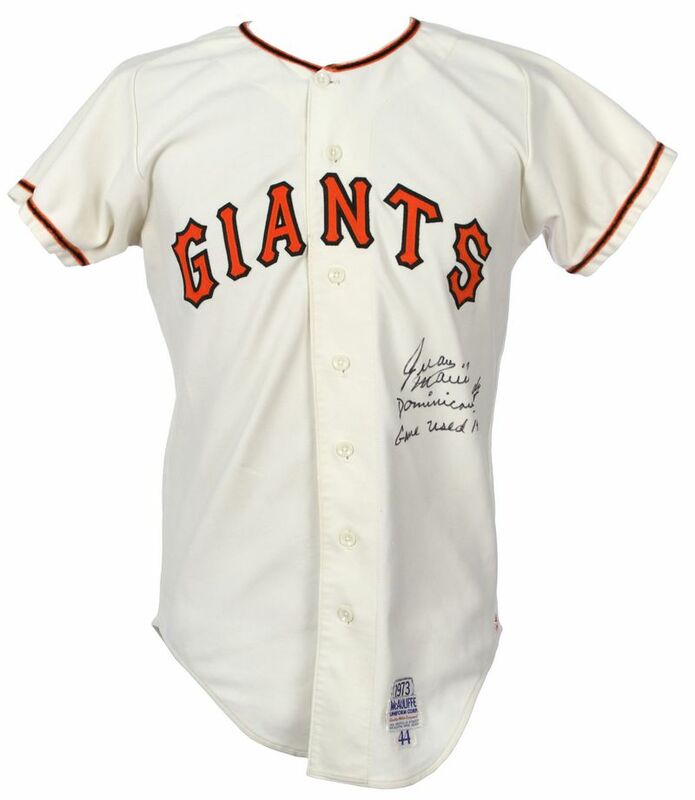 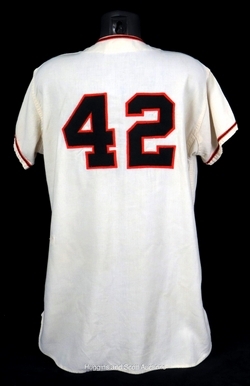 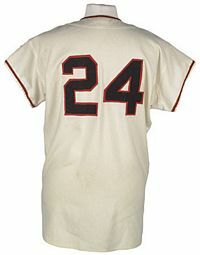 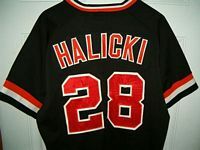 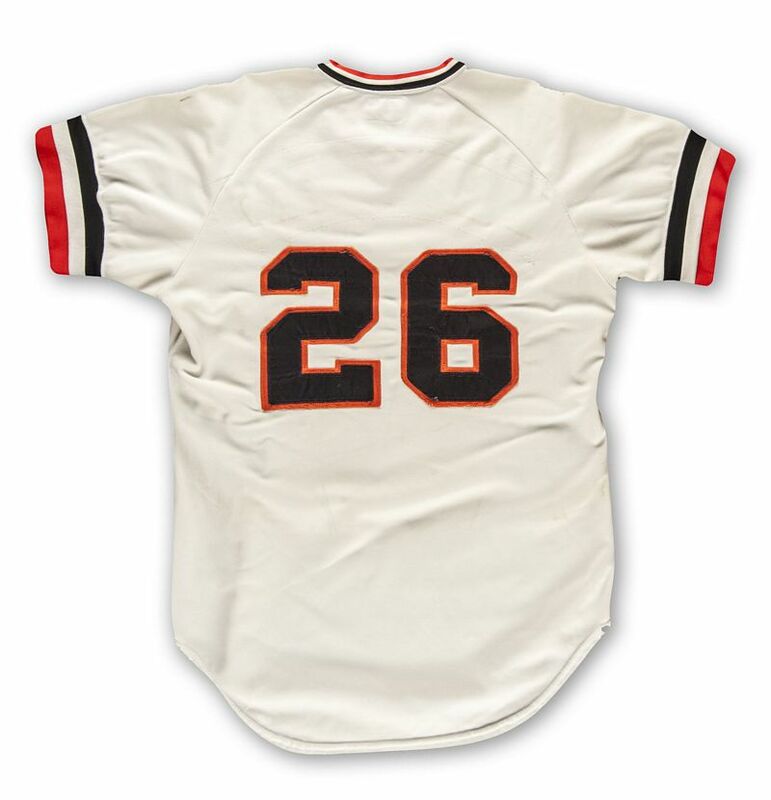 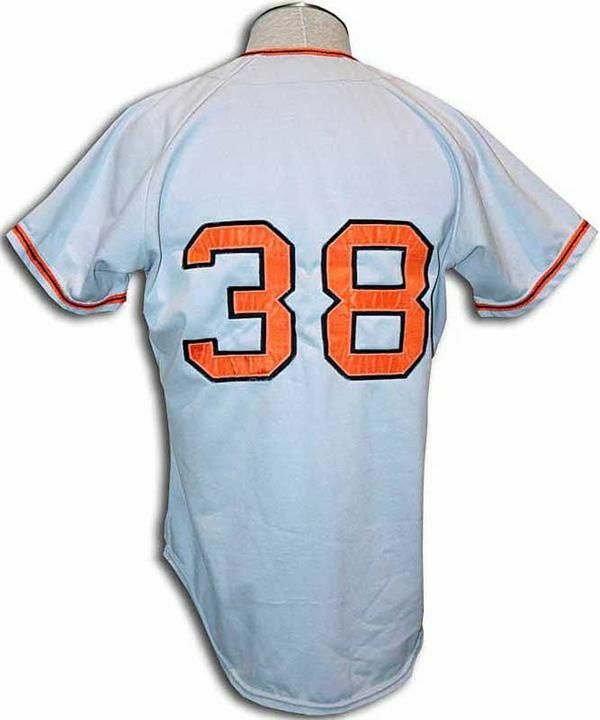 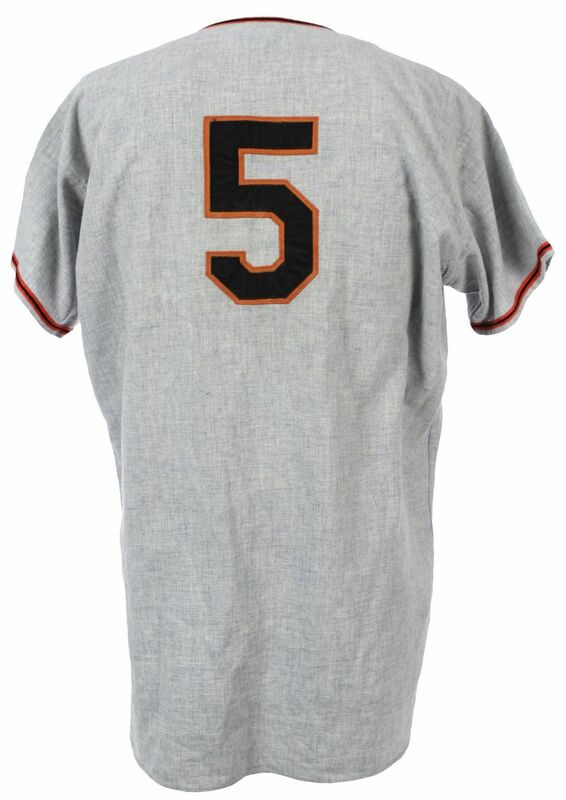 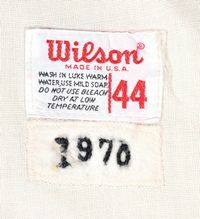 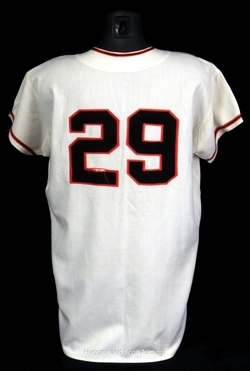 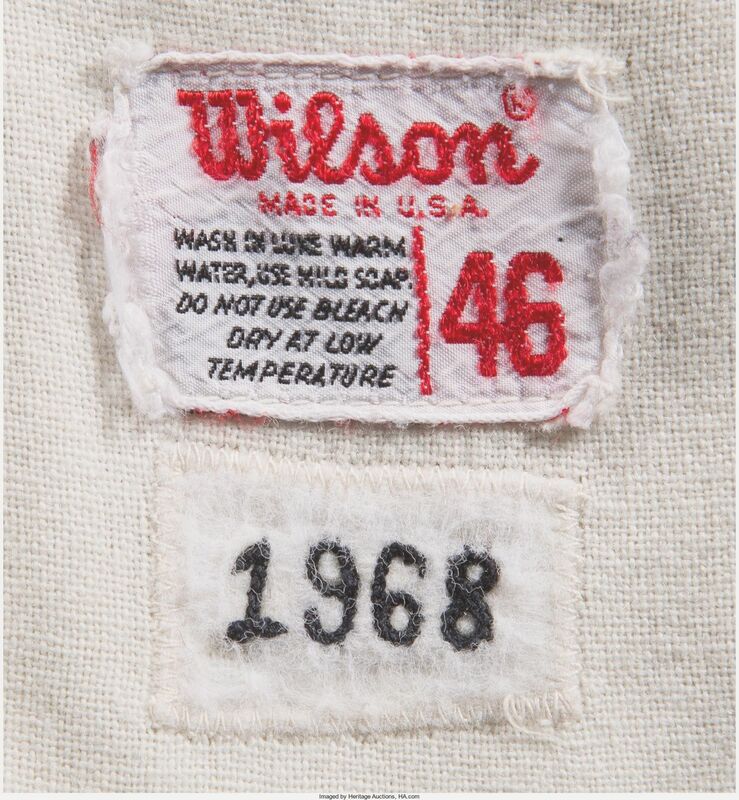 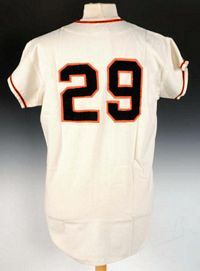 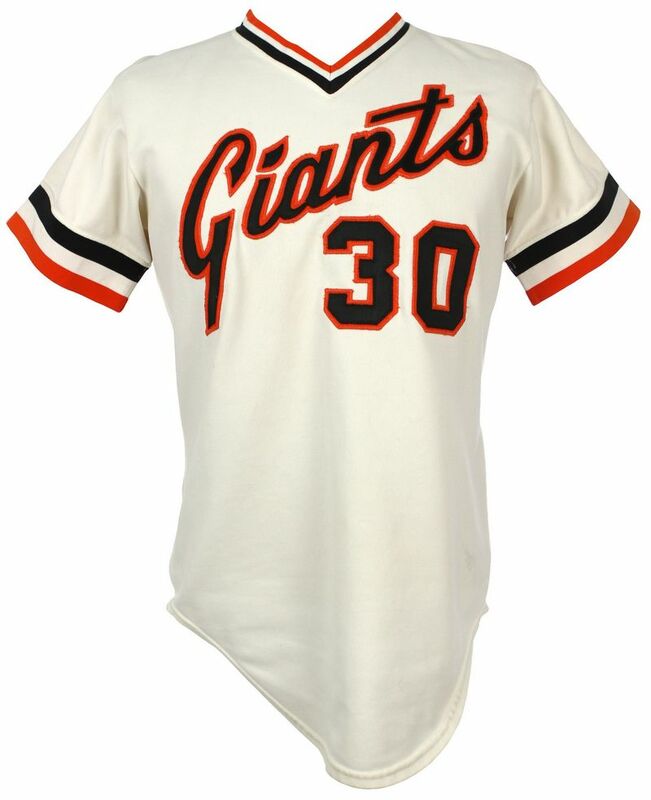 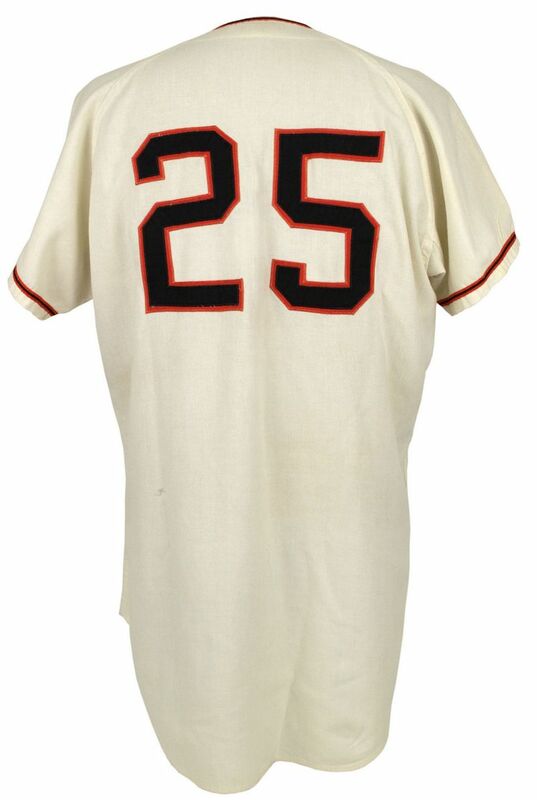 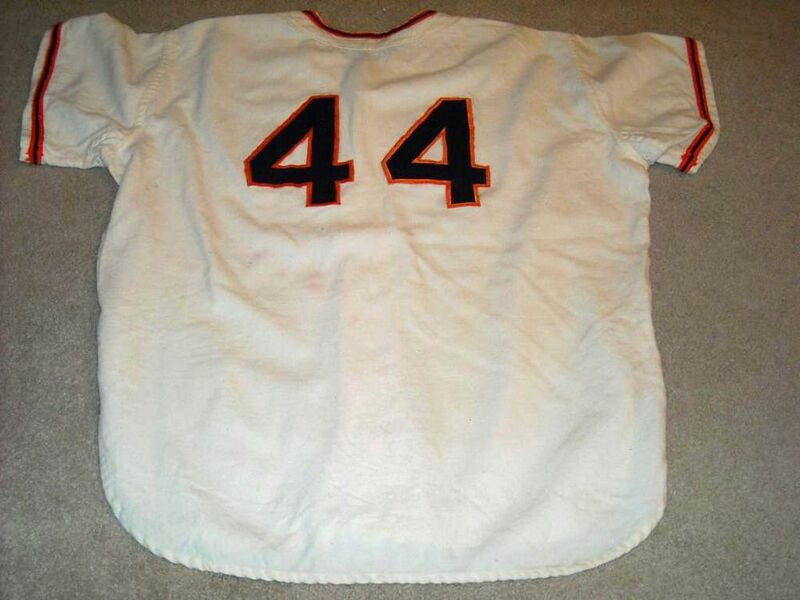 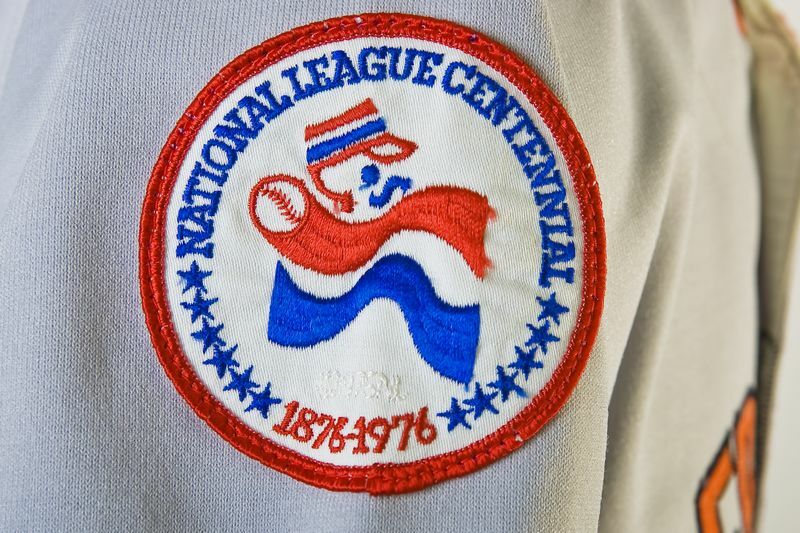 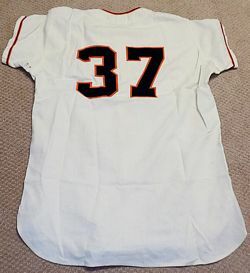 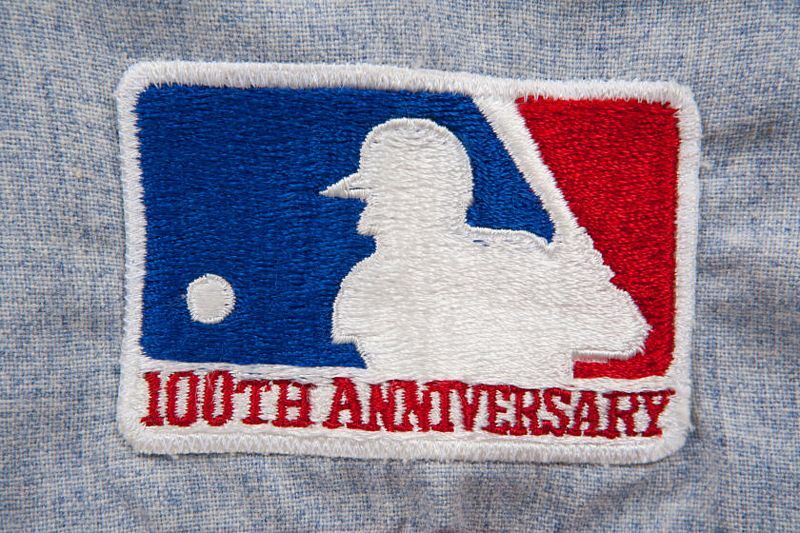 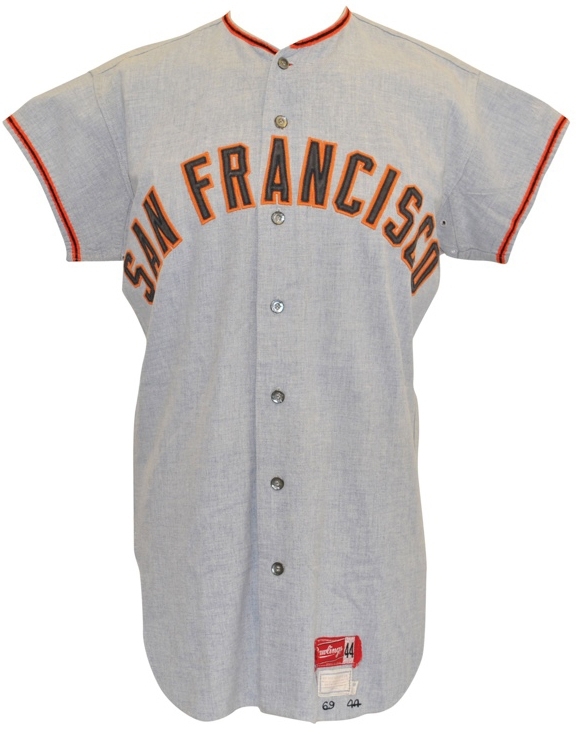 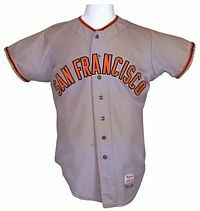 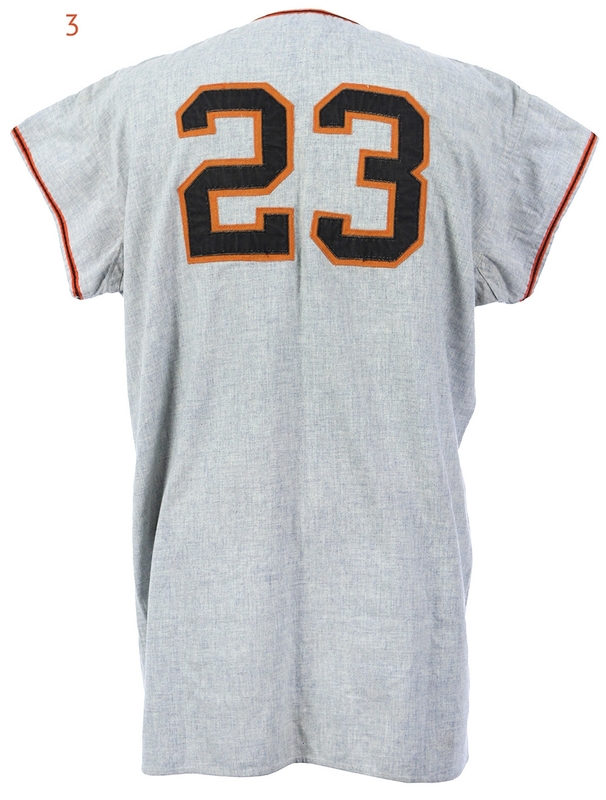 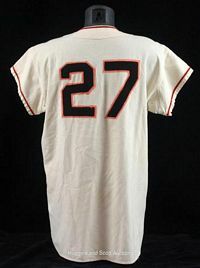 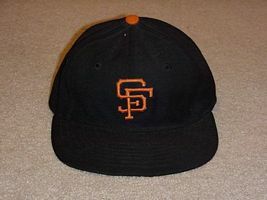 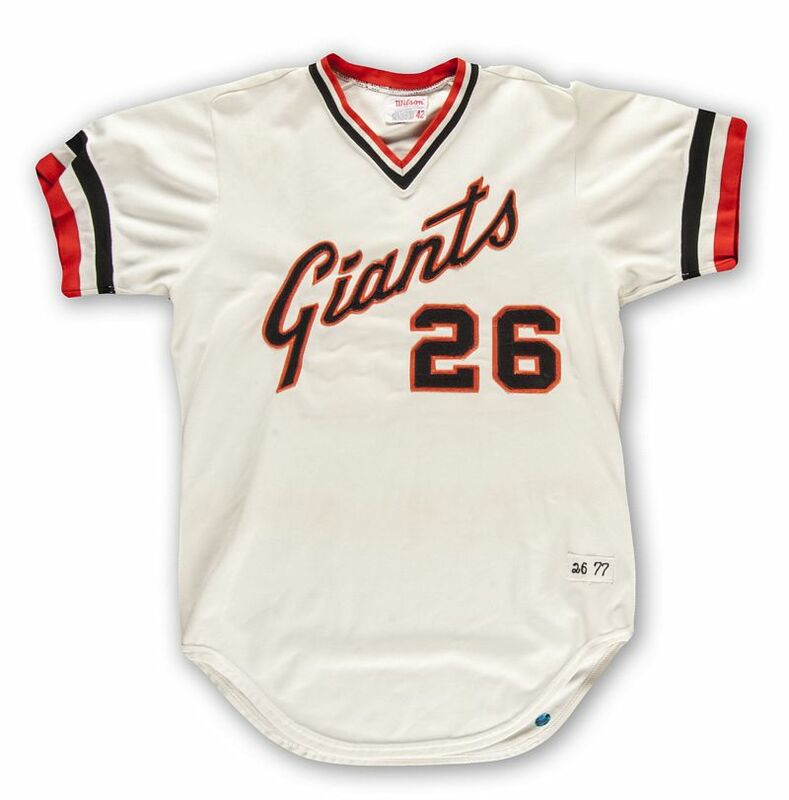 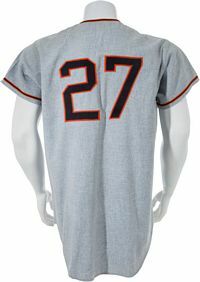 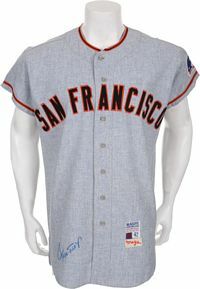 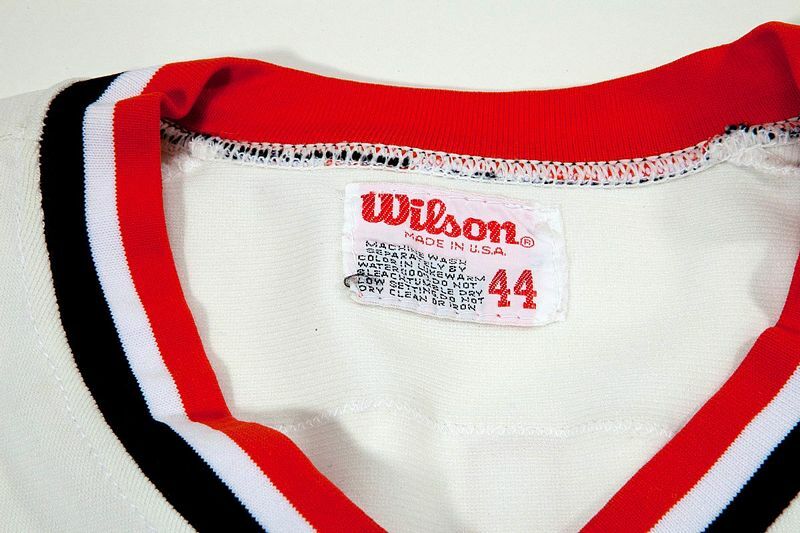 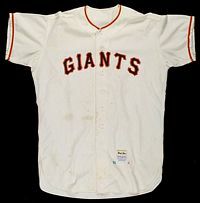 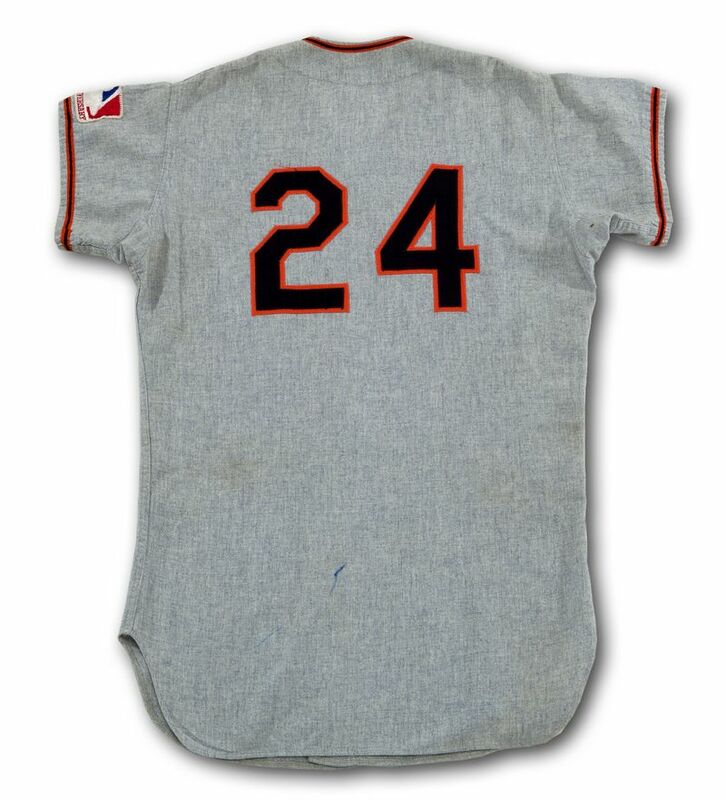 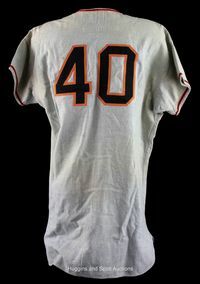 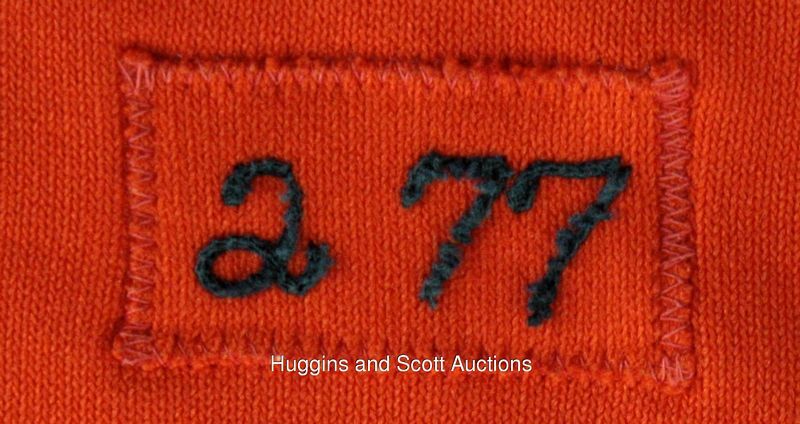 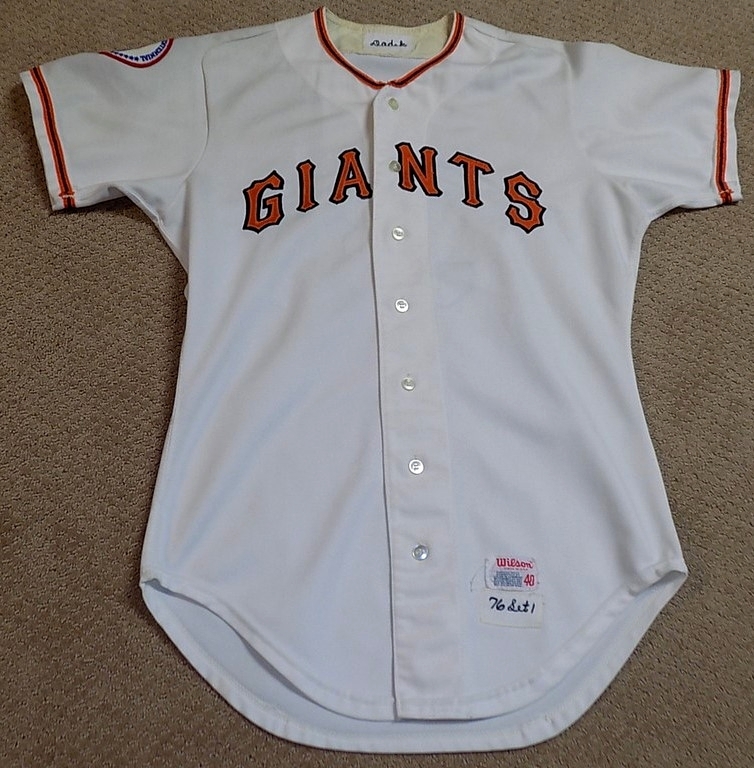 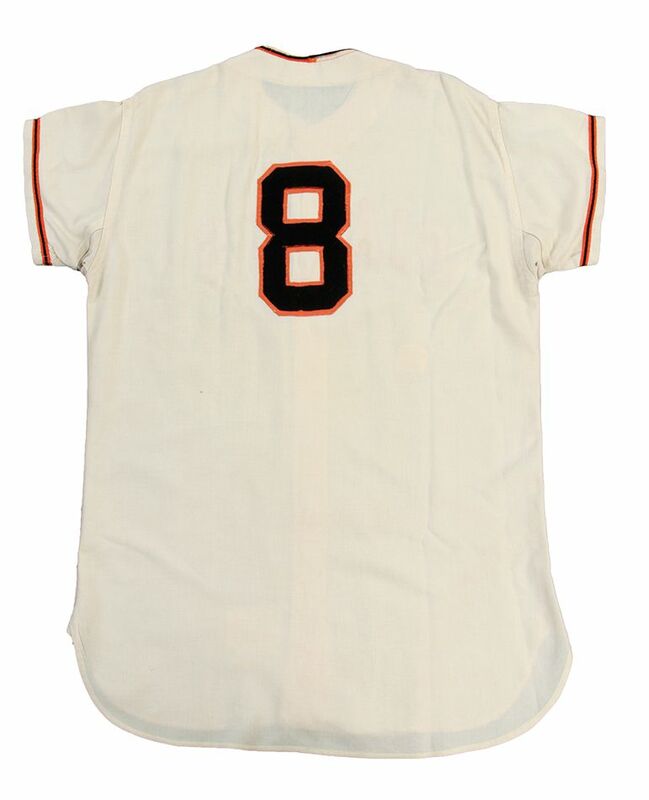 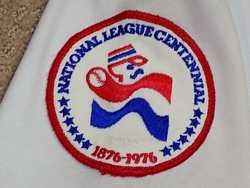 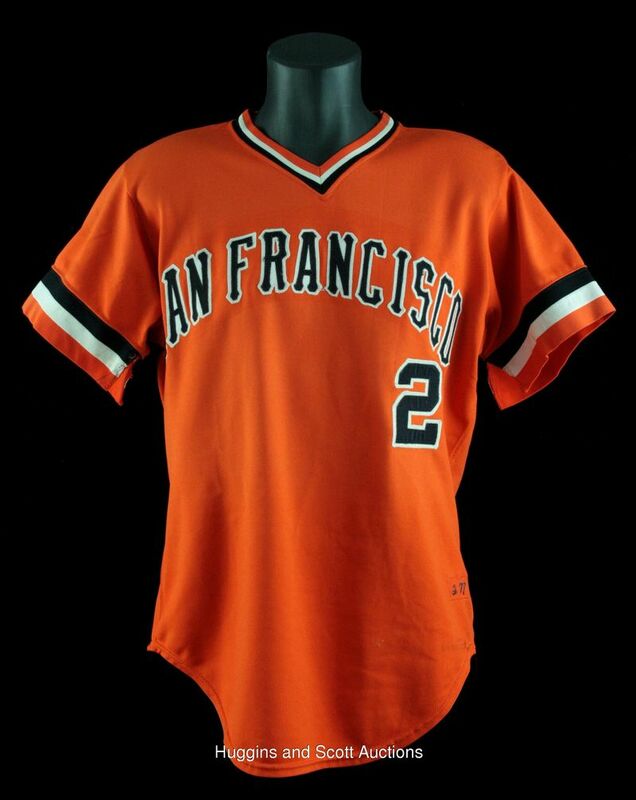 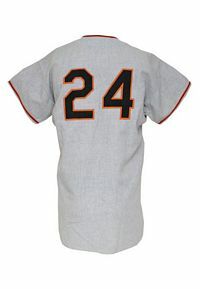 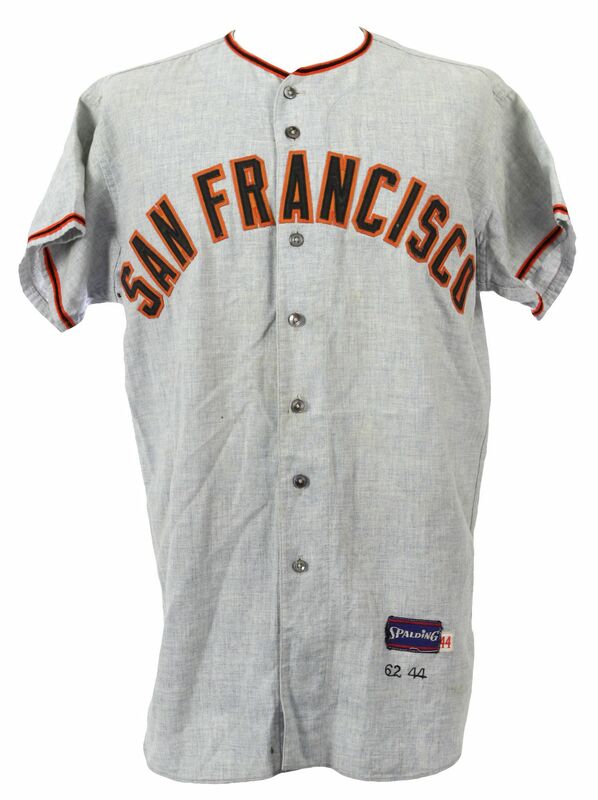 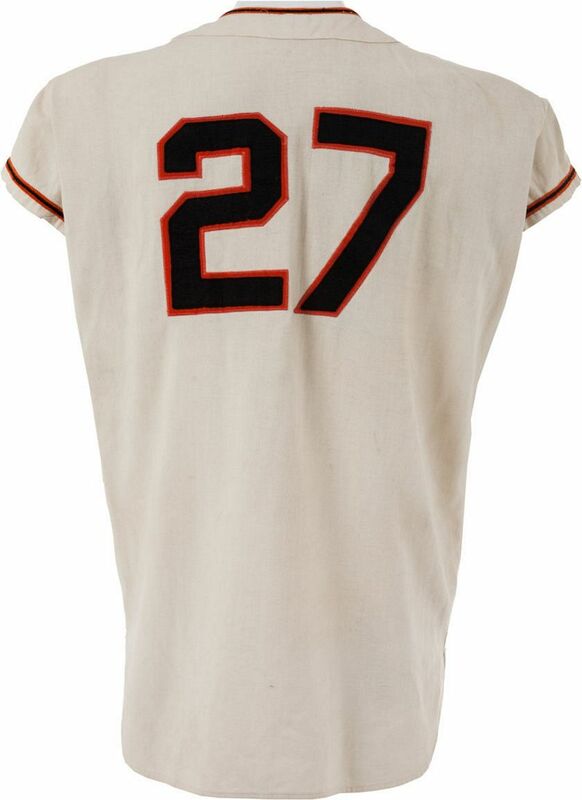 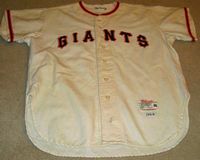 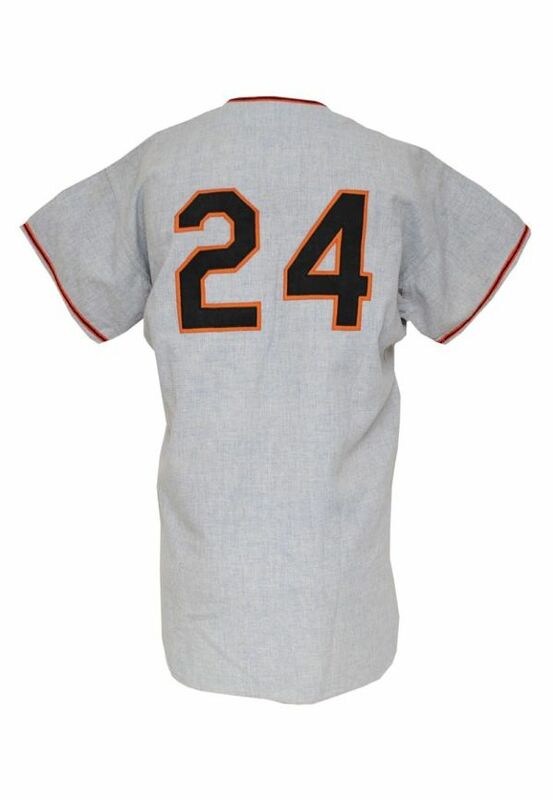 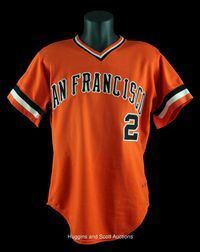 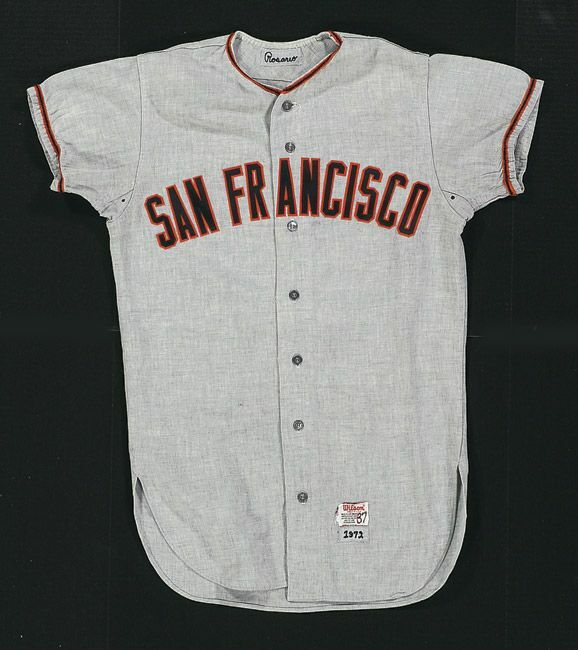 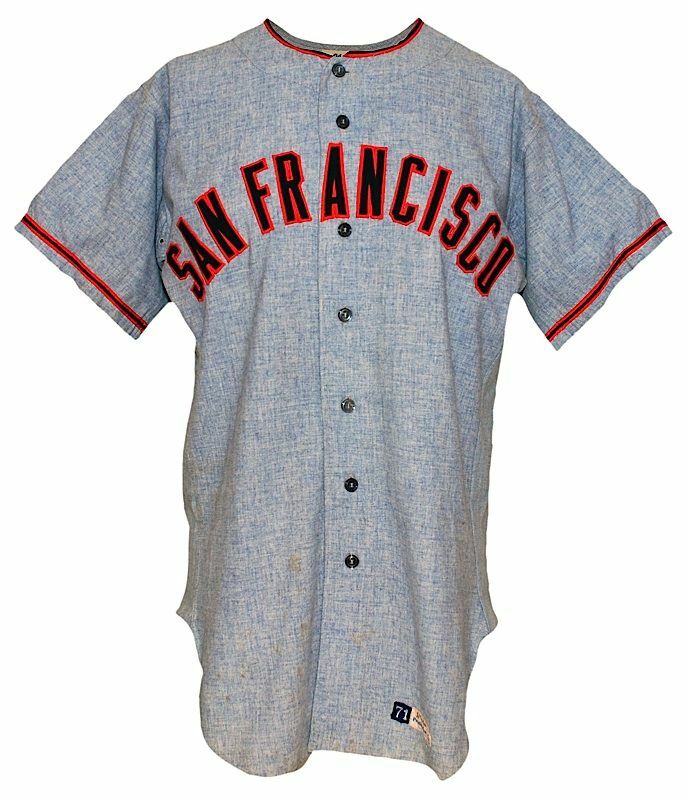 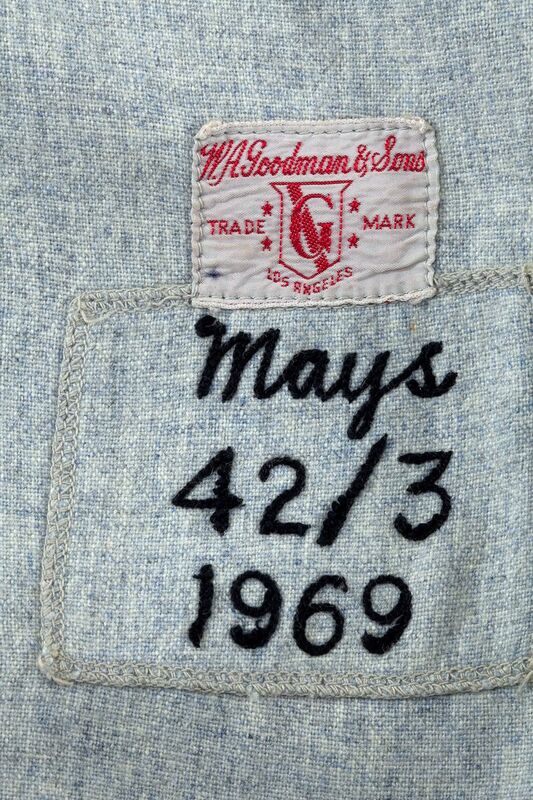 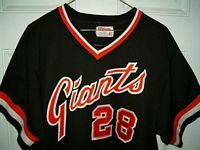 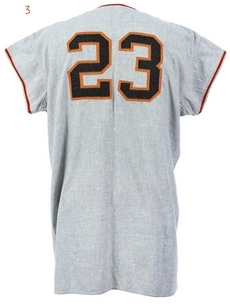 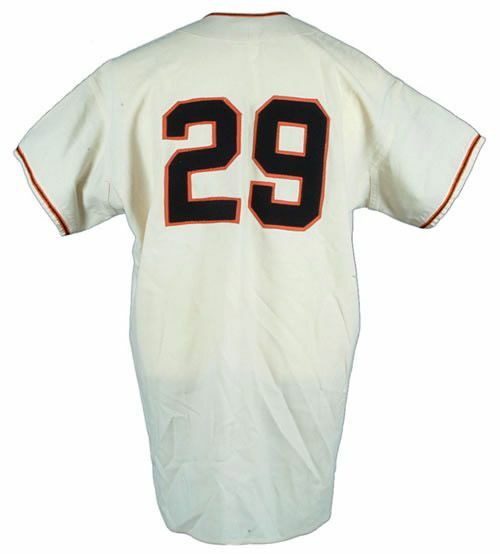 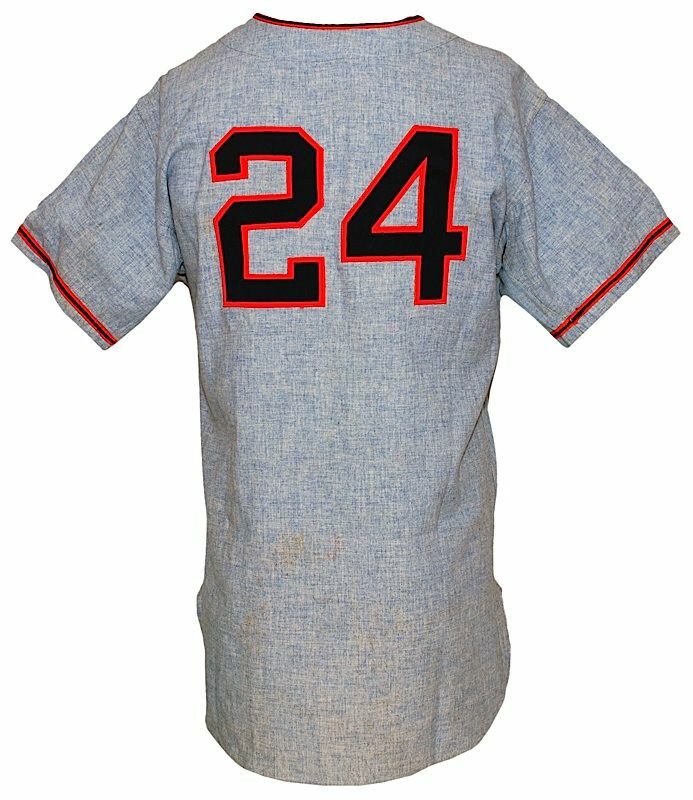 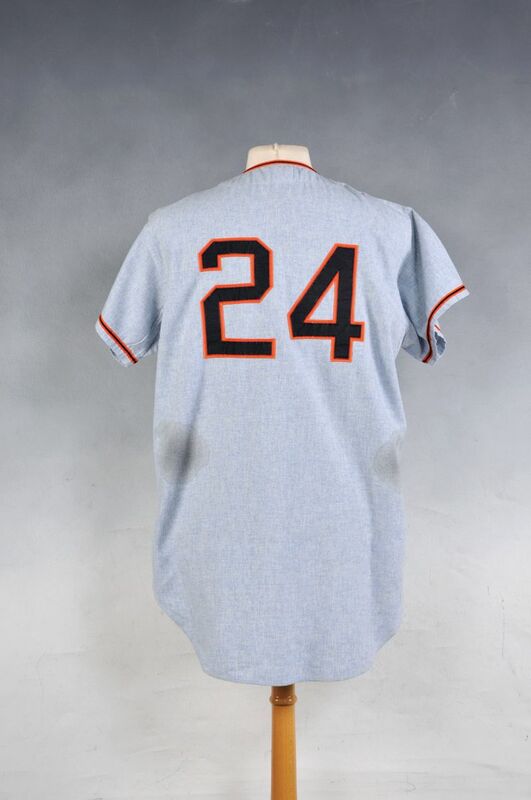 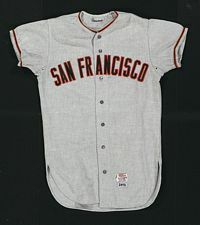 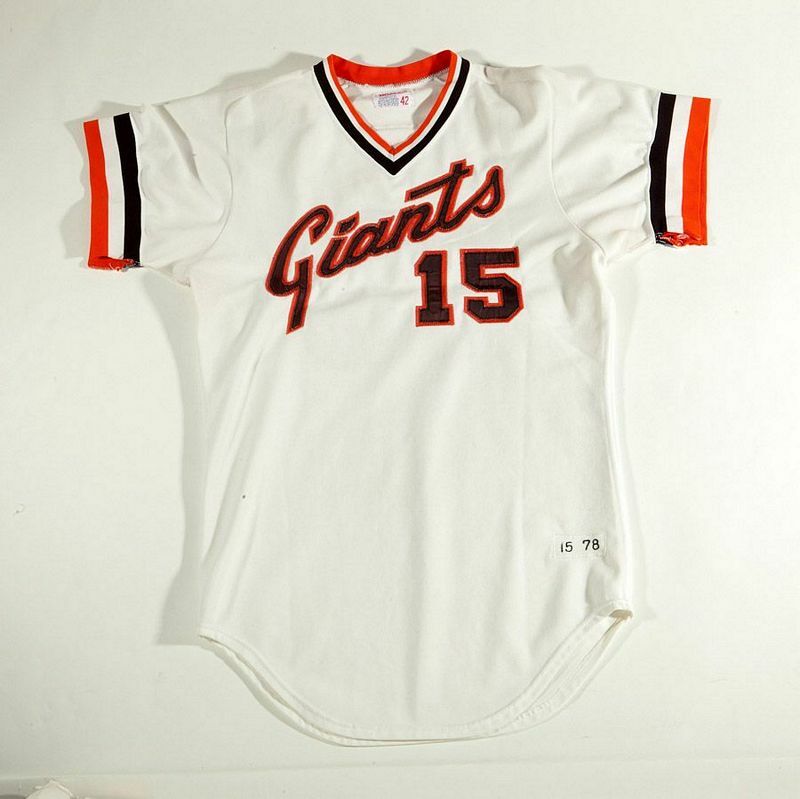 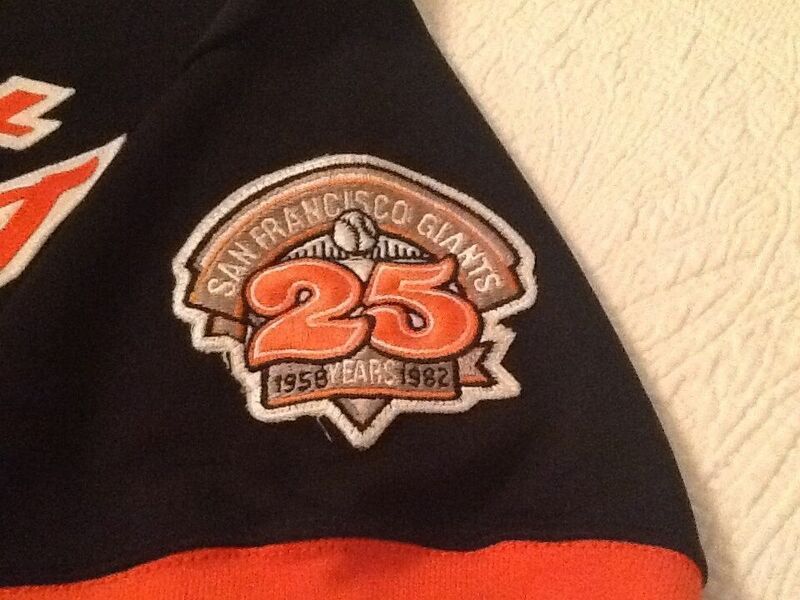 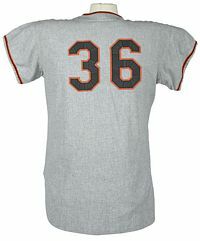 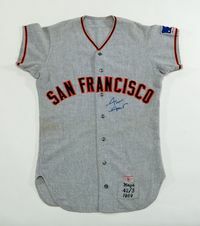 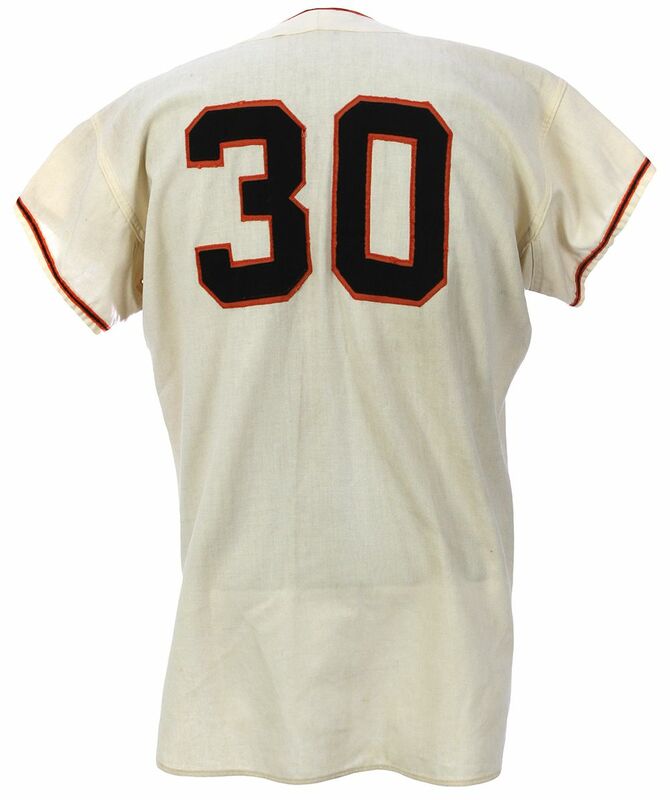 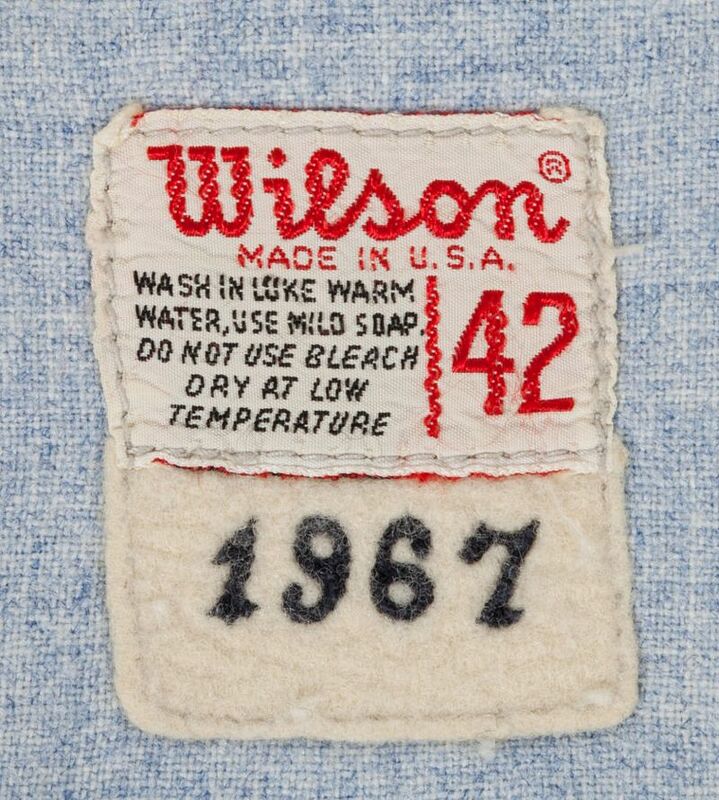 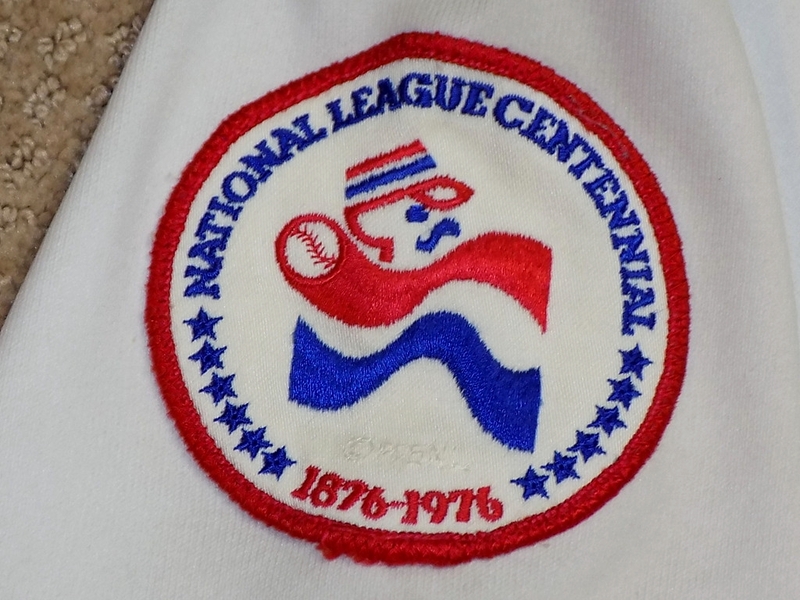 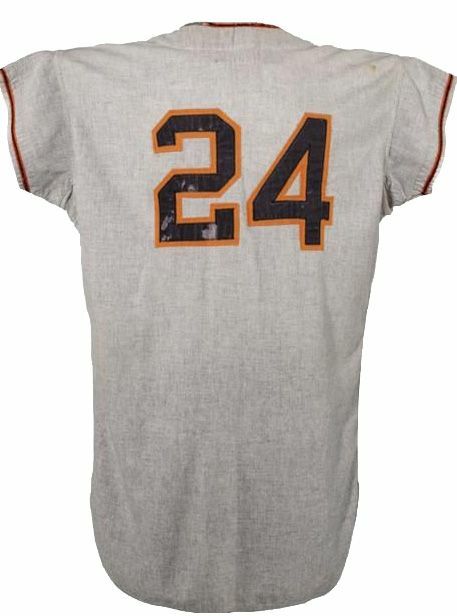 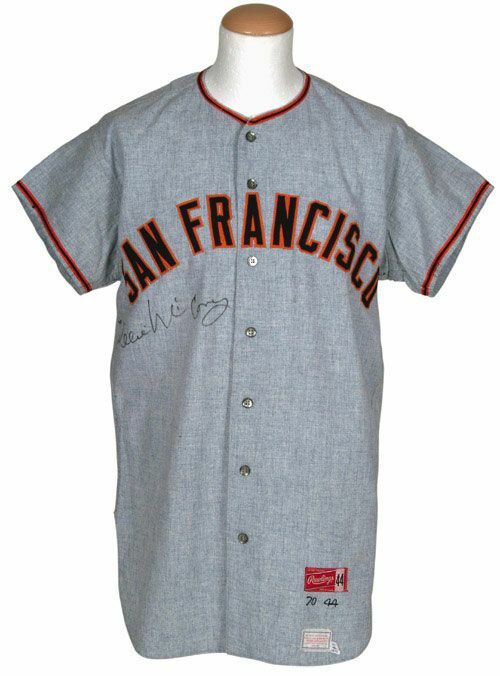 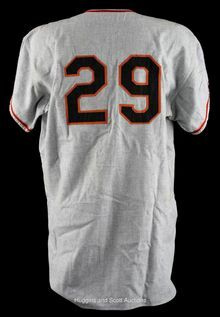 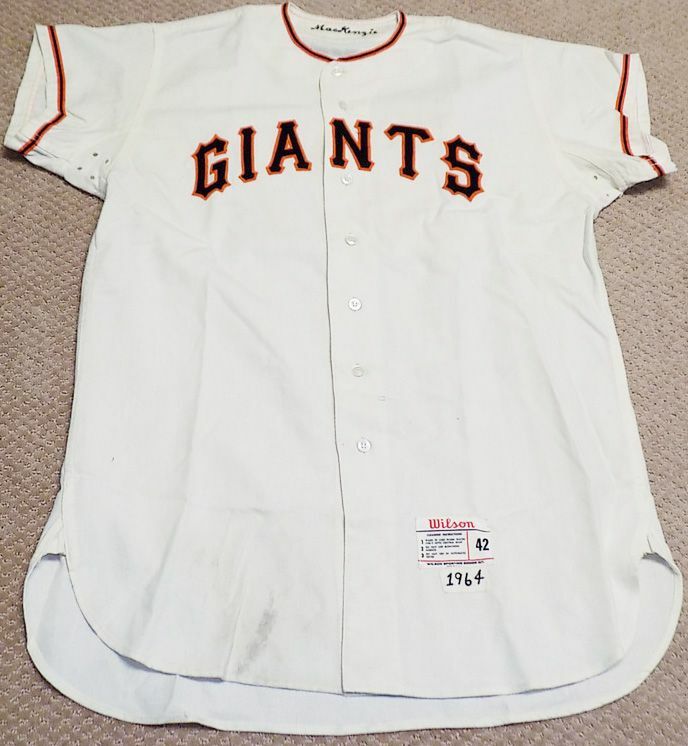 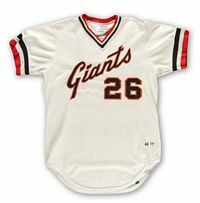 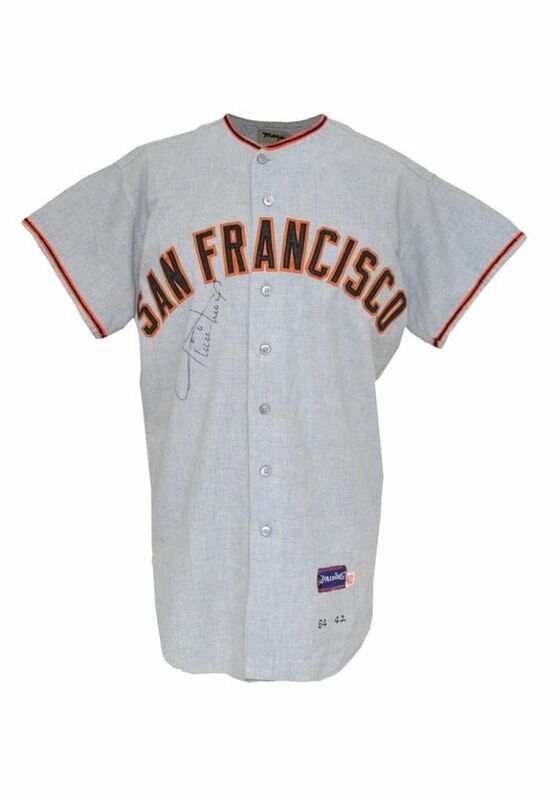 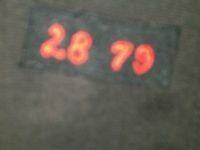 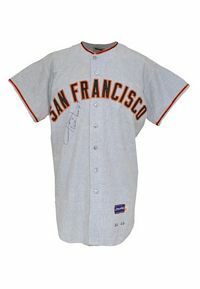 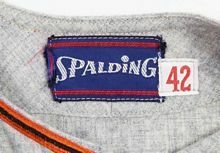 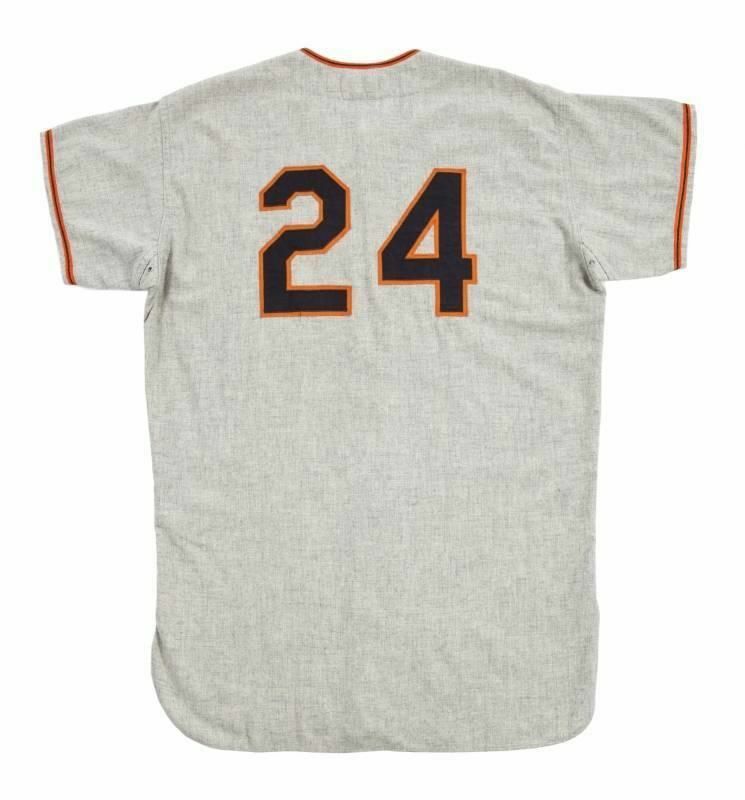 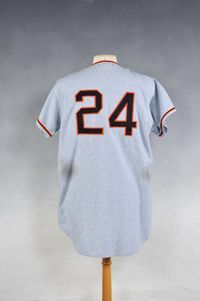 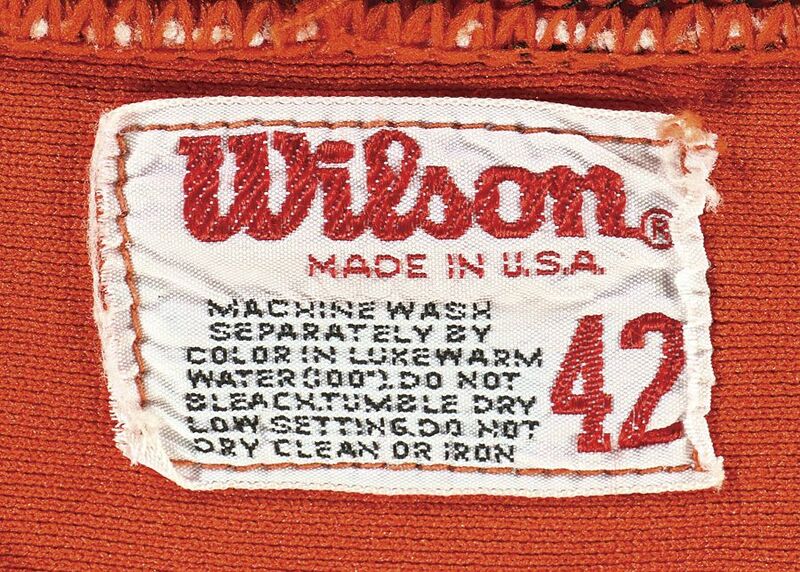 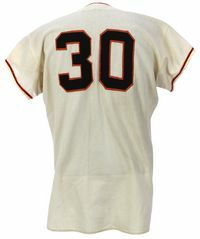 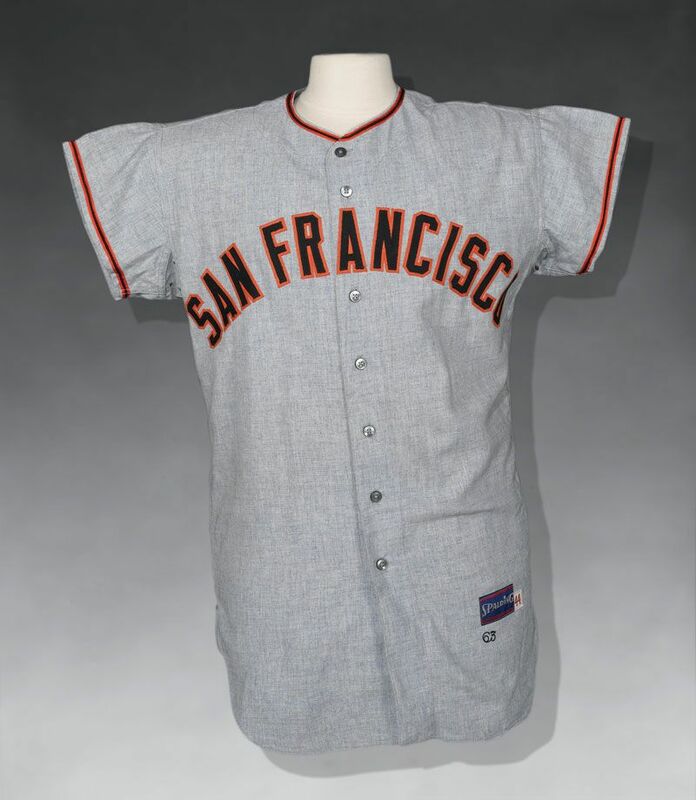 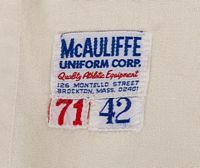 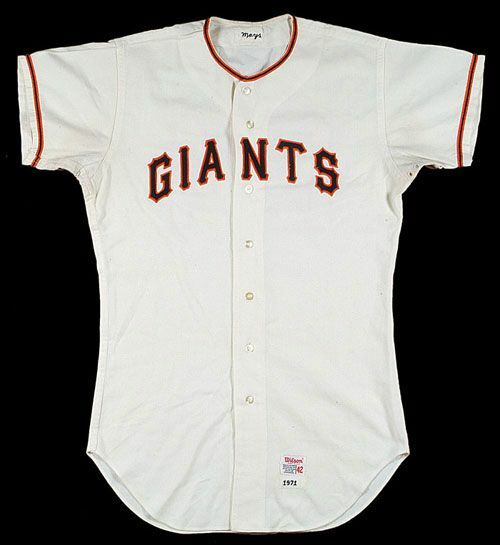 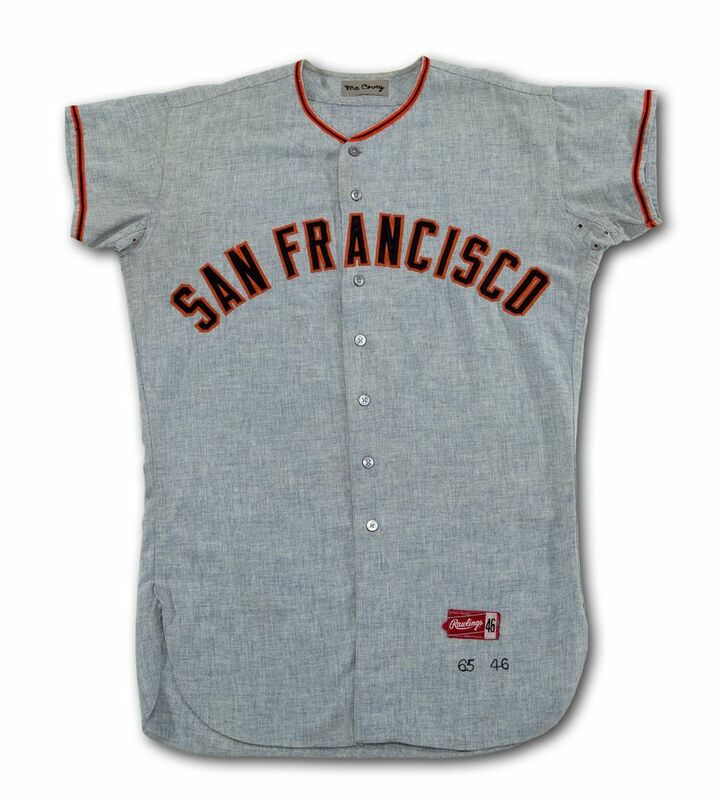 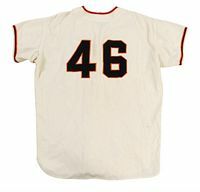 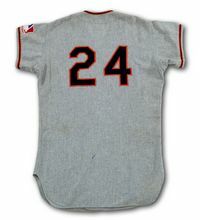 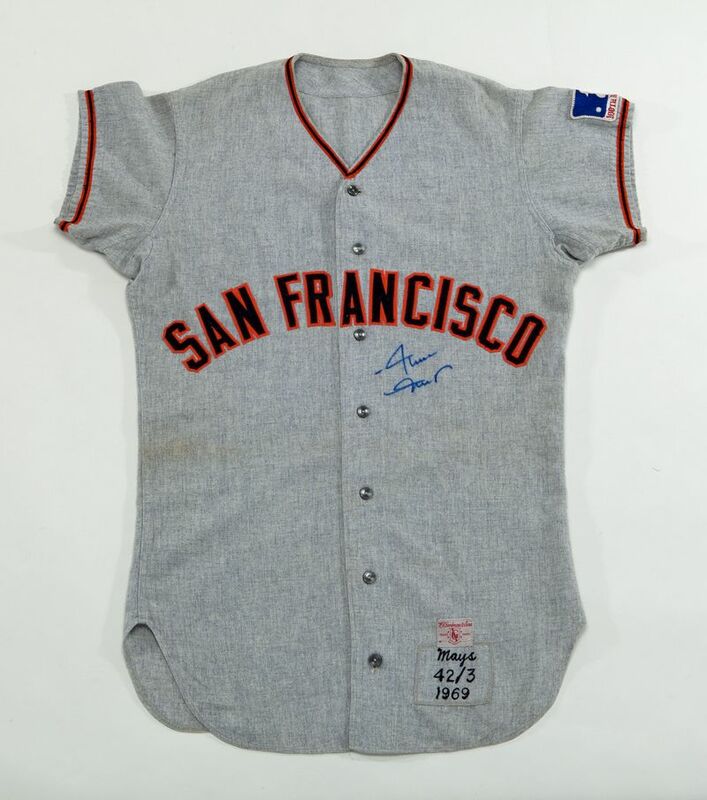 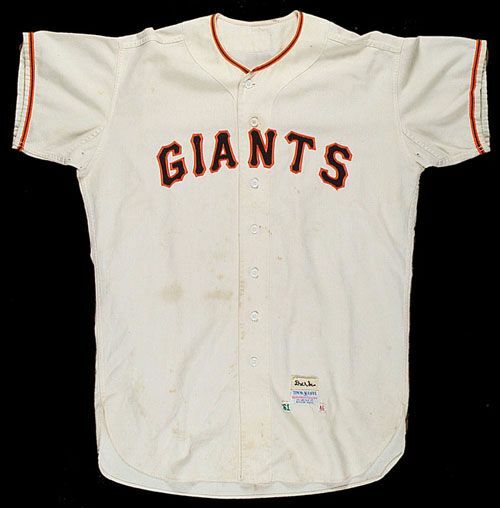 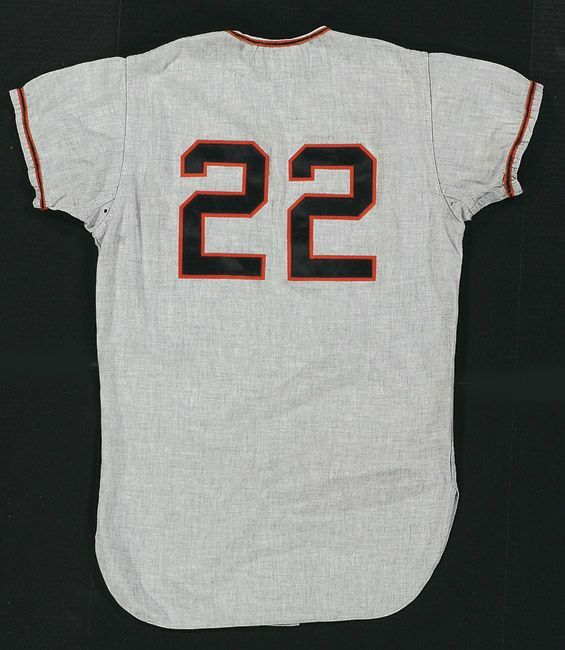 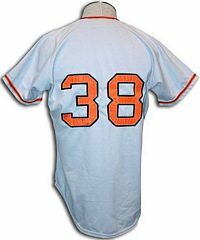 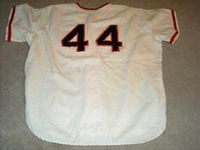 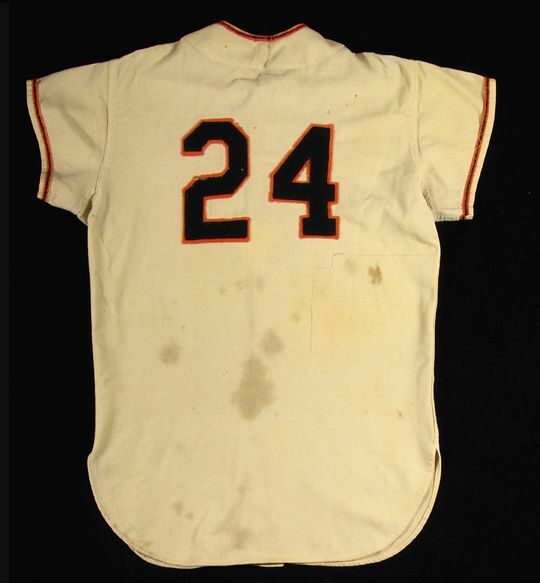 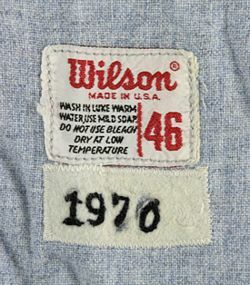 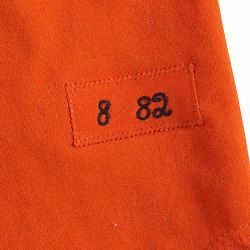 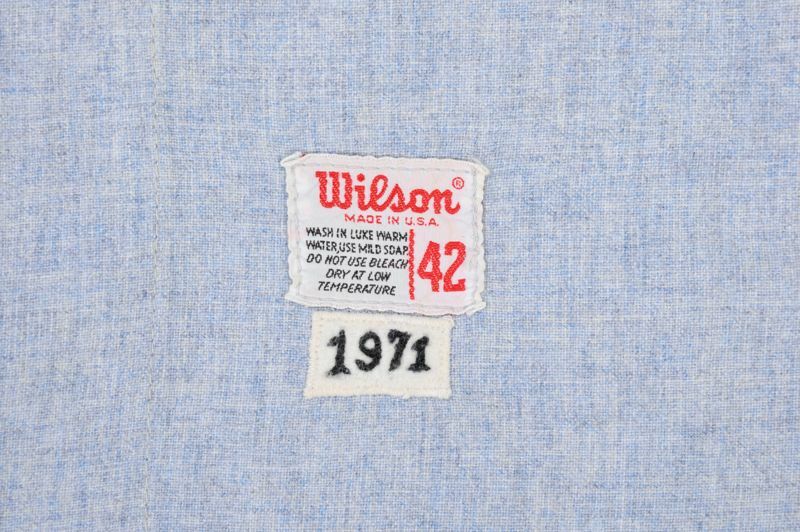 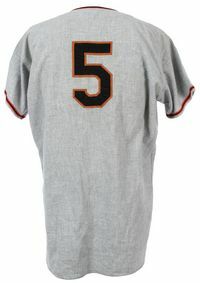 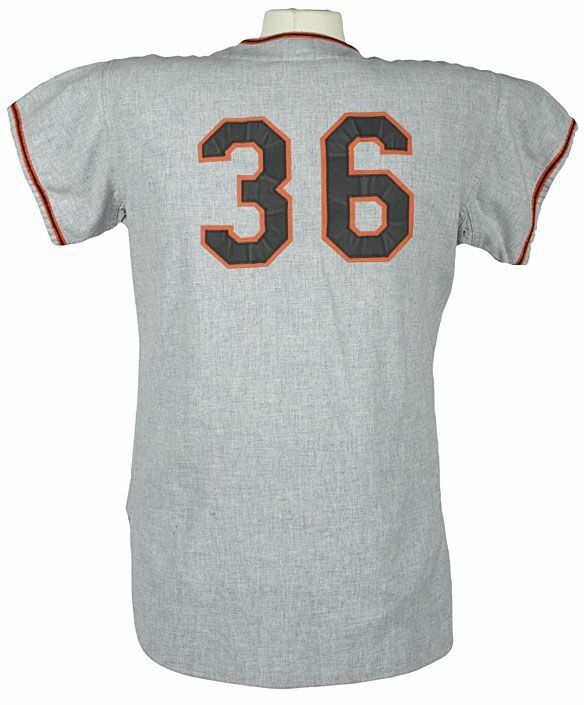 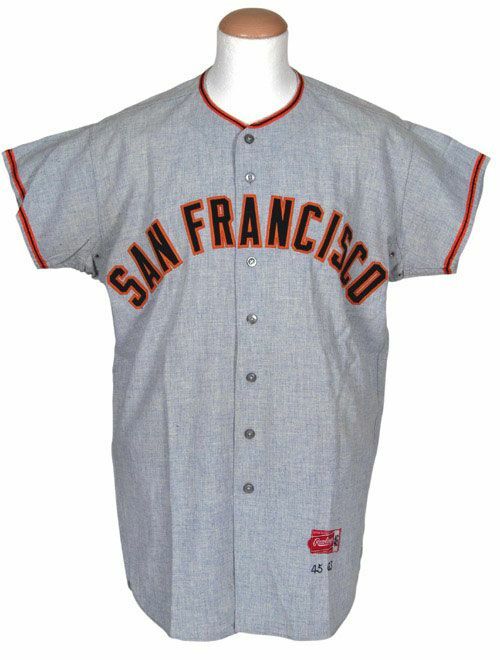 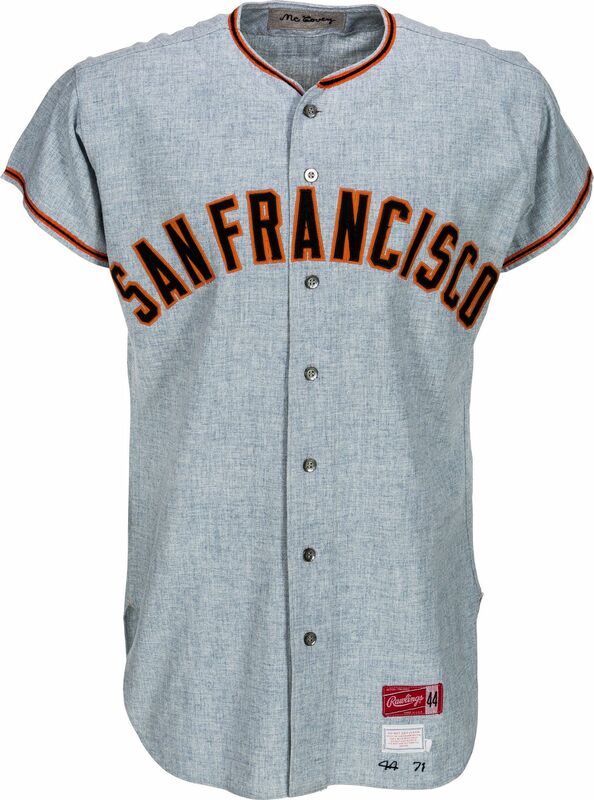 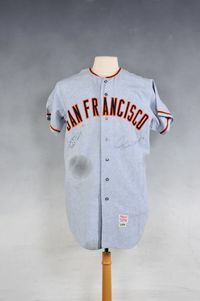 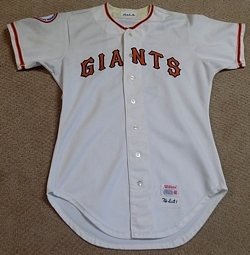 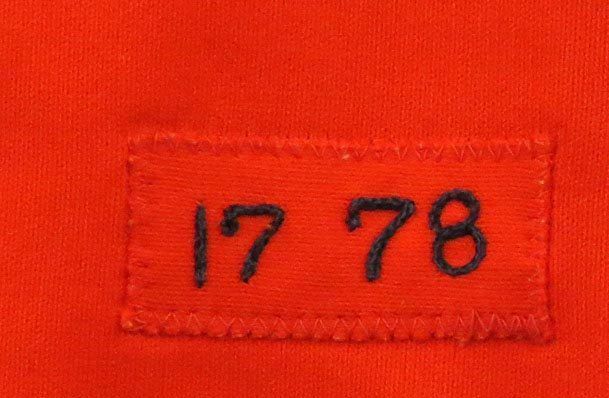 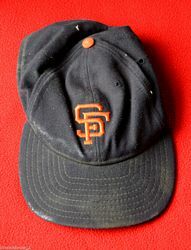 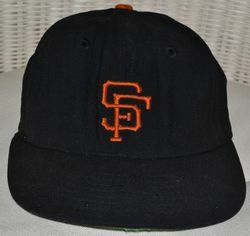 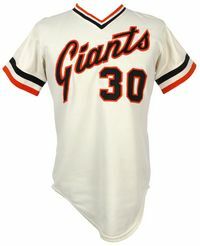 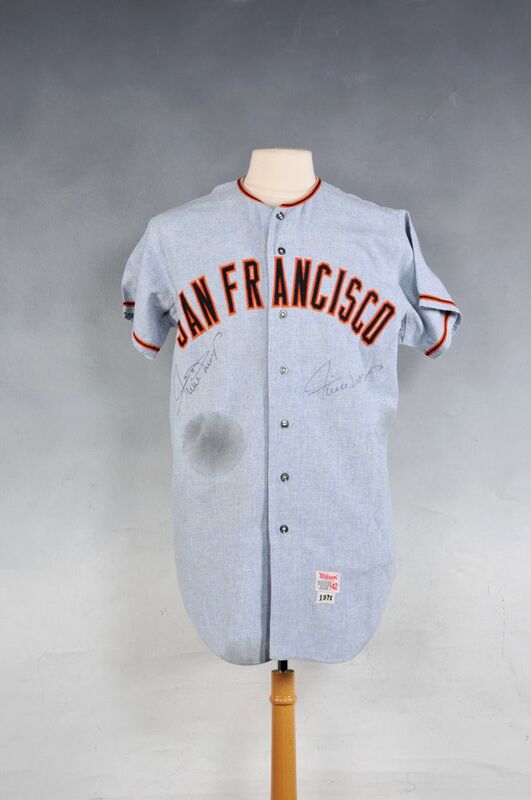 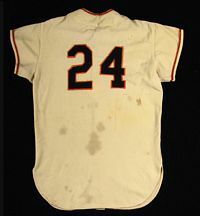 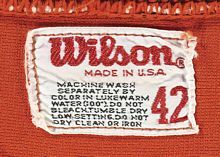 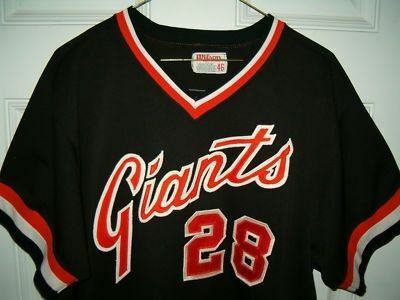 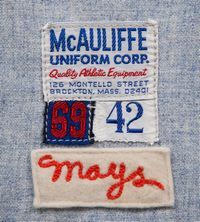 SF Giants 25th anniversary sleeve patch worn in 1982.